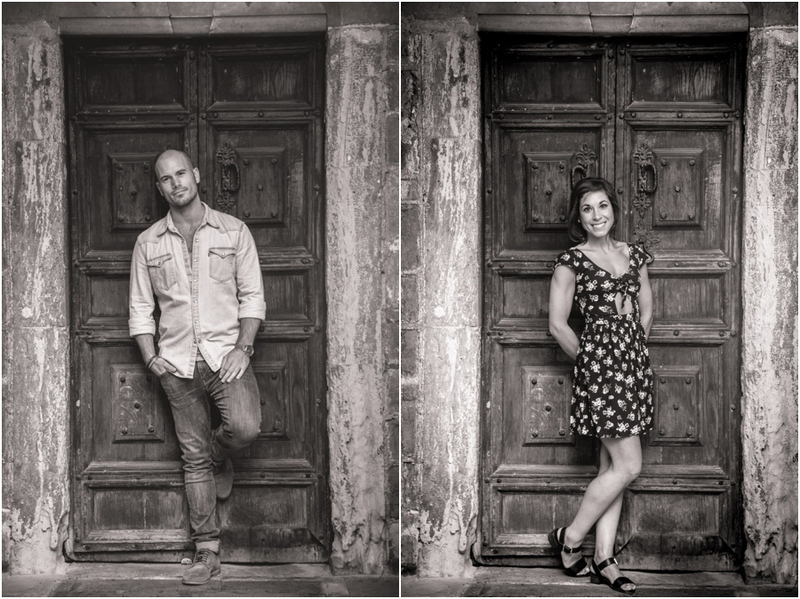 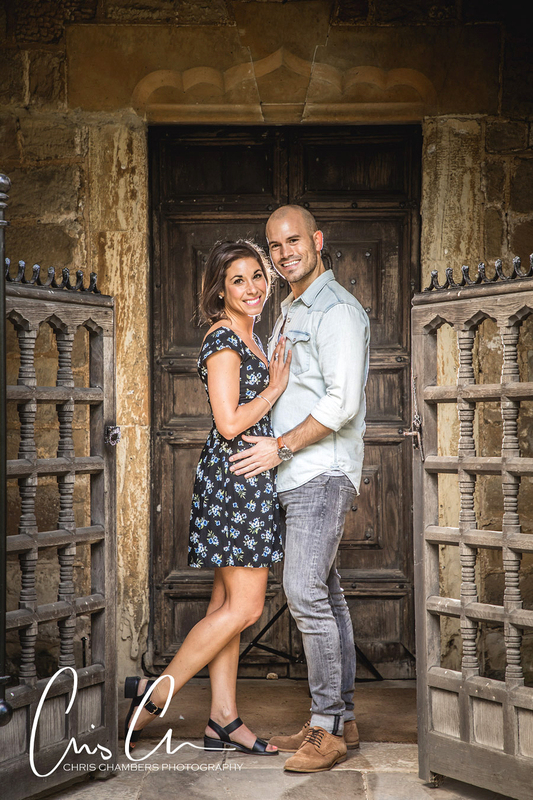 I recently caught up with Sara and Marc for their engagement photo shoot. 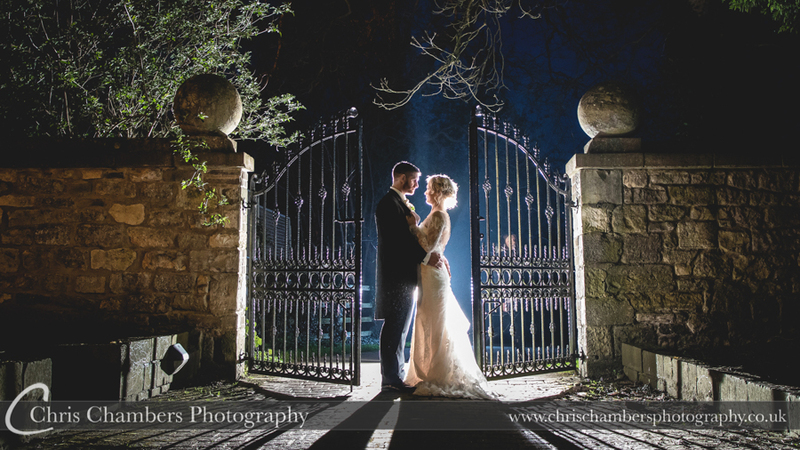 Marrying at All Saints church Ledsham near Leeds and celebrating in a marquee in the grounds of Sara’s parents home, we used little local knowledge to select a location for their pre-wedding shoot that would also allow us to look at locations we maybe able to use for their wedding photographs. 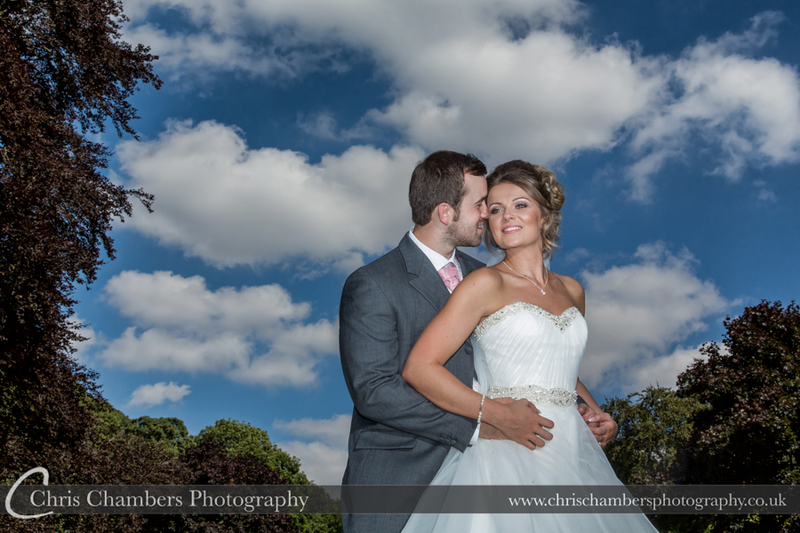 Stubton Hall near Newark in Lincolnshire was a new wedding venue for us to work at for the wedding of Nick and Gemma. 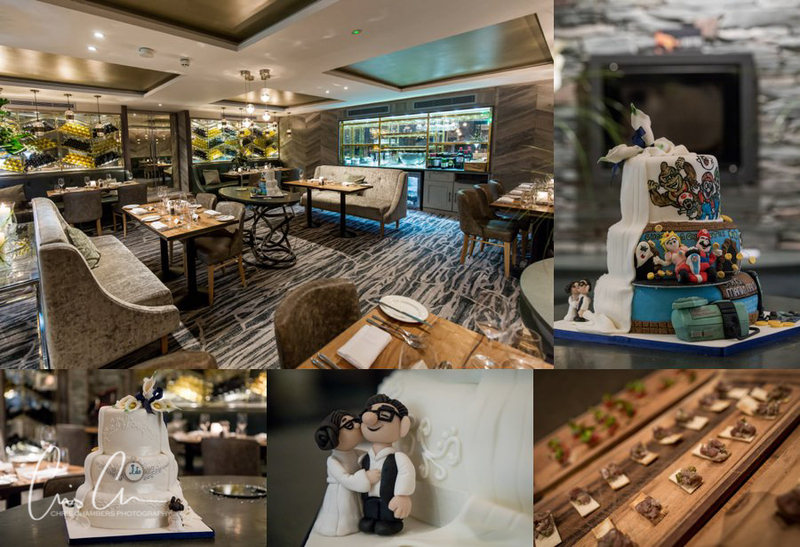 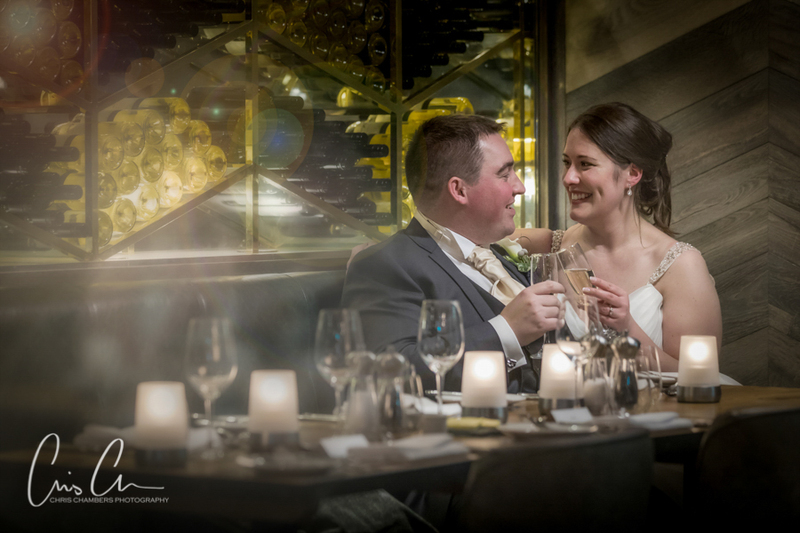 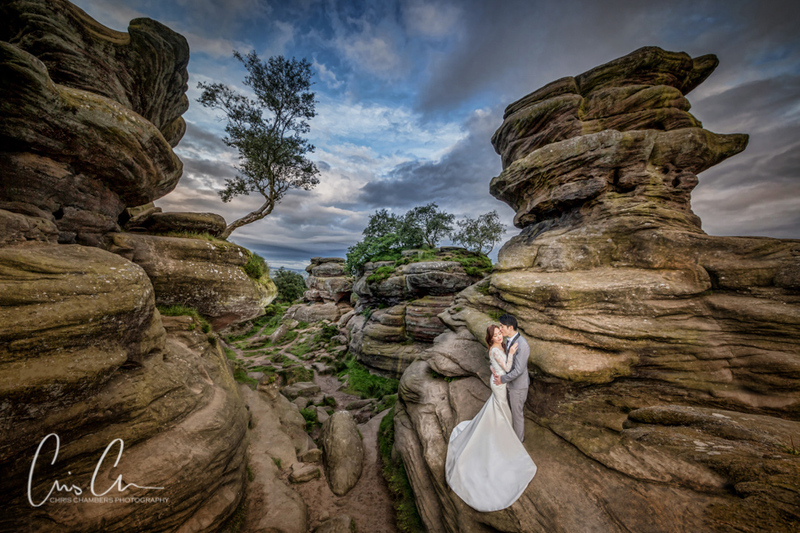 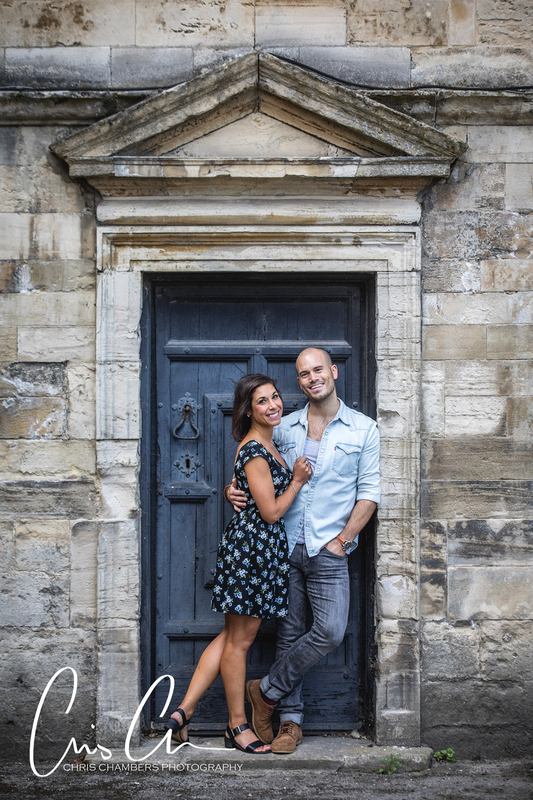 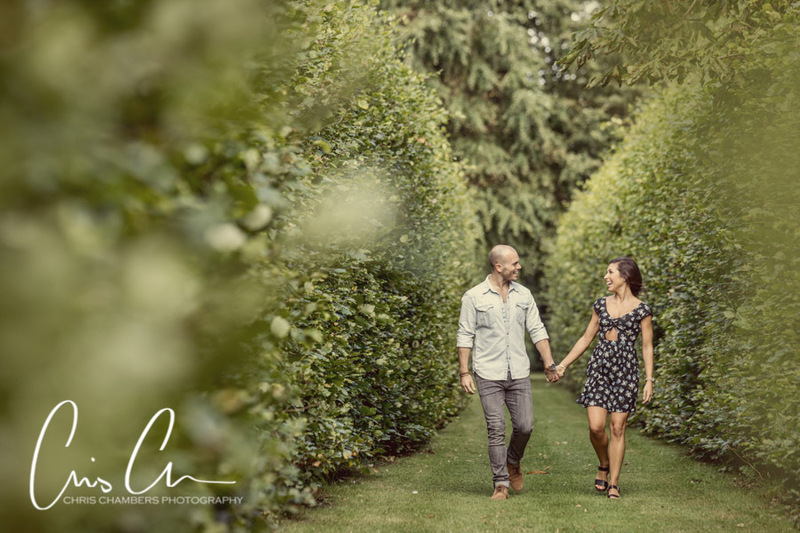 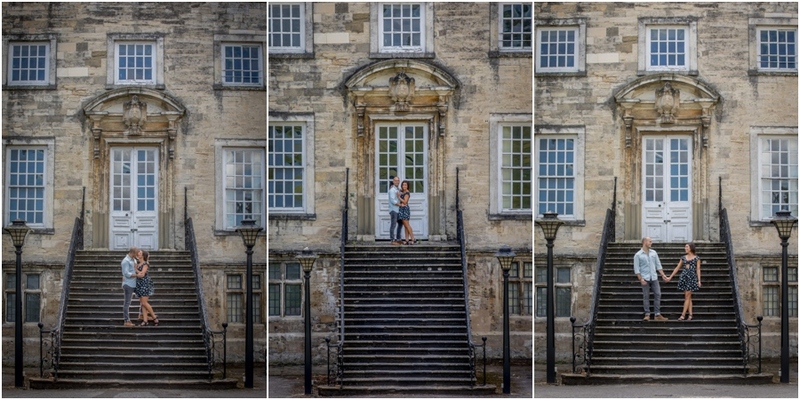 Following on from their recent pre-wedding shoot at the venue we were excited to work with new locations and try some different ideas to create their wedding photographs. 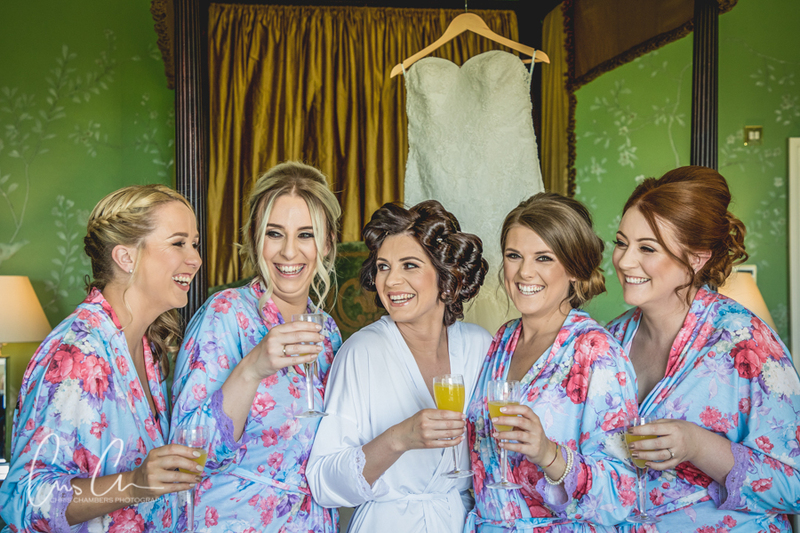 Our day started with bridal preparations as joined Gemma and her excited bridesmaids in the bridal suite at Stubton Hall. 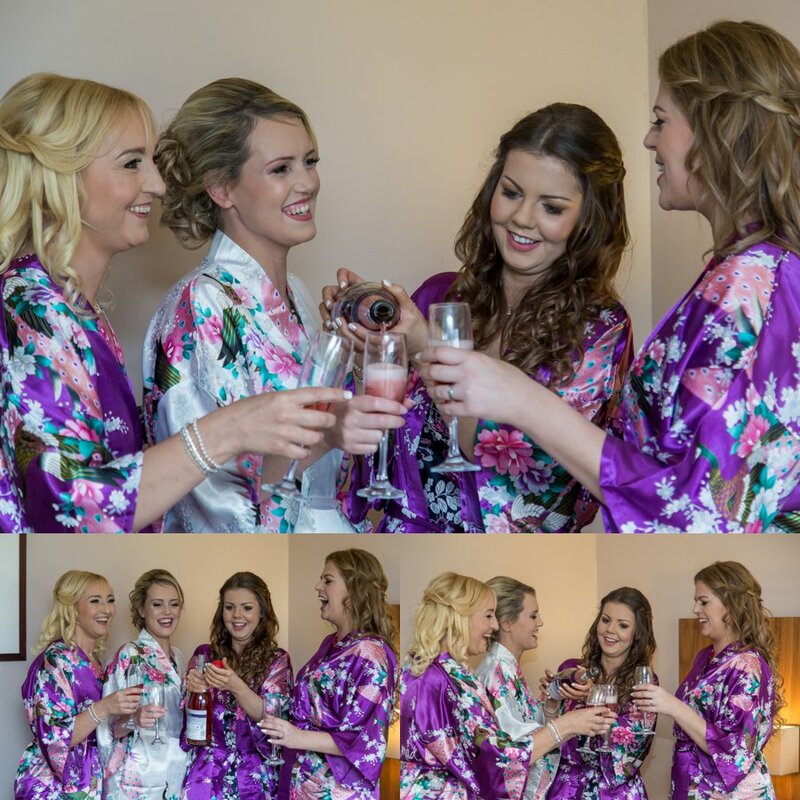 The large room was ideal for the set up of various preparation stations with hair and make up for the ladies taking place in the same room. 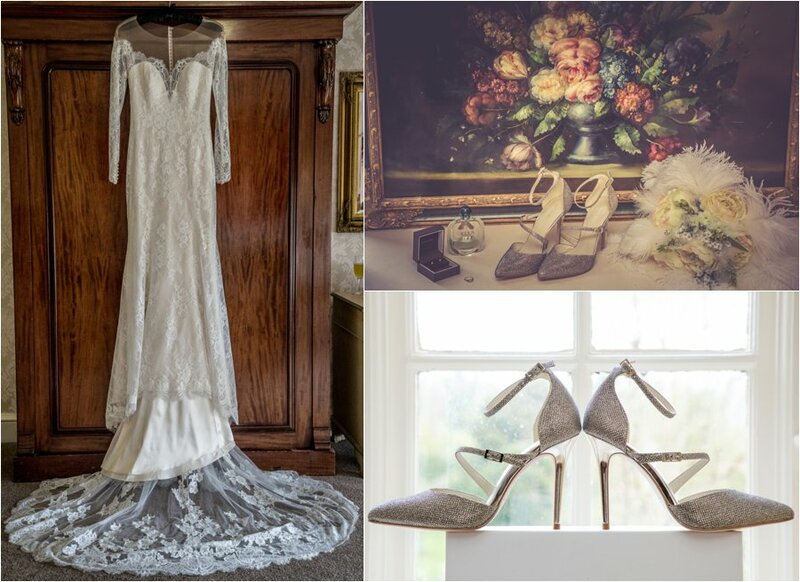 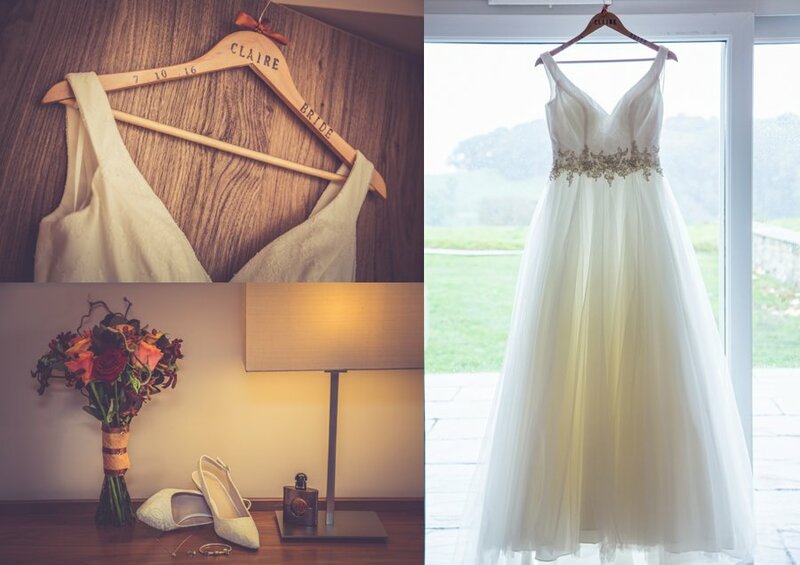 During the prep phase we were also able to photograph the wedding details, wedding dress, wedding shoes, etc. 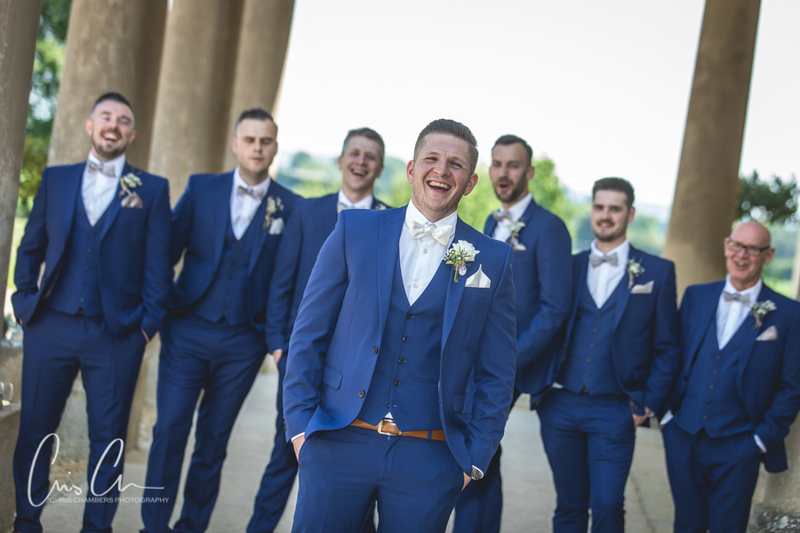 Nick and the groomsmen were getting ready in one of the adjacent rooms and we caught up with them downstairs for a number of photographs with the groomsmen before the wedding ceremony. 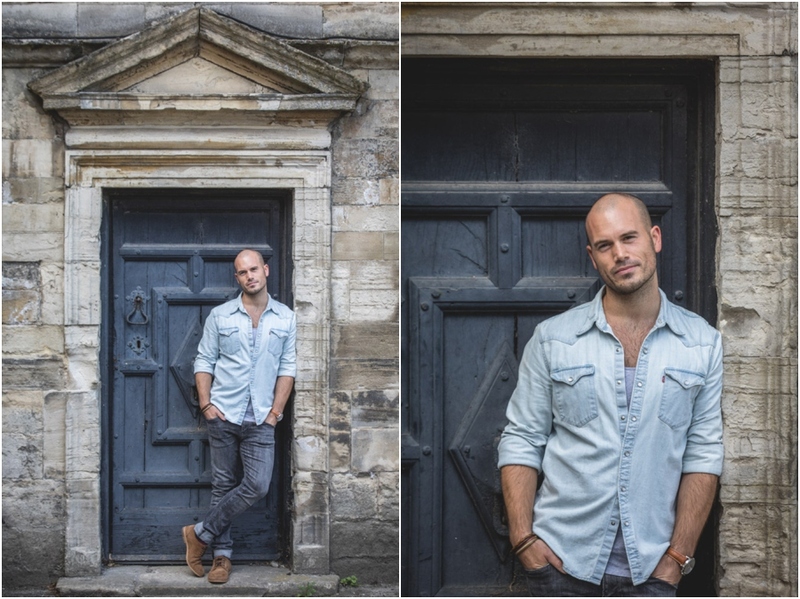 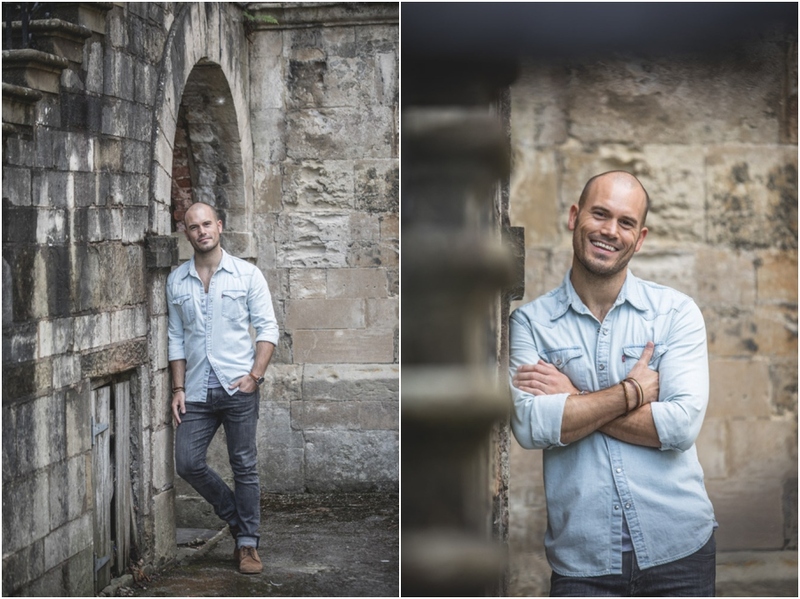 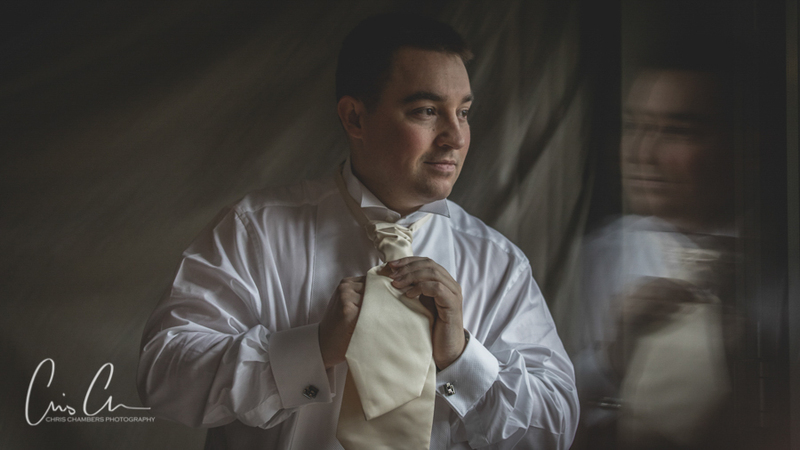 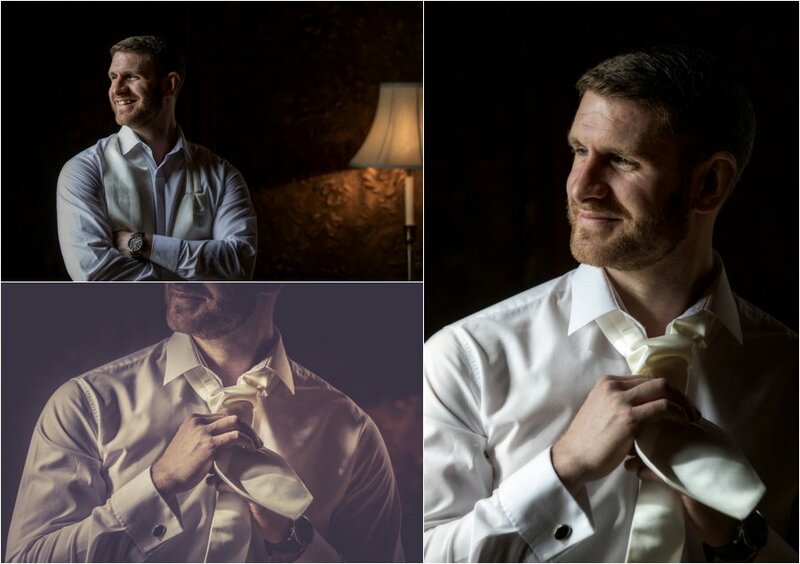 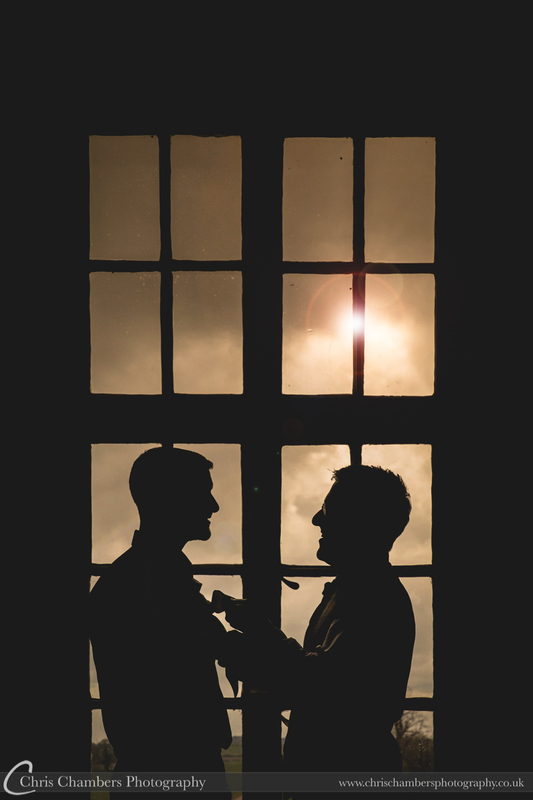 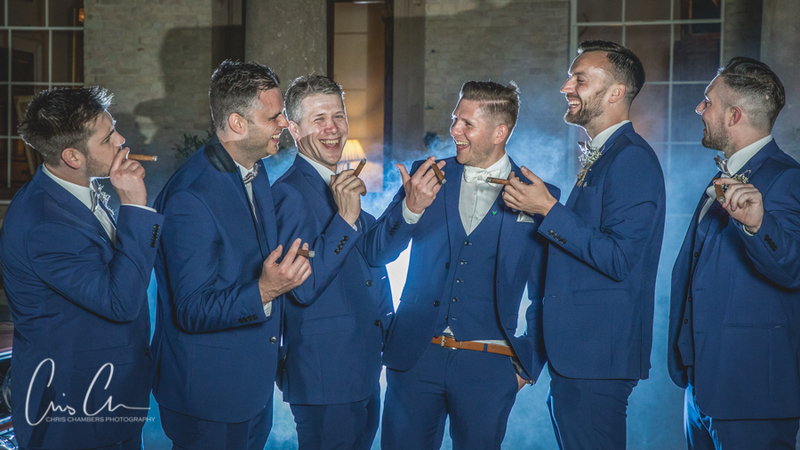 During the pre-wedding shoot I’d seen several locations inside that I knew would suite my style and help create some strong wedding photos of the groomsmen so was keen to try these out. 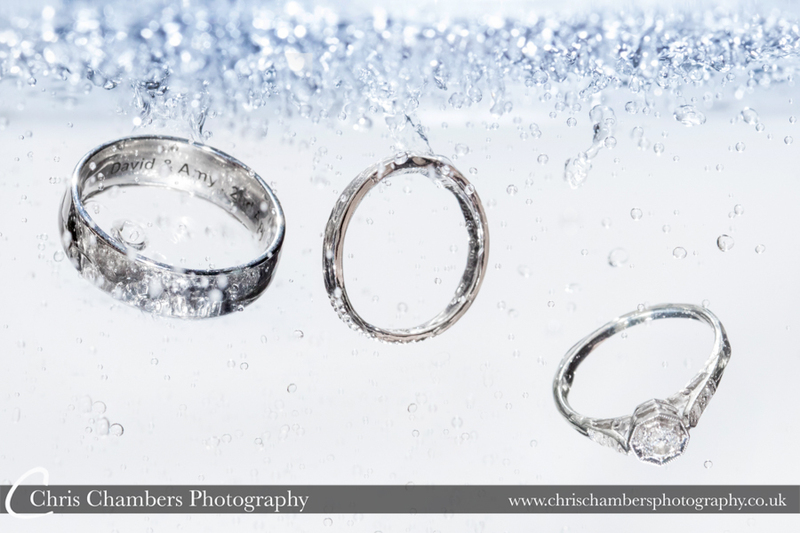 thankfully they worked well! 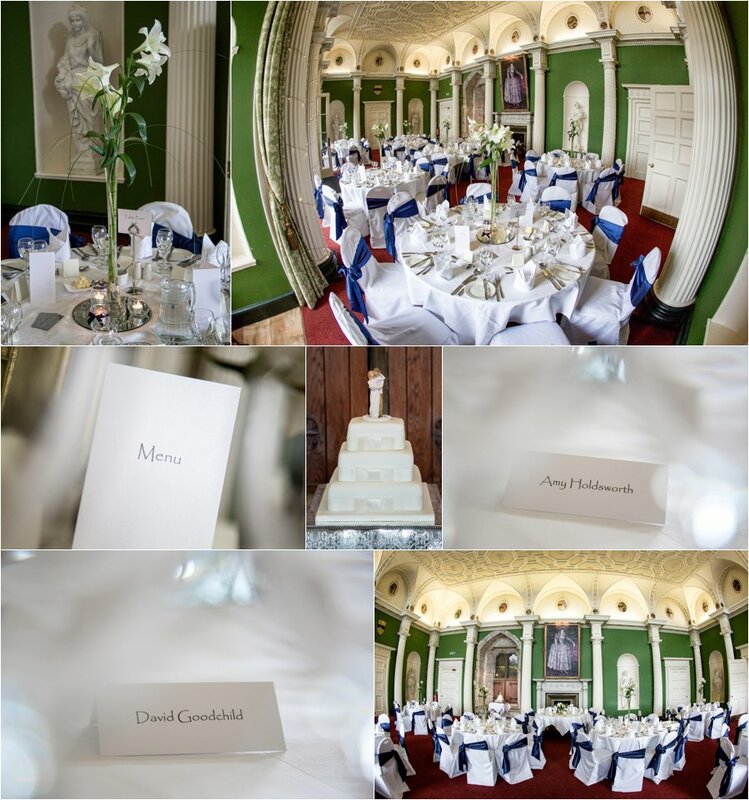 The wedding ceremony took place in the Music Room before the drinks reception out on the rear terrace. 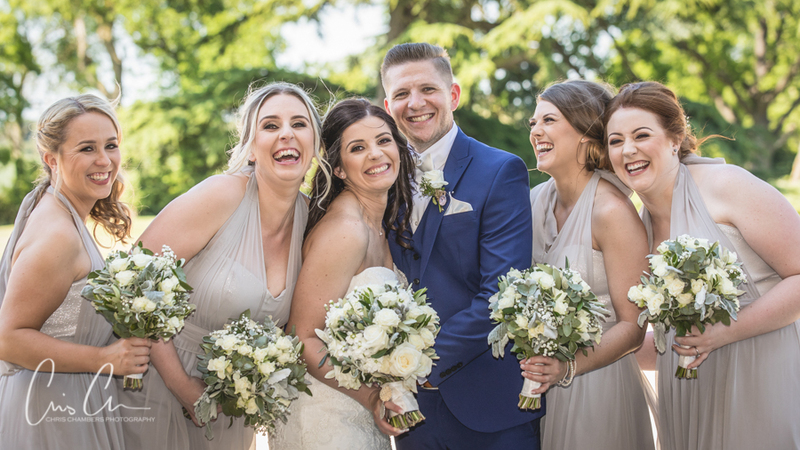 Blue skies and a Prosecco box helped ensure spirits were high and everyone was enjoying themselves whilst we quickly completed the group photographs Nick and Gemma had requested. 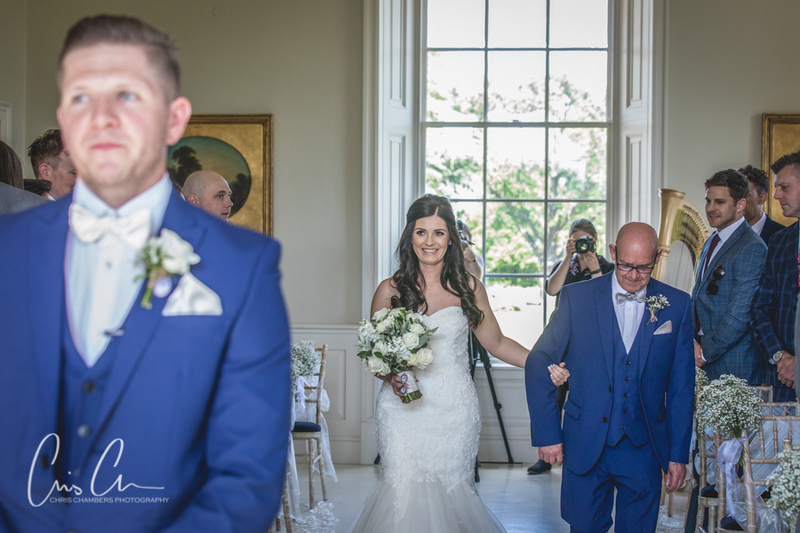 Before wedding breakfast in the Orangery we quickly completed a couple of wedding photographs with Nick and Gemma with the plan to complete the remainder after the meal when it would have also cooled down a little. 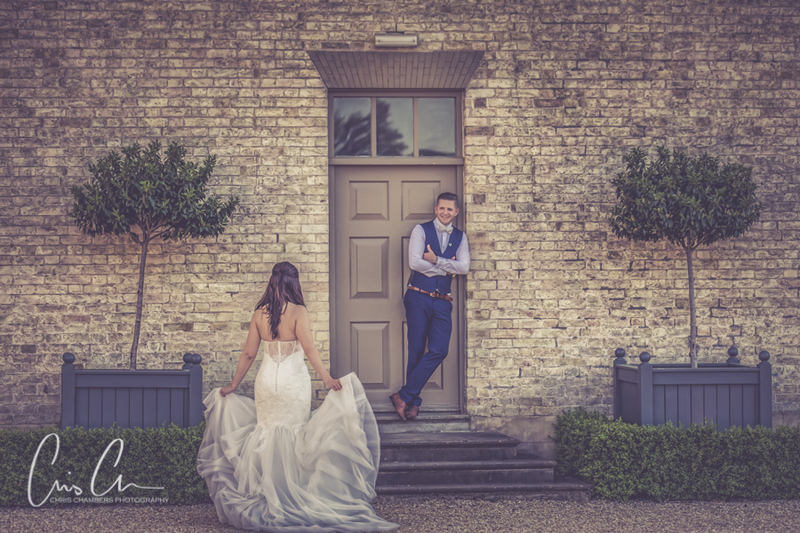 Again we had several locations planned and ideas so we were able to quickly run through a number of photographs with Nick and Gemma both inside and out before their evening guests arrived. 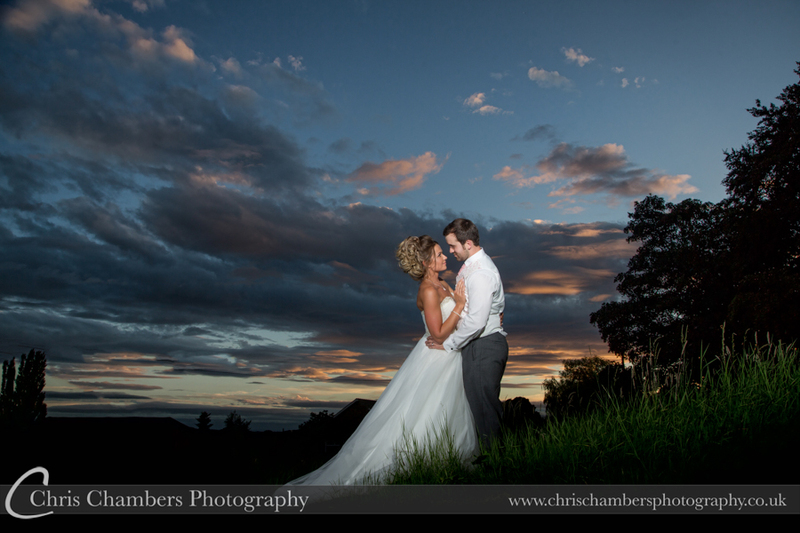 Blue skies and sunsets don’t always mix well and today was just one of those days, the sun dipped below the horizon without any real explosion of colour, all the same we still found a location overlooking the north west and the sunset. 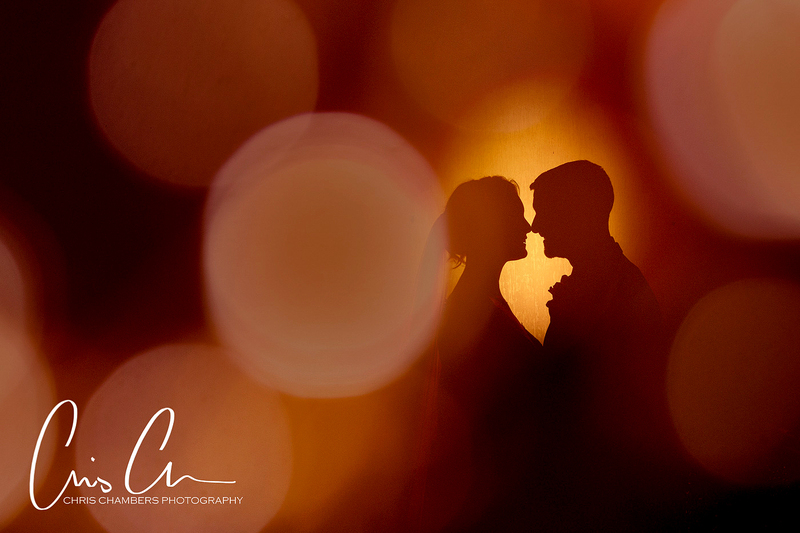 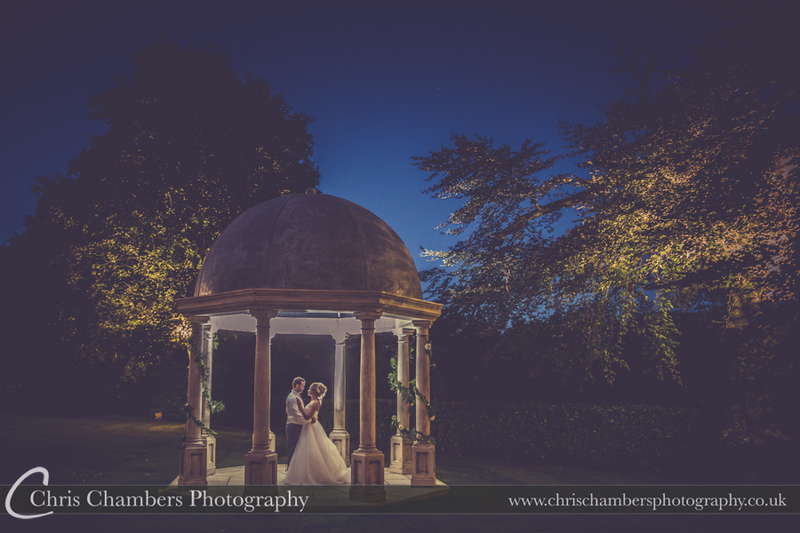 Our final photo session was during twilight, Gemma and Nick’s wedding package included twilight photographs. 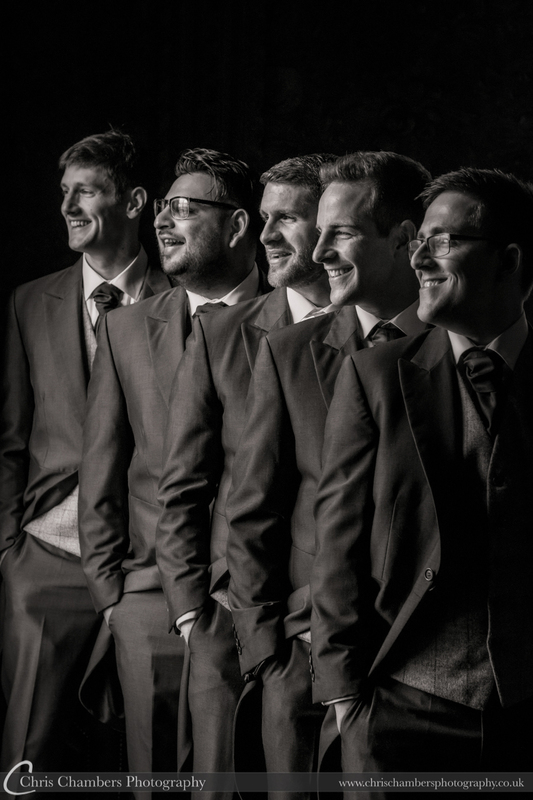 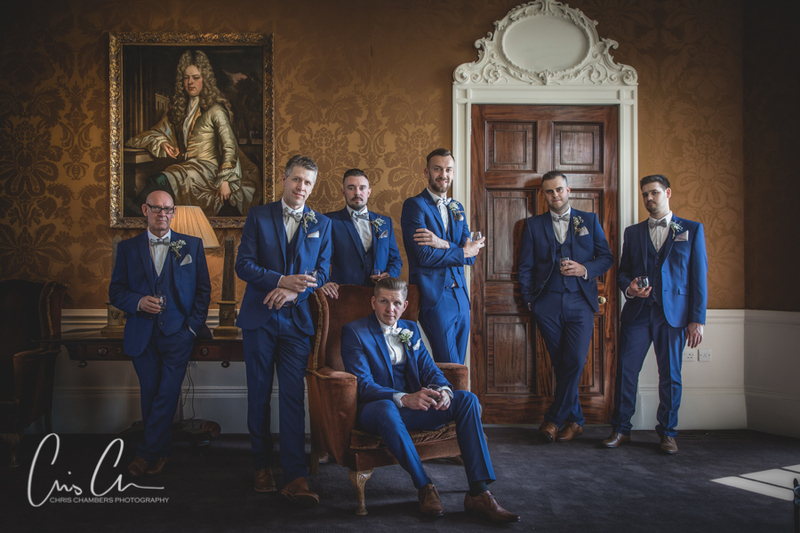 The first of these was with the groom and groomsmen with cigars before we took Gemma and Nick off for a final couple of minutes of photos. 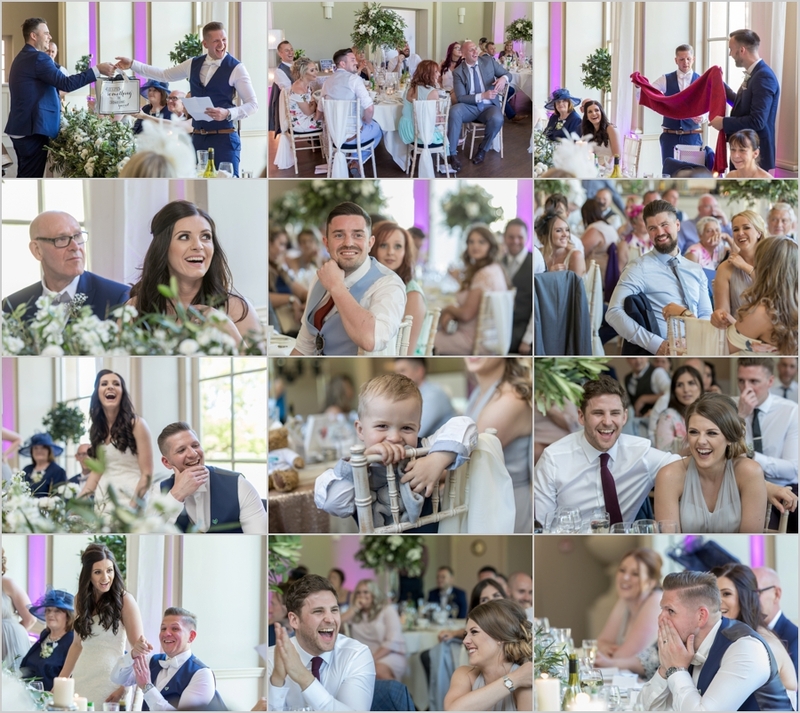 The following blog post contains many of the photographs we played on the large screen slideshow during the evening reception. 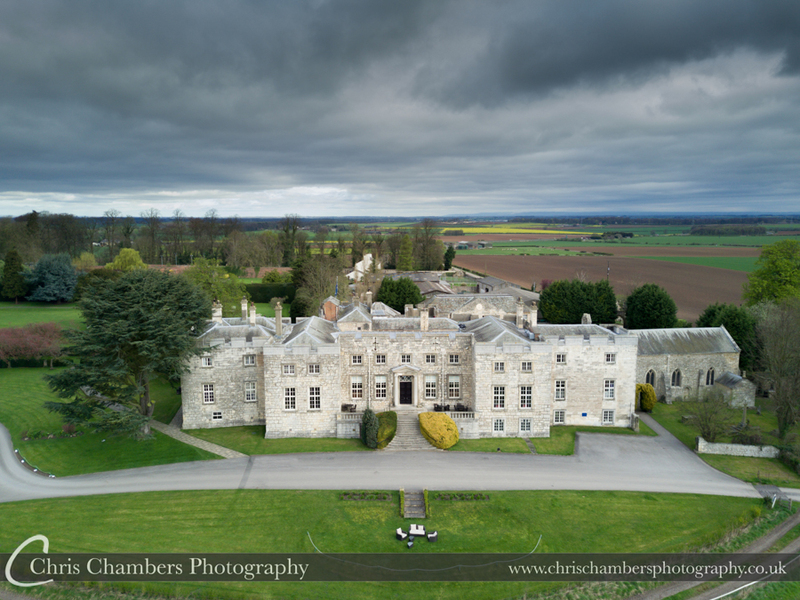 Stubton Hall, the distinctive rear lake and grounds. 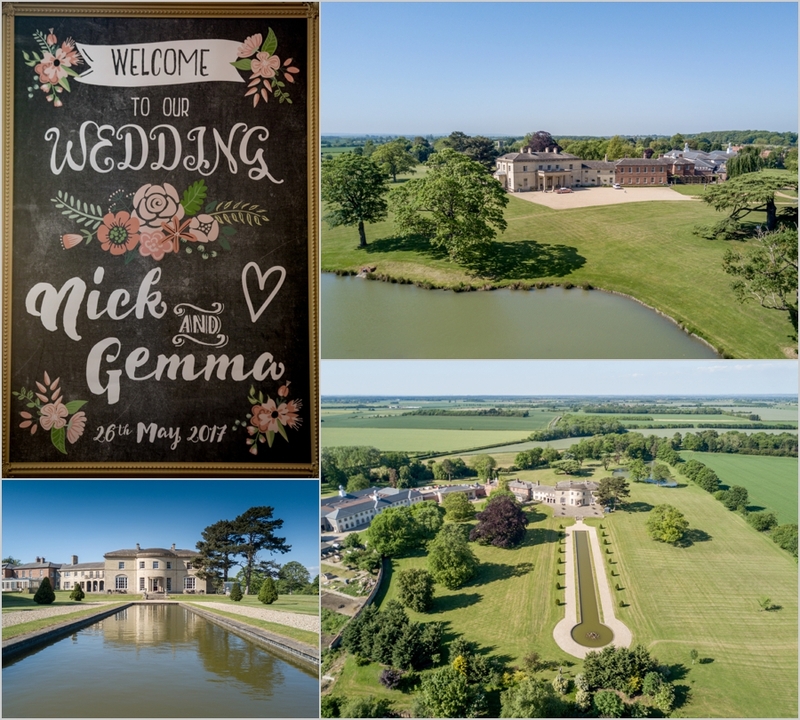 Although only a few miles from the A1 and Newark, the aerial photographs show the stunning location of this wedding venue. 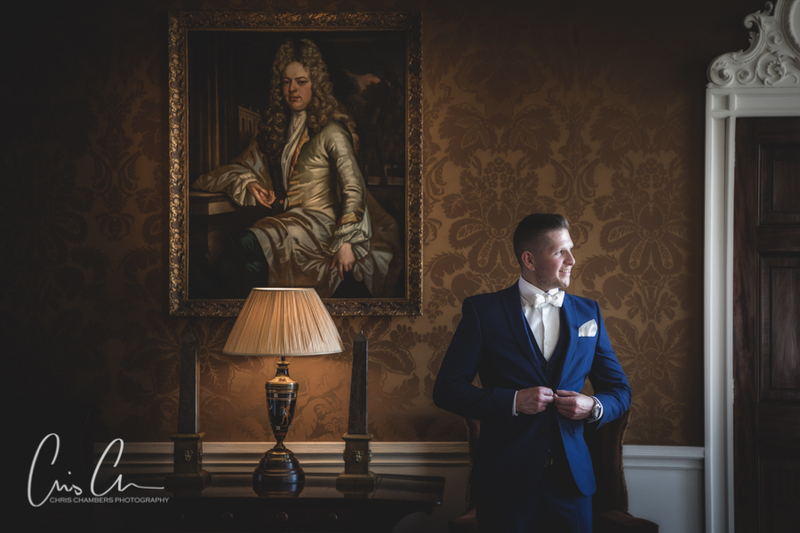 One of the locations inside Stubton Hall I’d seen during the pre-wedding shoot and one I knew would work well for photographs of the groomsmen. 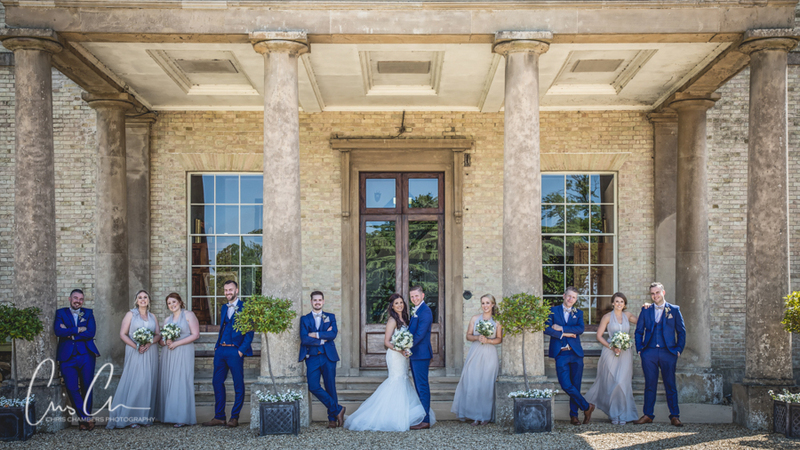 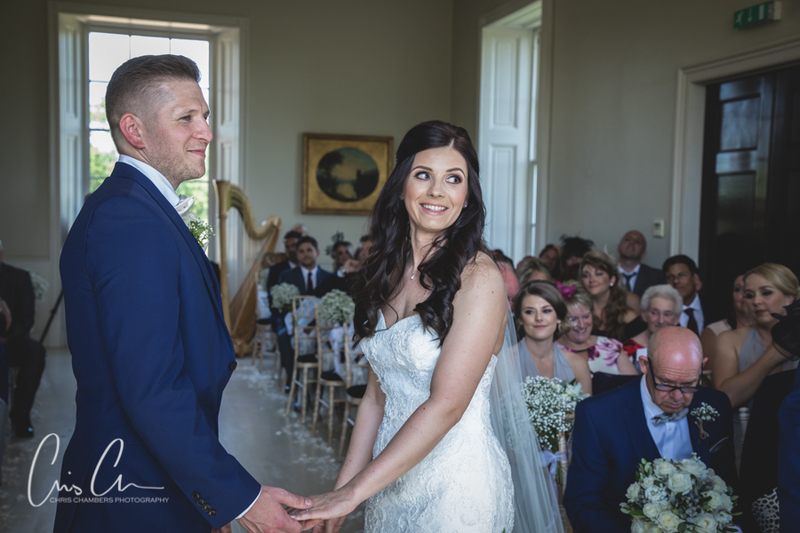 The wedding ceremony took place in the Orangery, large windows and a bright interior made this room ideal for photography. 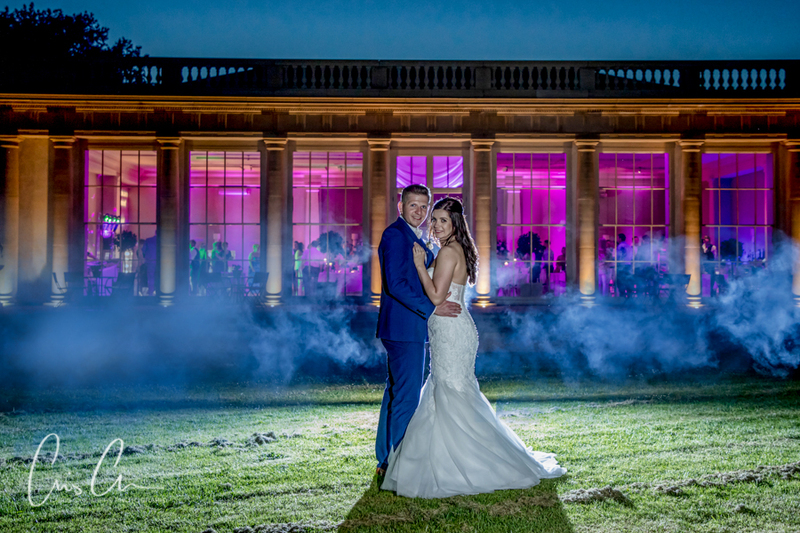 Stubton Hall’s Orangery set for the wedding breakfast. 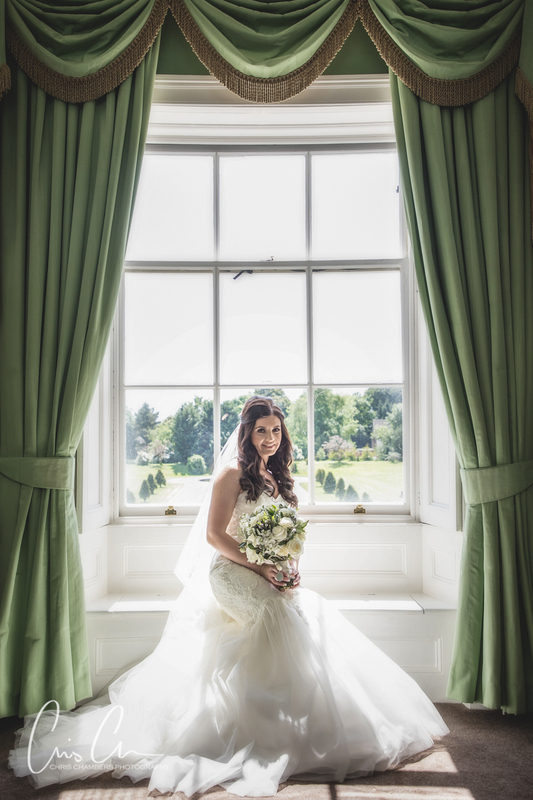 Large windows created a bright and airy feel and like the music room really helped with photography. 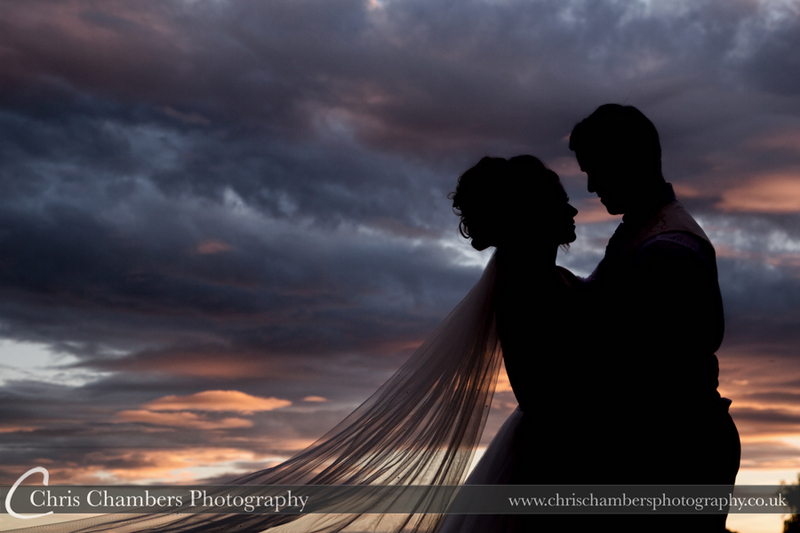 Although no big flaming skies, we managed a few wedding photographs at sunset. 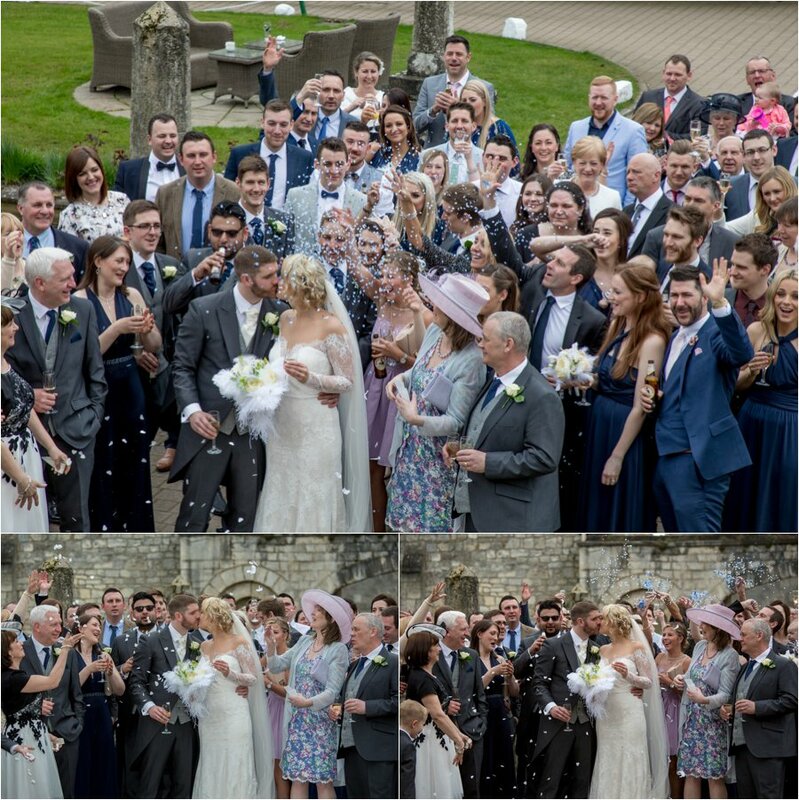 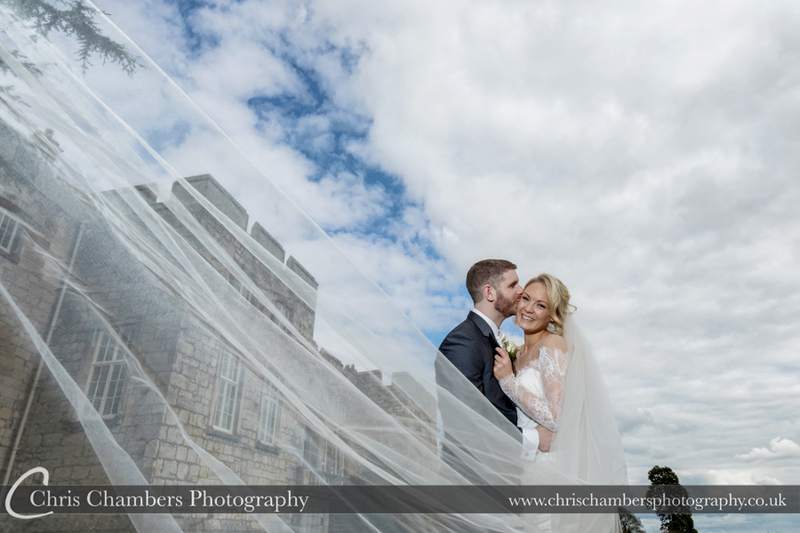 Amy and David were married recently at Hazlewood Castle in Yorkshire. 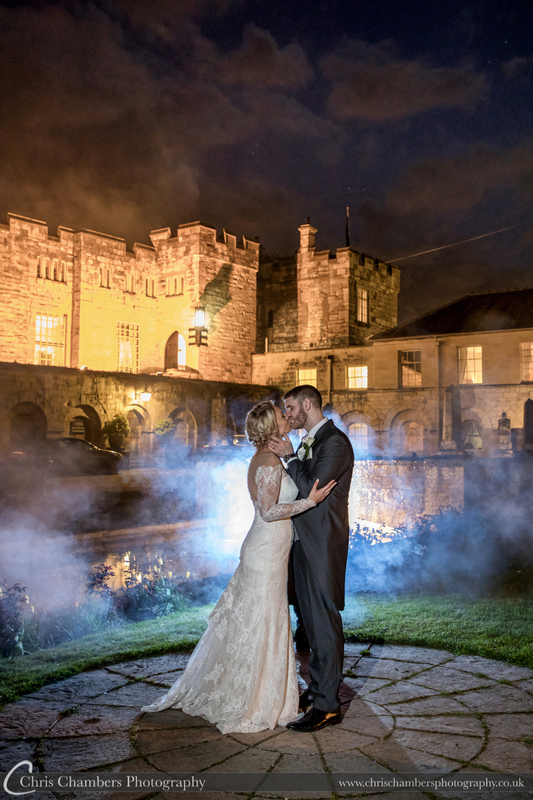 The historic castle is one our favourite wedding venues and as a recommended supplier of the castle we are lucky enough to photograph a number of weddings there each year. 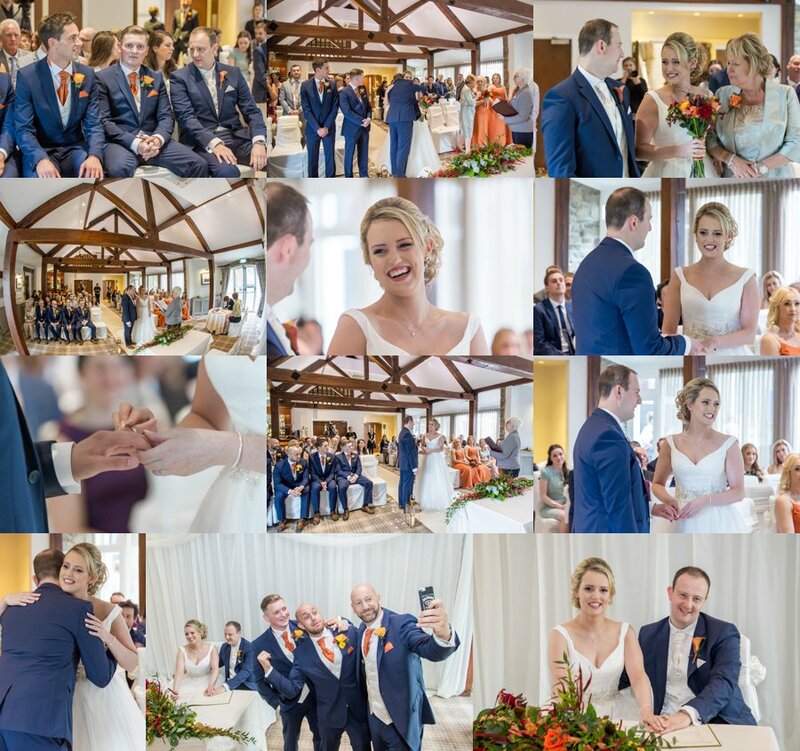 Amy and David chose a civil wedding ceremony in the Old Dining Room, our day began a few hours before this for preparation photographs with both Amy and David. 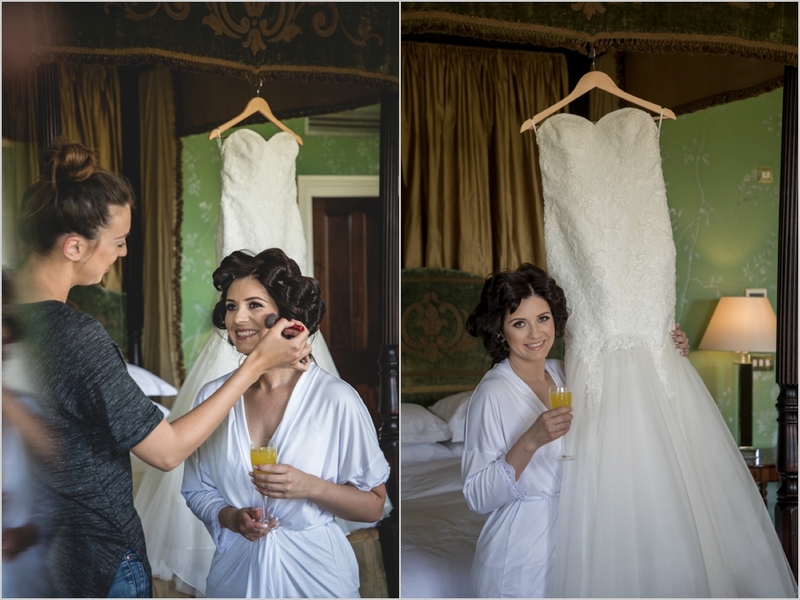 Both the bride and groom were getting ready at Hazlewood Castle so we took the opportunity to cover preparation of them both. 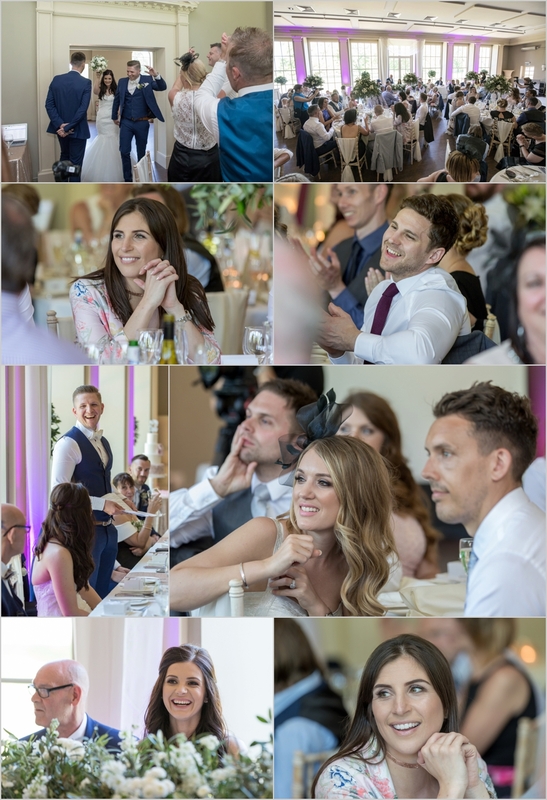 The photographs below include many we showed on our large screen slideshow during the evening reception. 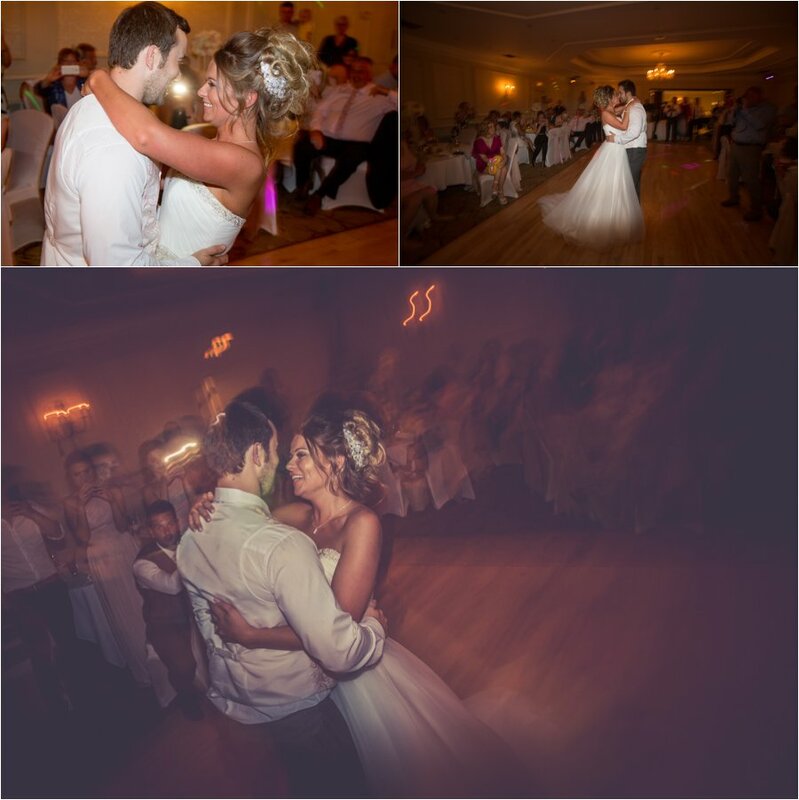 the slideshow is included with all wedding photography packages. 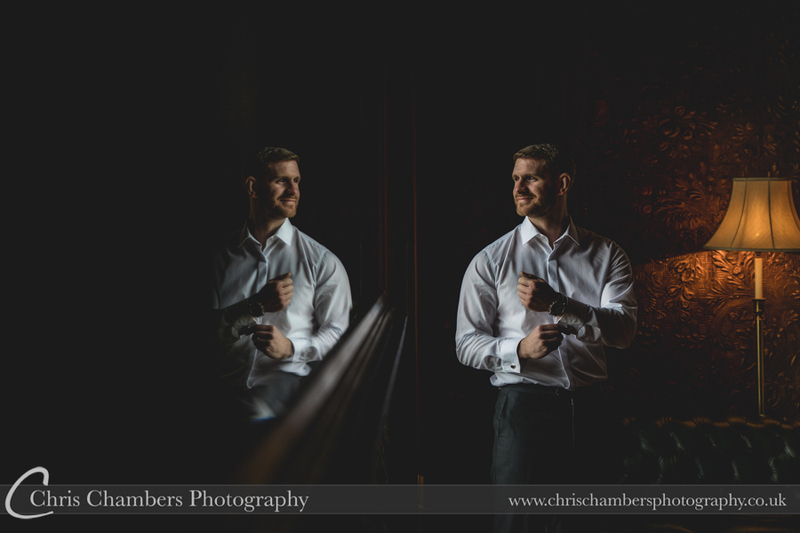 With David also getting ready at Hazlewood Castle it was a good opportunity to capture some photographs of the guys preparing and finishing off dressing ahead of the wedding ceremony. 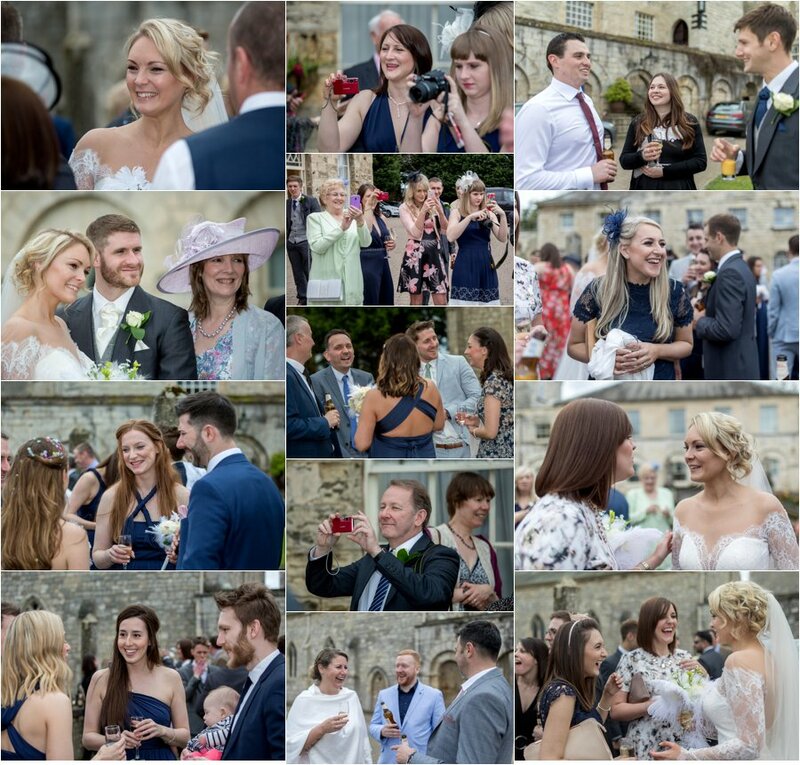 Drinks reception was in the courtyard at the castle. 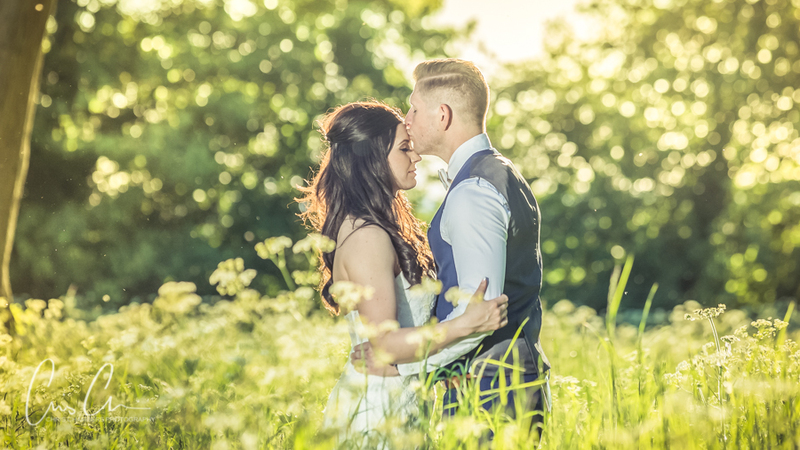 The weather thankfully allowing guests the opportunity to venture outdoors and allowing us better opportunities for candid and natural wedding photographs. Amy wore a long Cathedral length veil with her wedding dress meaning we had to make use of it for the wedding photographs complete with some swishing and shape making. 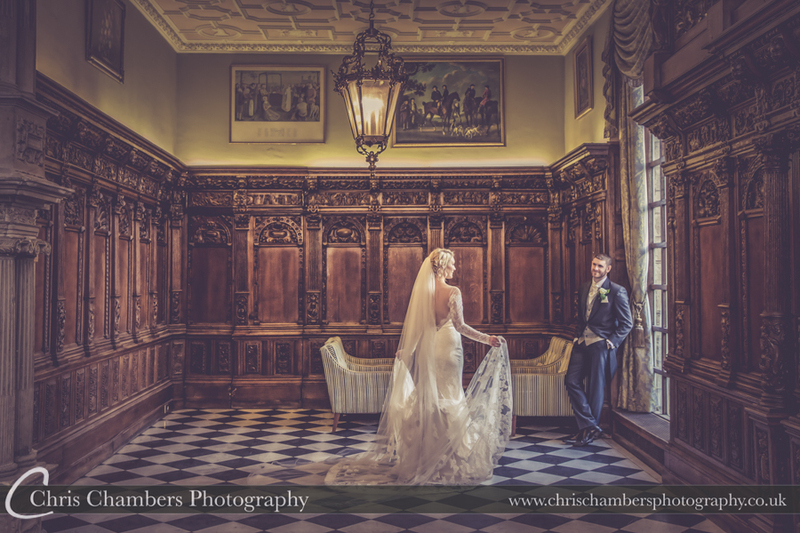 The Great Hall at Hazlewood Castle set for wedding breakfast. 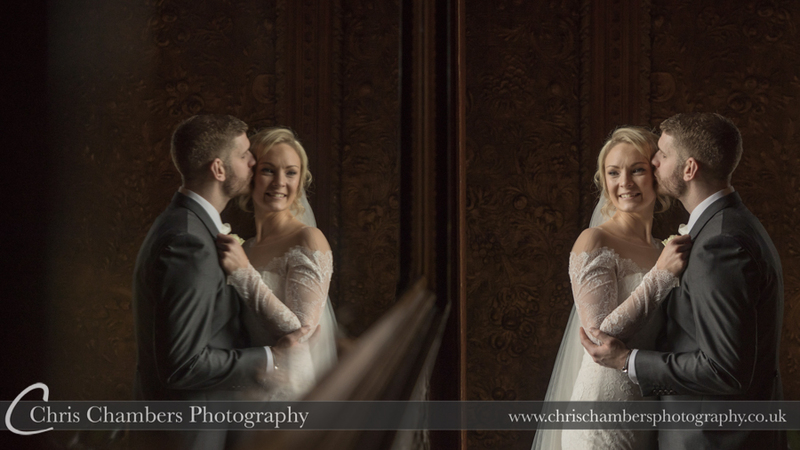 After the wedding breakfast we stayed indoors for a number of wedding photographs of Amy and David around the castle interior. 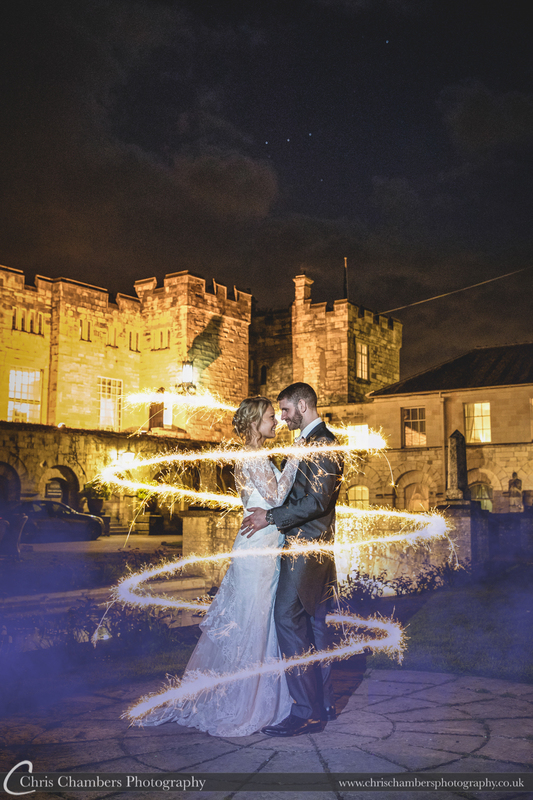 Twilight photographs at Hazlewood Castle always work well and with so many photo locations and opportunities we are spoilt for choice. 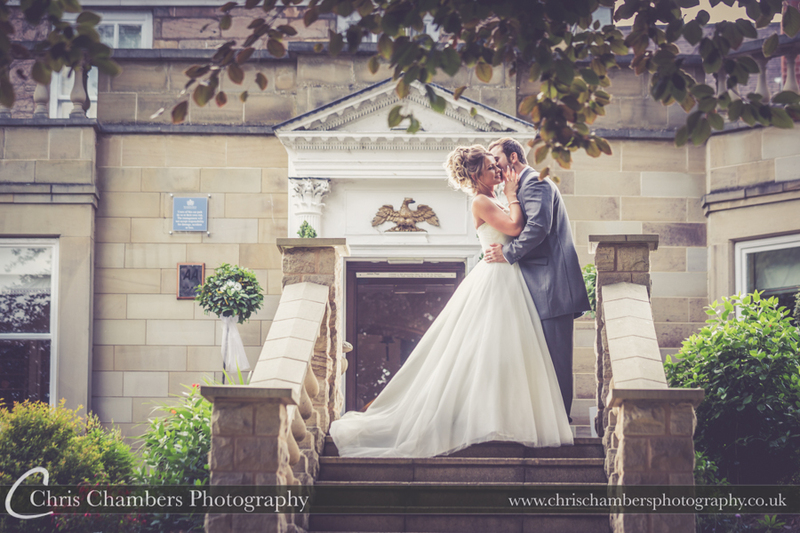 The courtyard always proving a firm favourite. 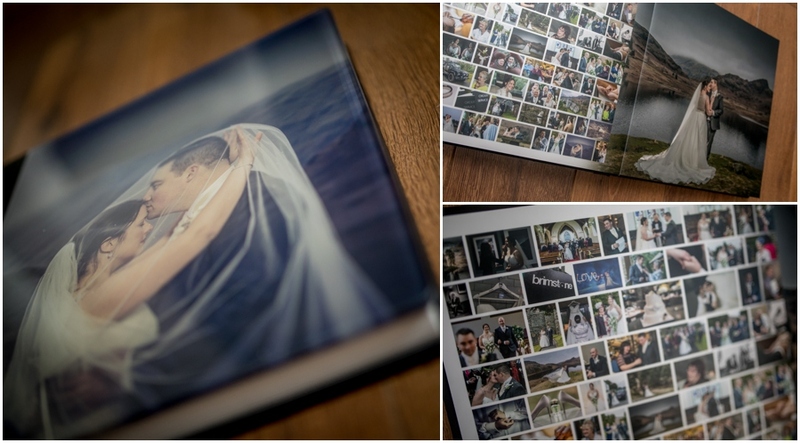 Our latest bride and groom wedding albums – Italian Storybooks from Graphistudio. 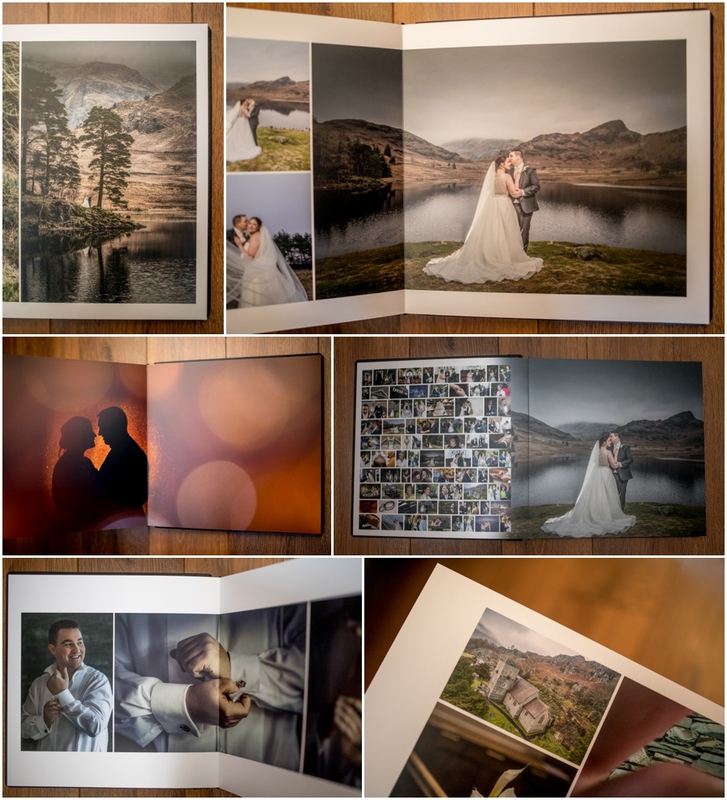 We’ve had a delivery from Graphistudio this week with a selection of albums for our bride and grooms, working along side the Italian company helps us to provide our couples with beautiful albums that they can treasure forever. 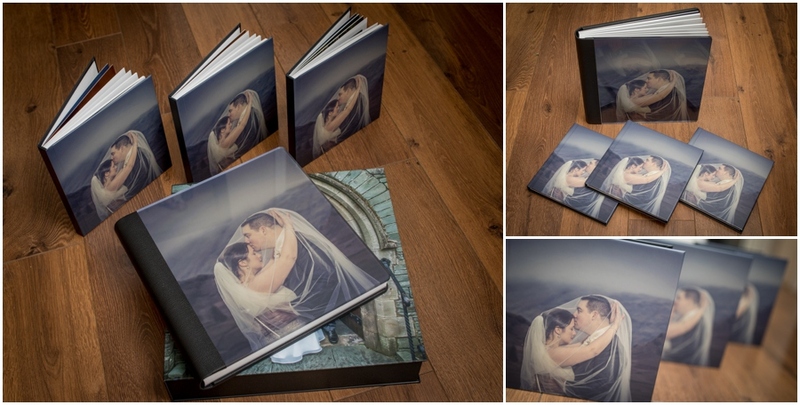 The albums are part of our Exclusive Storybook album range. 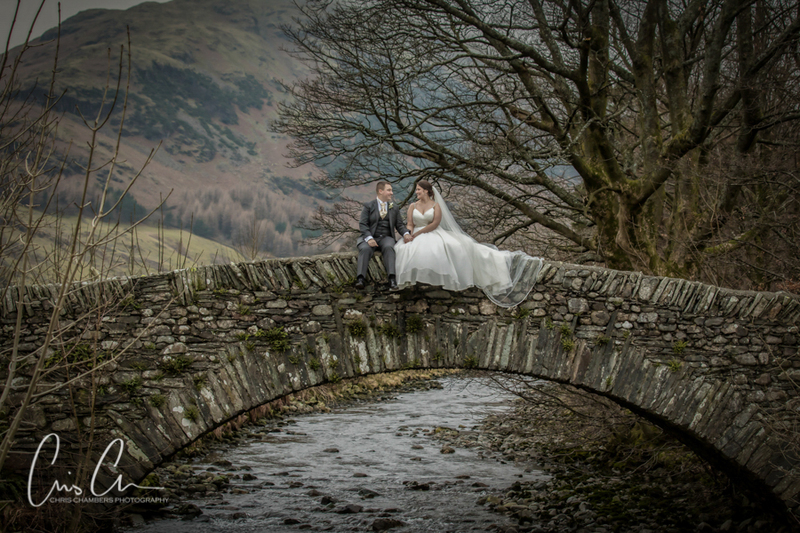 David and Louise opted for an exclusive storybook for their Lake District wedding at The Langdale Hotel. 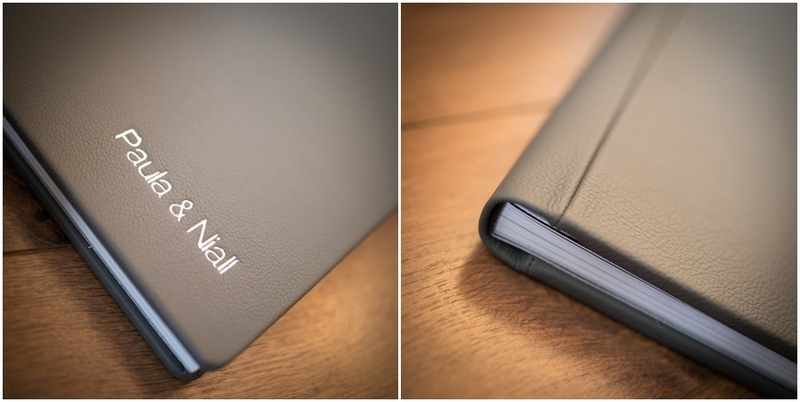 Their album featured a deep gloss acrylic cover and leather back and spine. 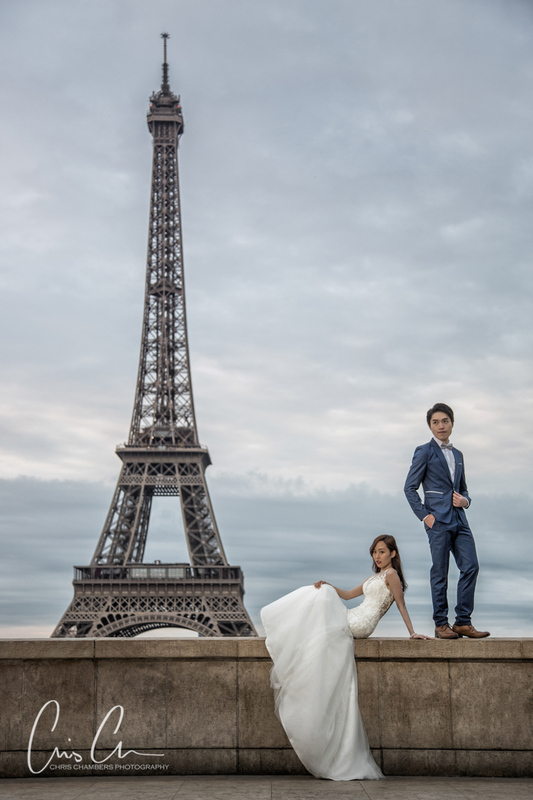 They also ordered three parent copies, mini copies of their main wedding album. 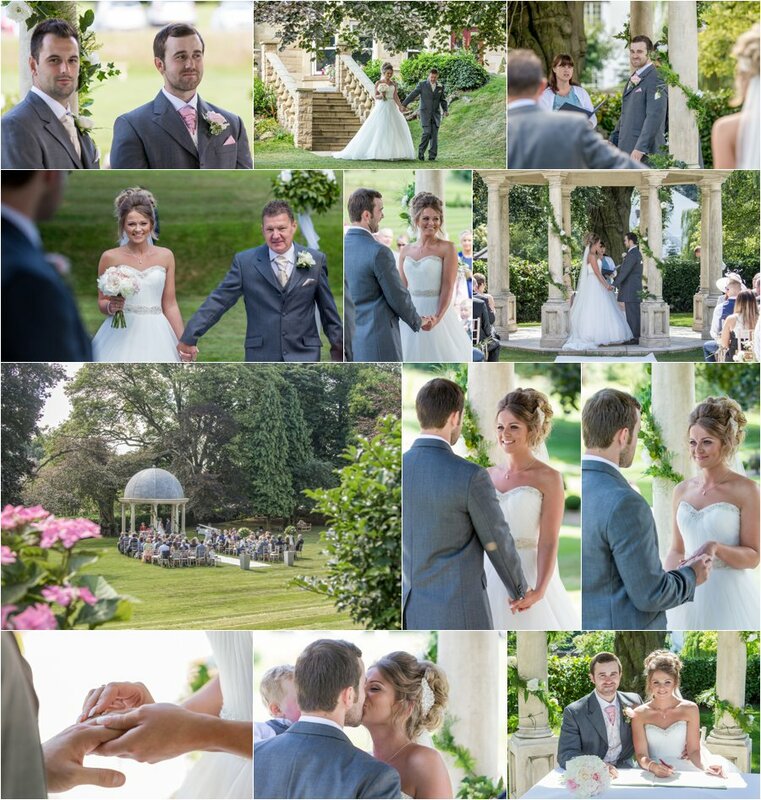 The Exclusive storybooks feature a stunning content page displaying the full selection of bride and groom choices for the wedding album. 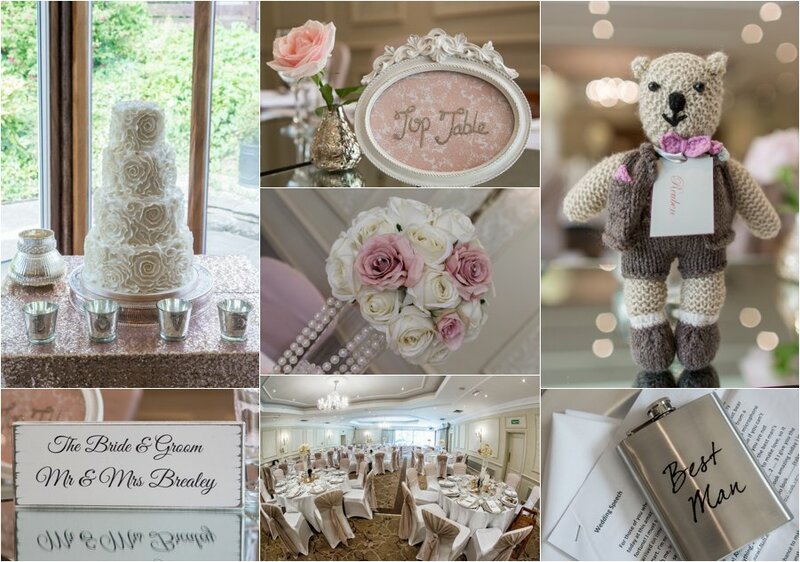 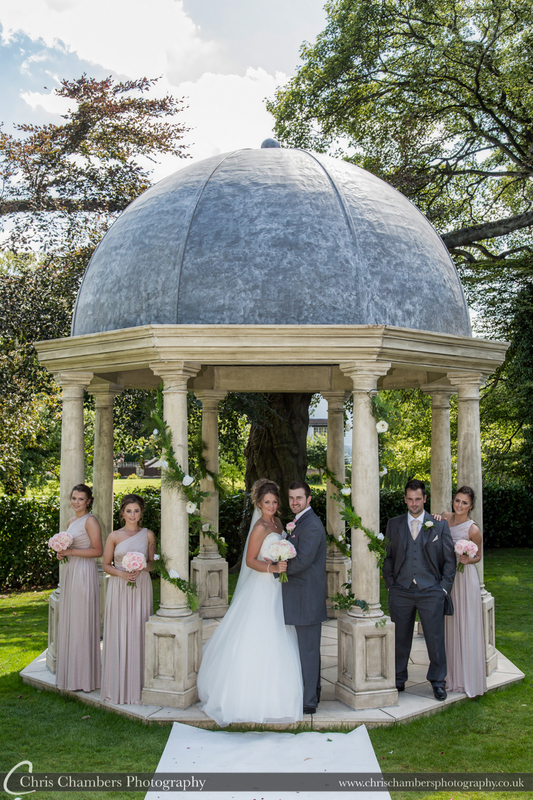 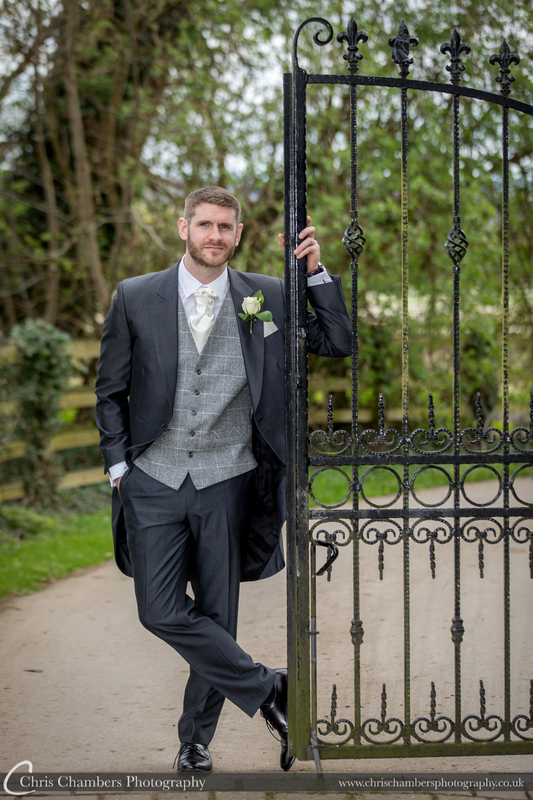 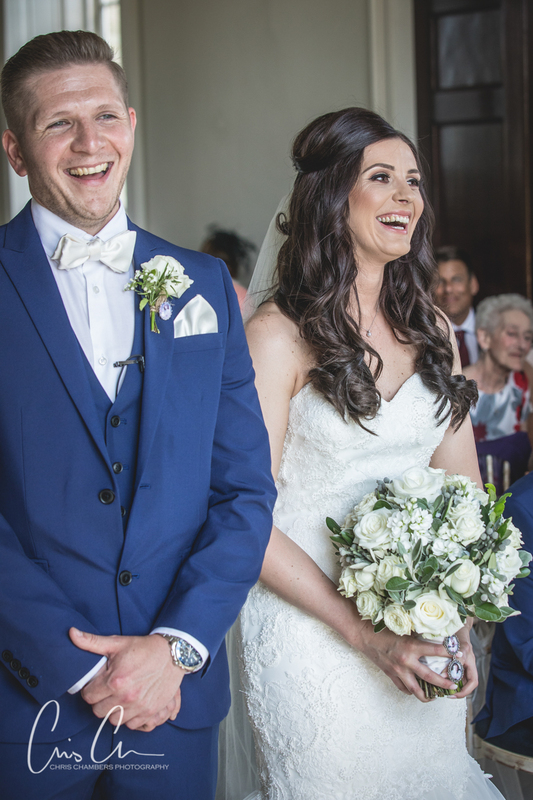 Paula and Niall who were married at Swinton Park in North Yorkshire opted for a split spine grey leather covered Italian Storybook complete with embossed names. 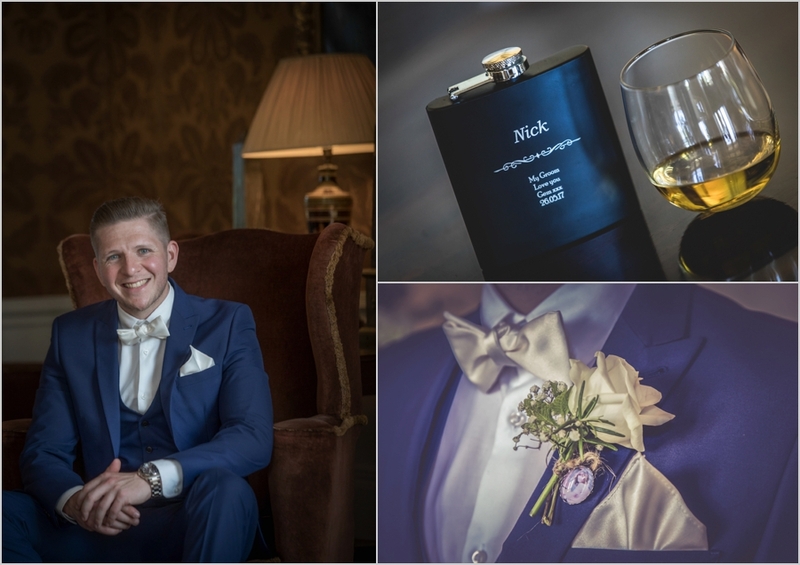 Storybooks are all designed in house and allow us the flexibility with layouts and image choices to create a stunning visual representation of the wedding day. 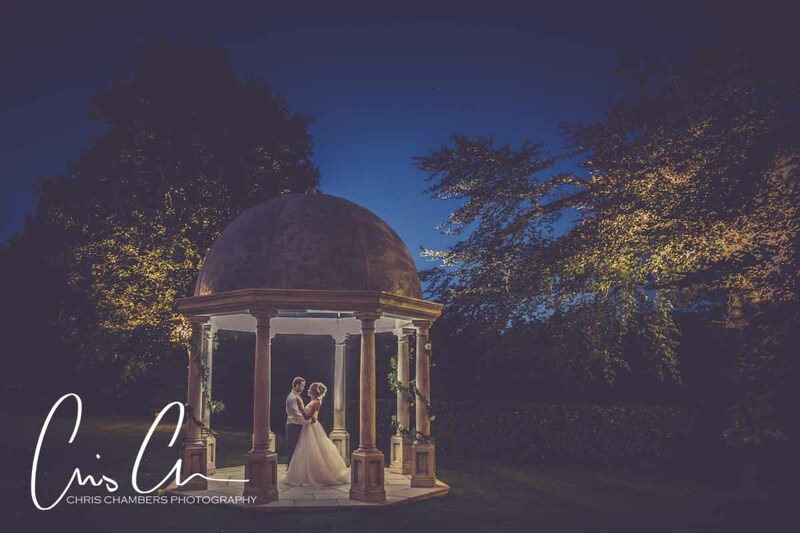 Andrew and Kate’s Exclusive storybook wedding album from their wedding at The Mansion in Rounday Park, Leeds featured a twilight photograph on the cover and for their large printed album box a different twilight wedding photograph. 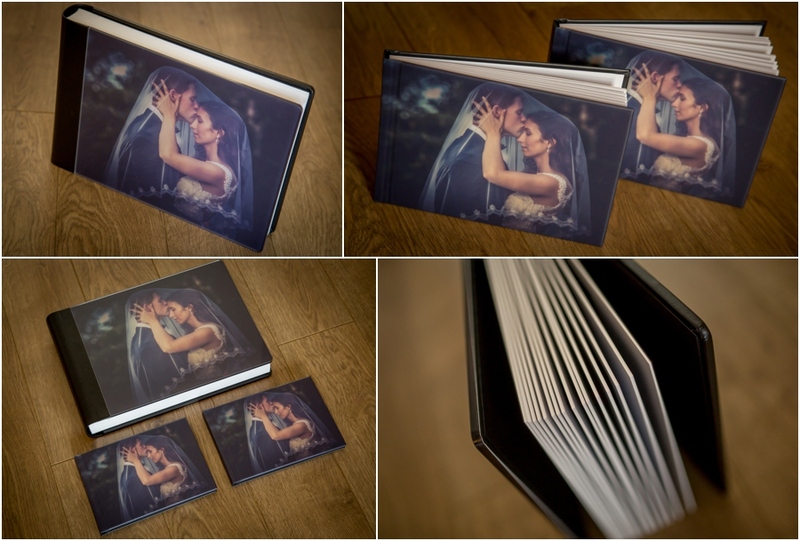 Twilight photos are included with all Exclusive Storybooks. 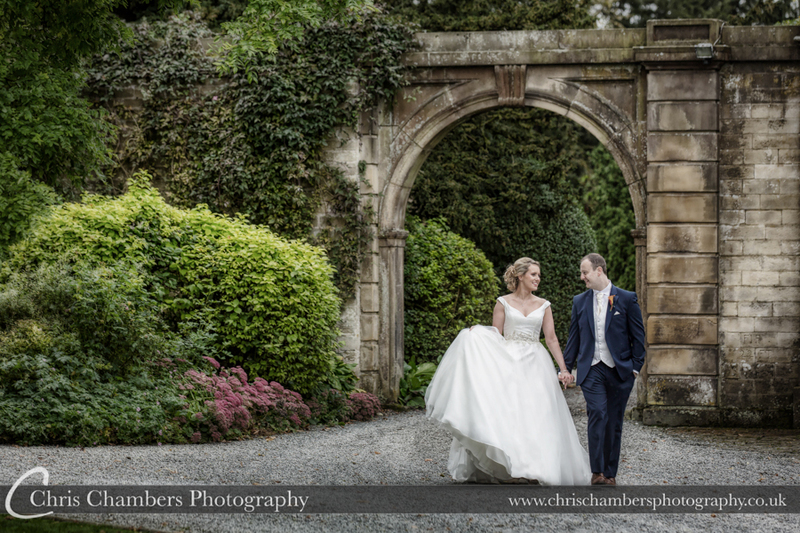 Claire and Matthew chose Coniston Hall Hotel near Skipton North Yorkshire for their wedding venue. 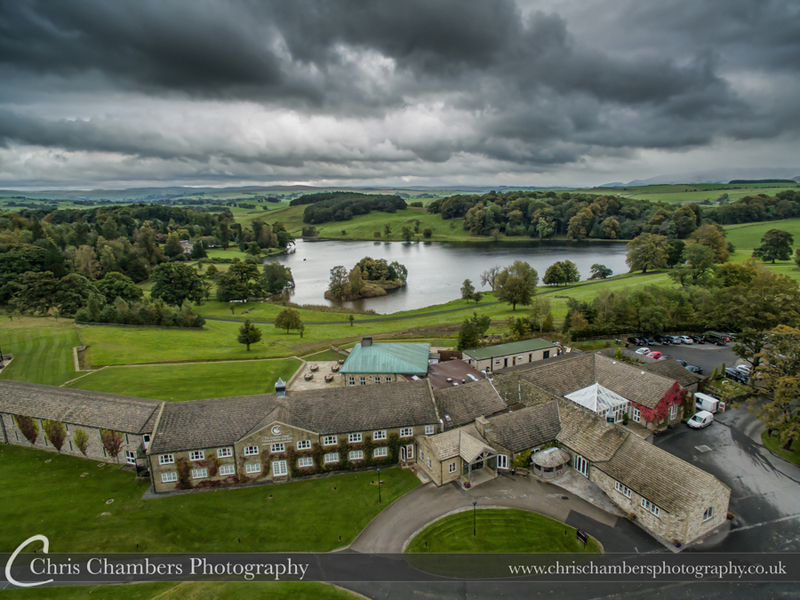 The hotel on the edge of the Yorkshire Dales sits in a 1400 acre estate complete with lake. 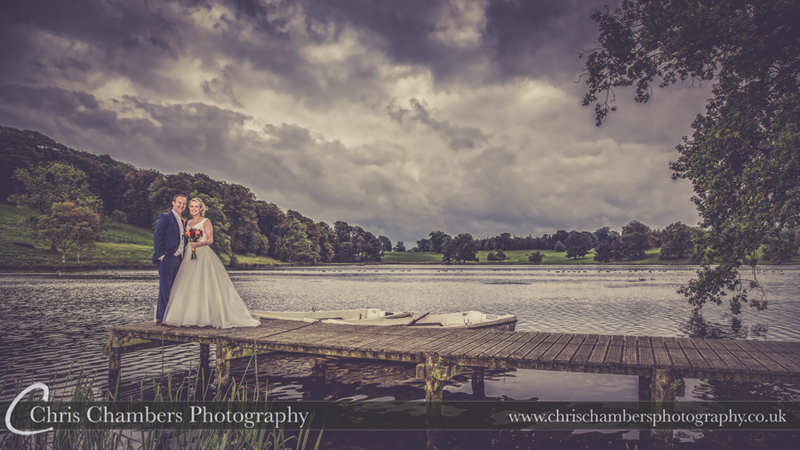 The weather forecast was varied to say the least with heavy showers forecast through the day. 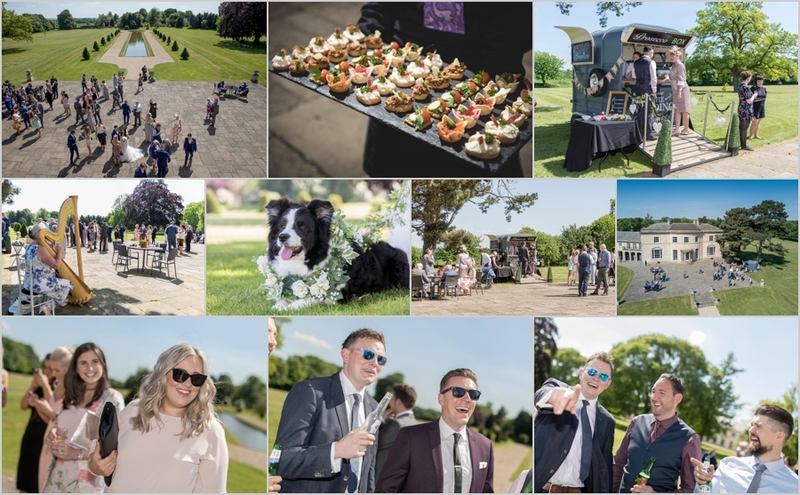 Rather fortuitously these appeared during the wedding breakfast allowing us time to make full use of the grounds and lakeside for the wedding photographs. 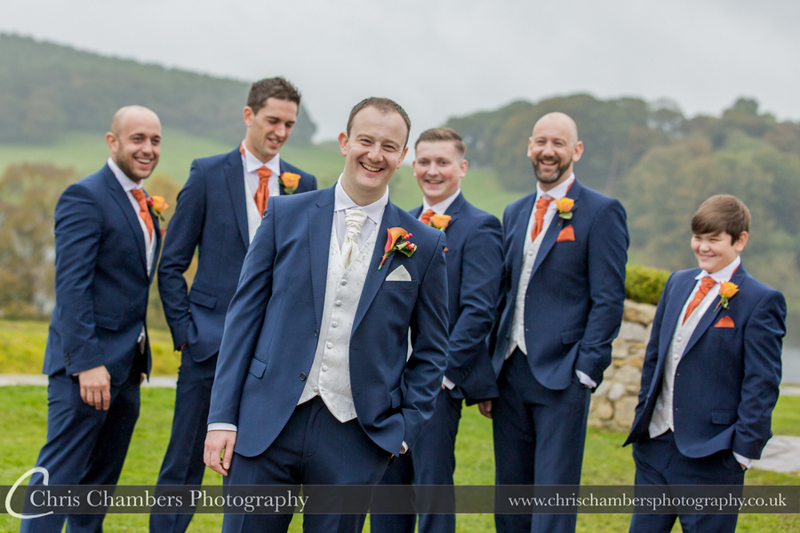 With all wedding photography packages including those at Coniston Hall Hotel we include a large screen slideshow in the evening. 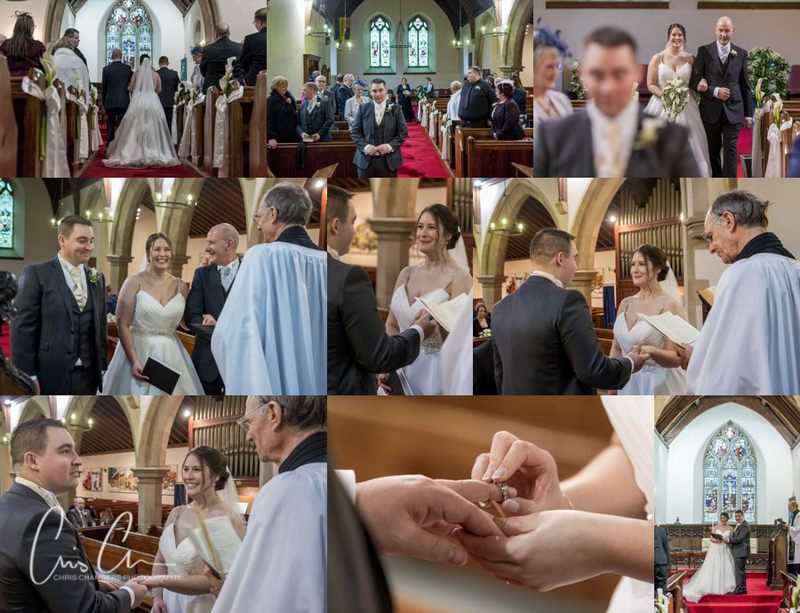 Featuring around 50 fully edited wedding photographs the slideshows are always a big hot with brides grooms and the wedding guests. 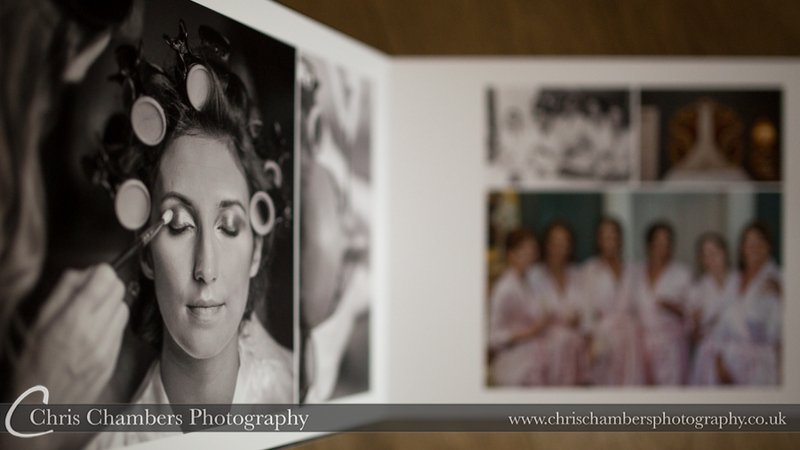 The images below include many that were displayed during the evening reception. 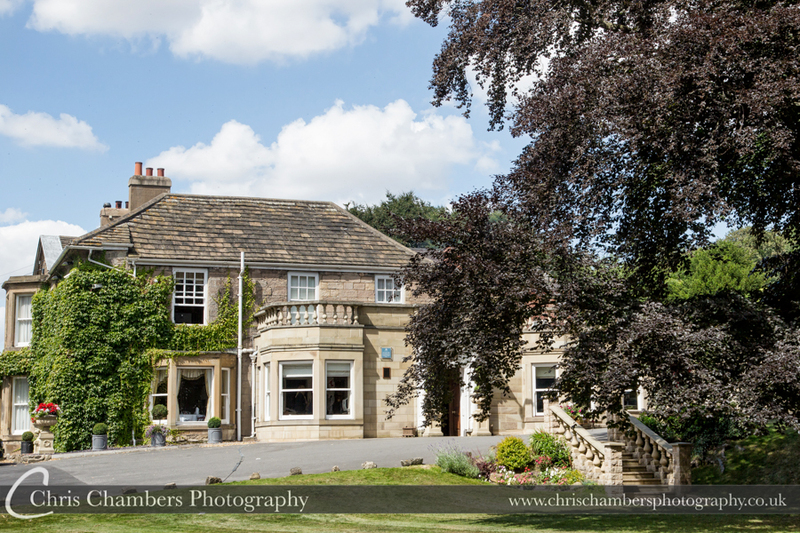 Just North of Skipton in North Yorkshire Coniston Hall Hotel sits on the edge of the Yorkshire Dales. 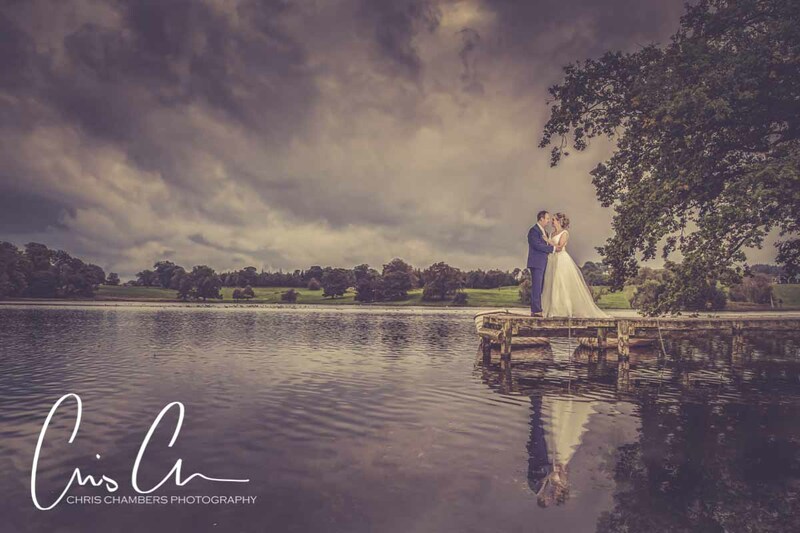 The hotel overlooks a stunning 1400 acre estate complete with lake which is available for wedding photographs. 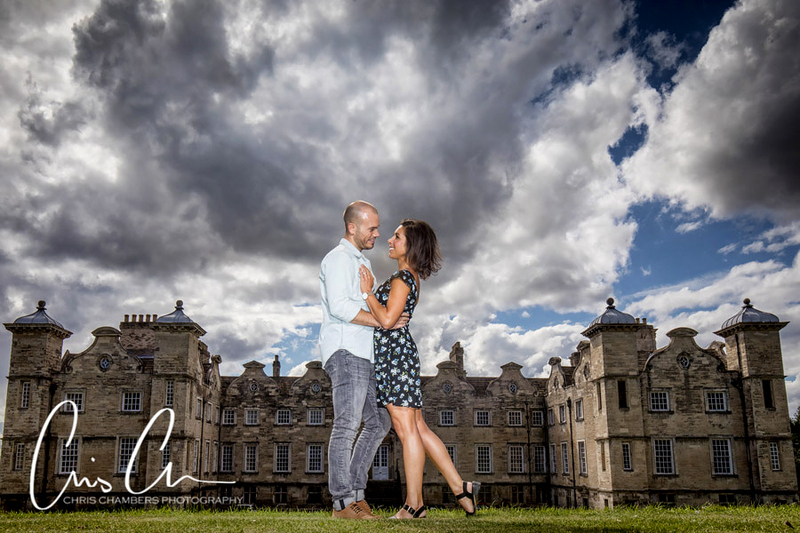 Seen here on the cloudy morning of Claire and Matt’s wedding day. 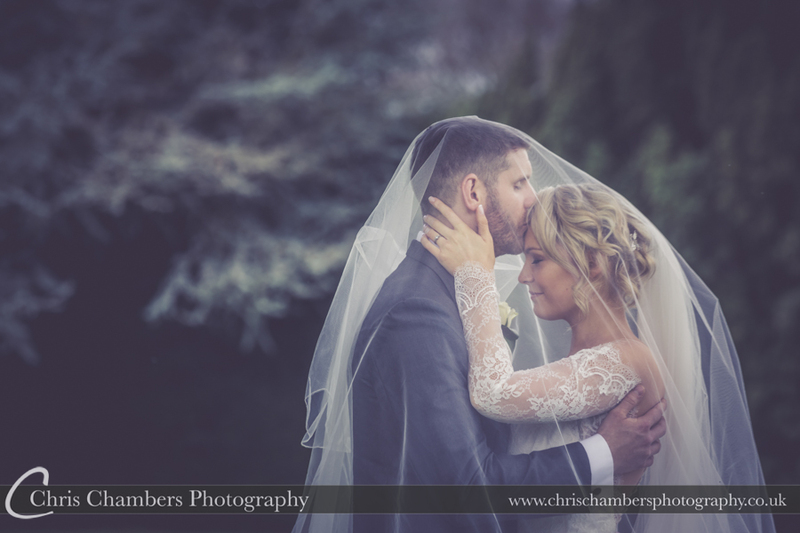 Coniston Hall Hotel wedding photography copyright Chris Chambers. 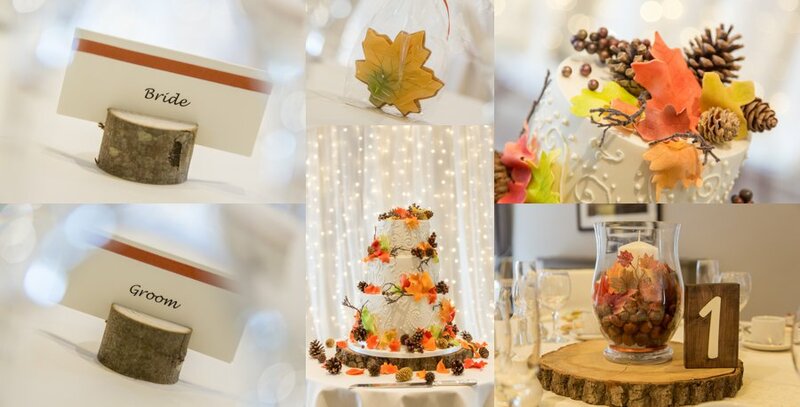 In keeping with the season Claire and Matt chose autumnal colours, the wedding breakfast room and wedding cake all featuring oranges and reds along with pine cones and foliage. 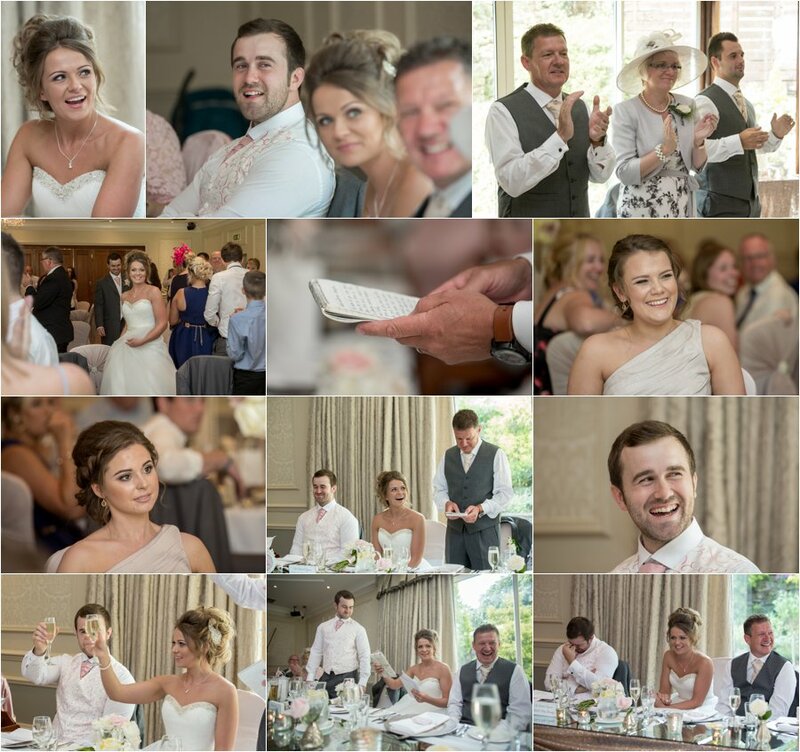 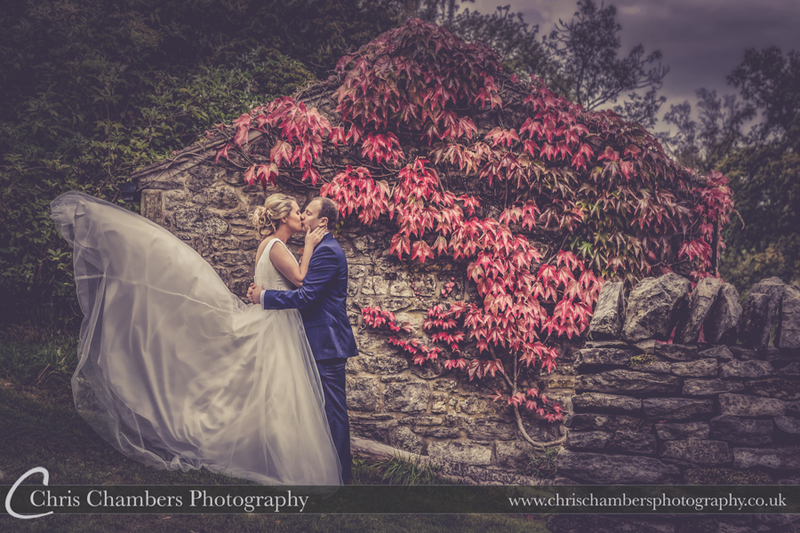 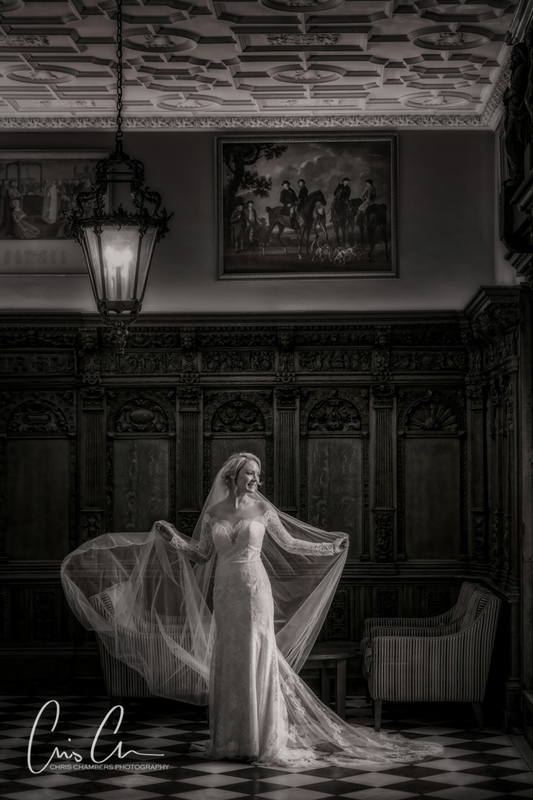 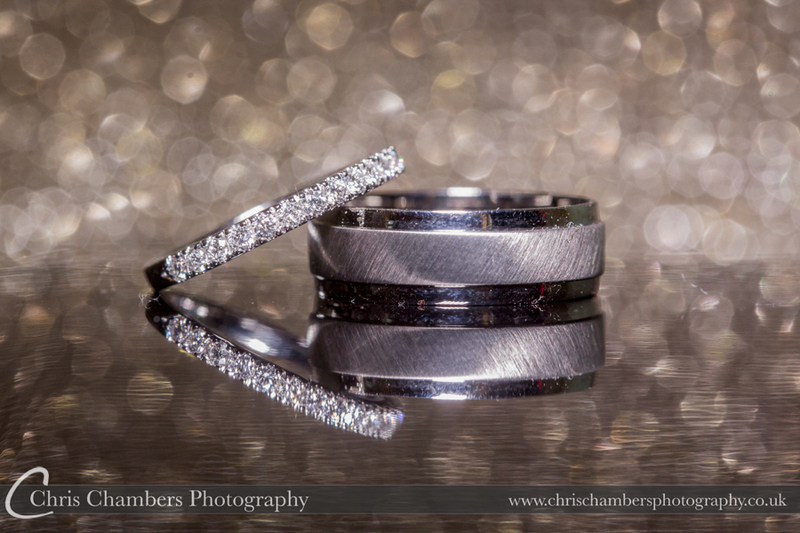 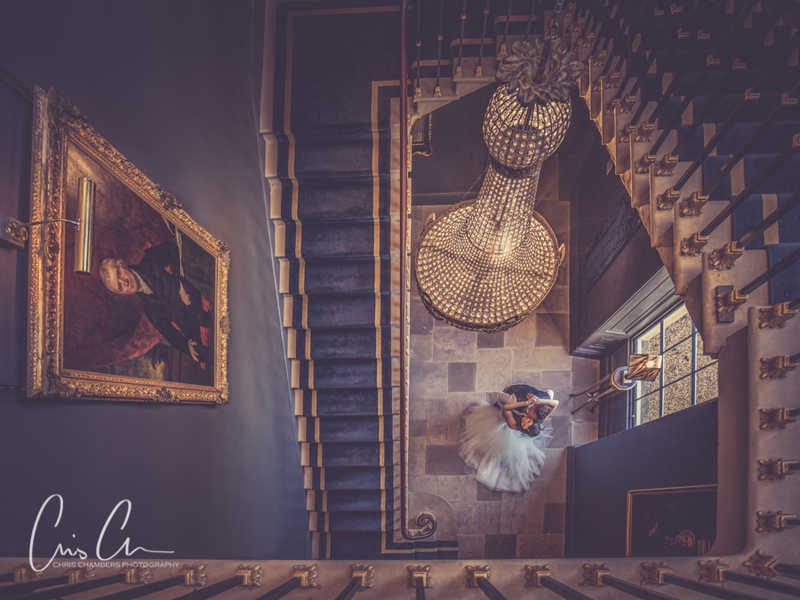 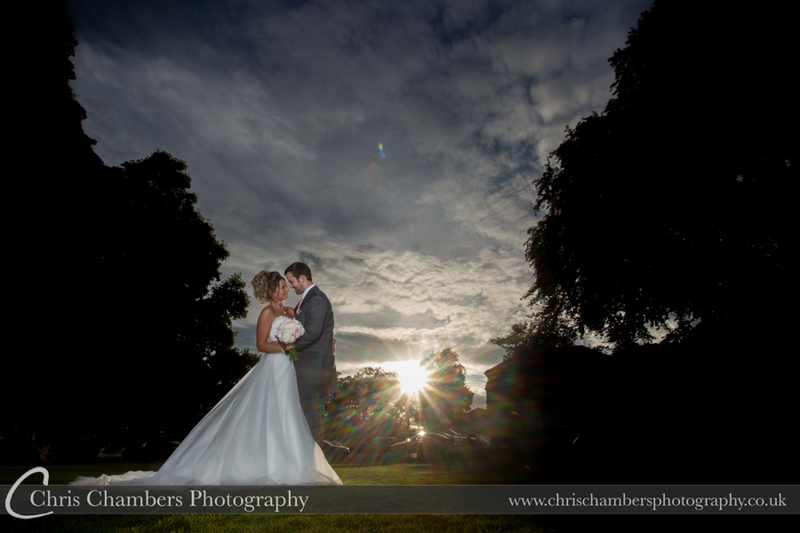 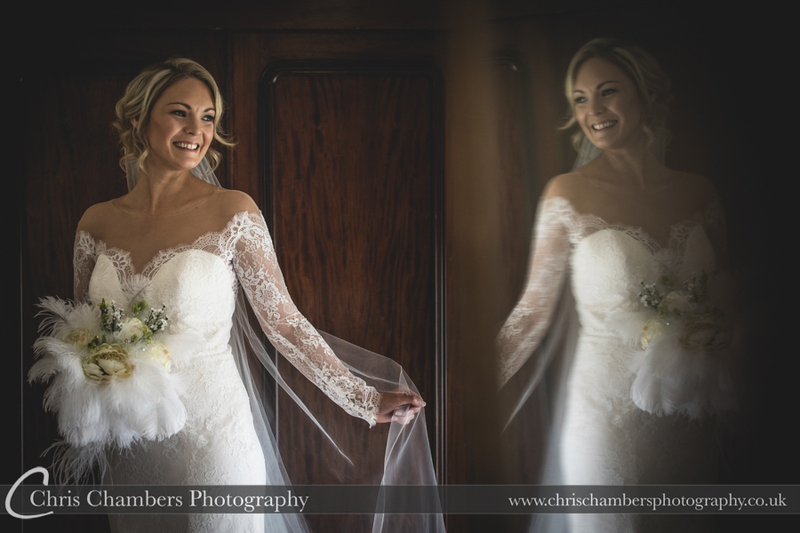 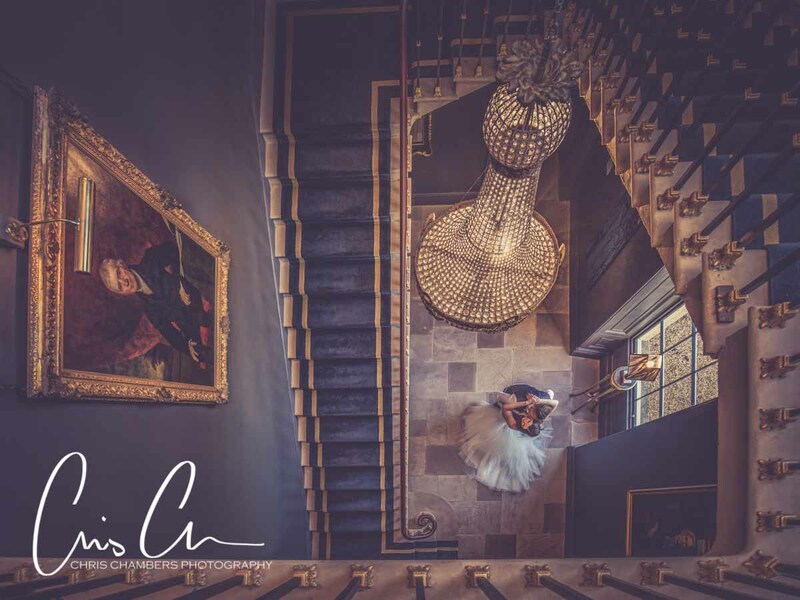 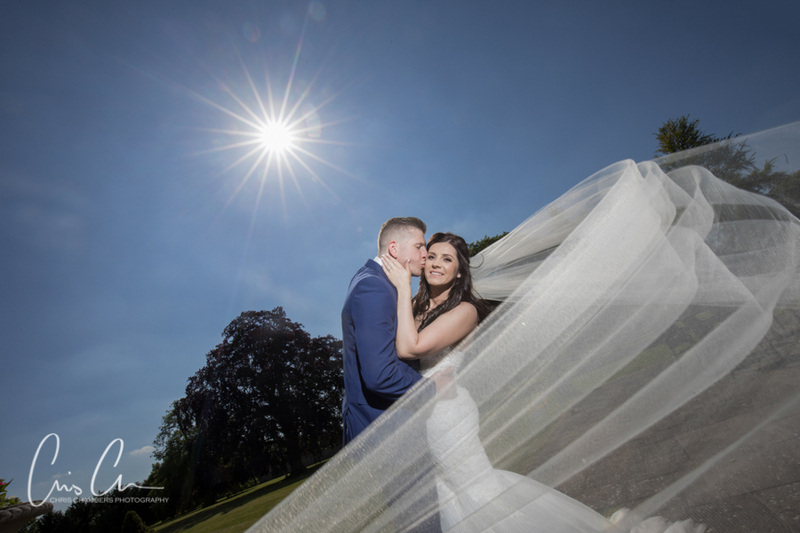 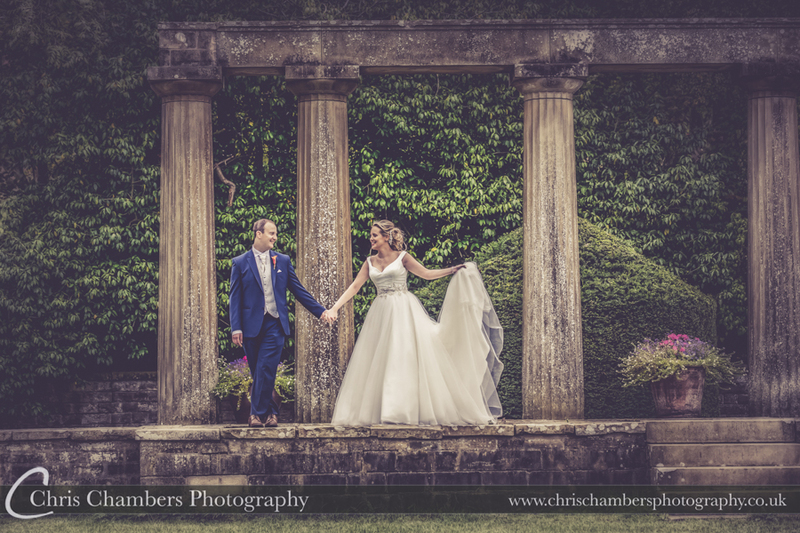 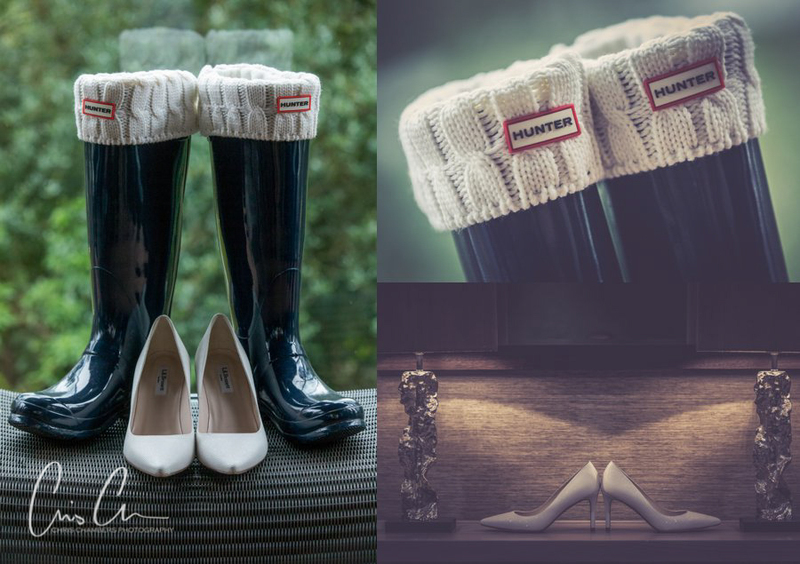 Coniston Hall wedding photography – Chris Chambers Wedding photographer. 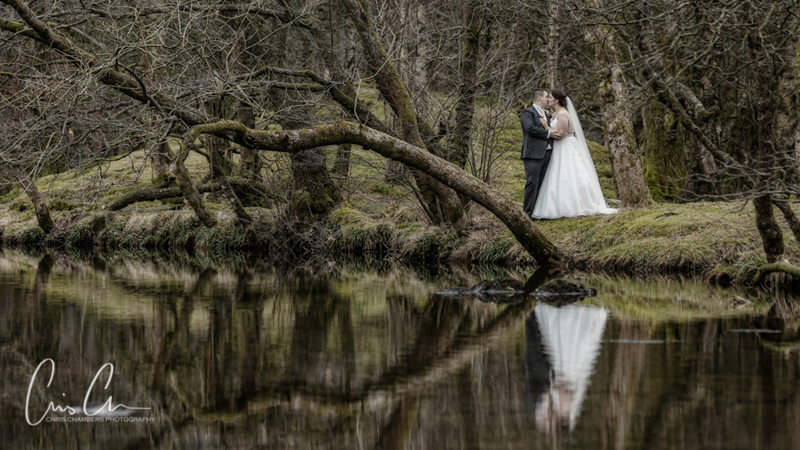 The grounds and nearby lake at Coniston Hall Hotel near Skipton make an ideal backdrop for wedding photographs. 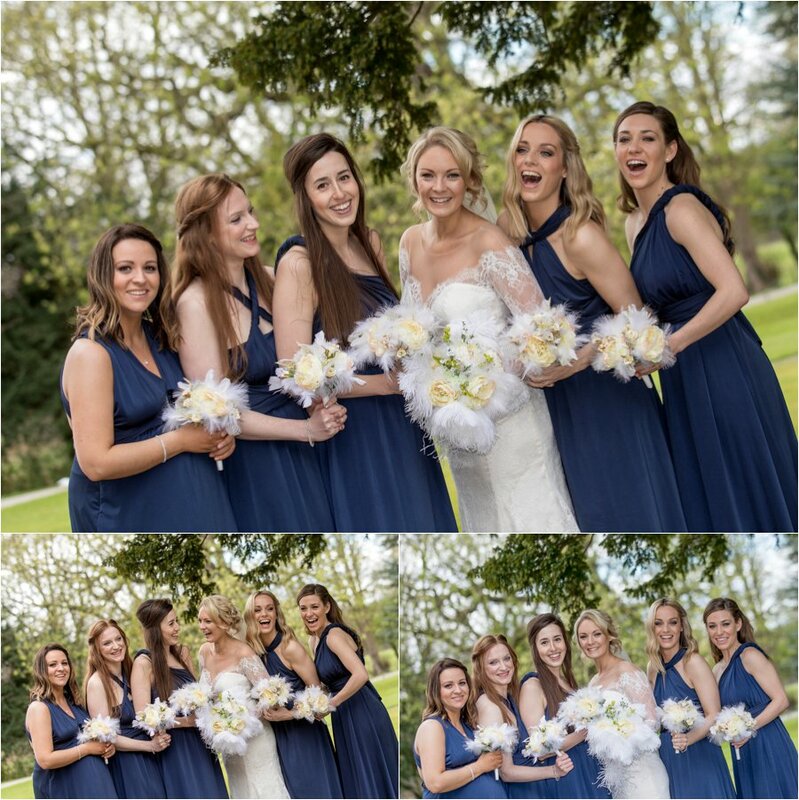 and Elles recently collected their wedding album. 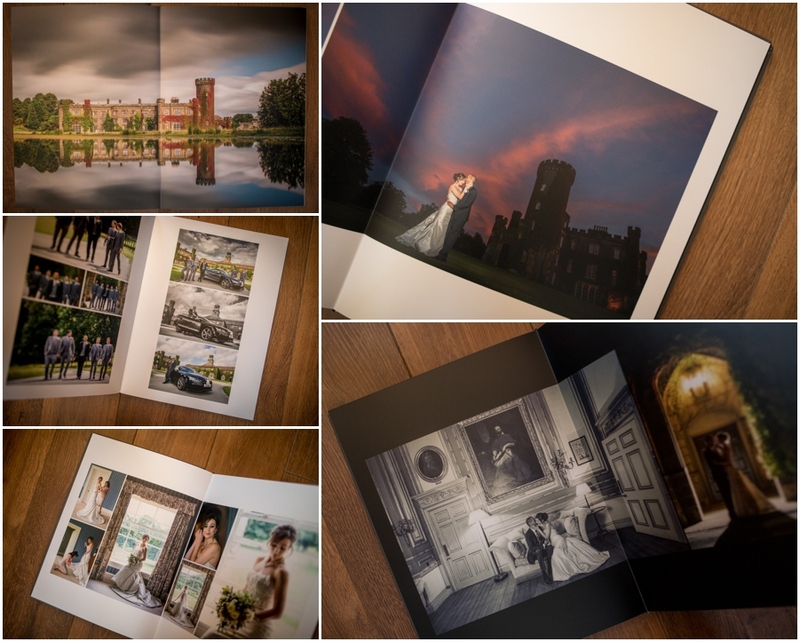 The stunning album features forty pages from their wedding day at Allerton Castle. 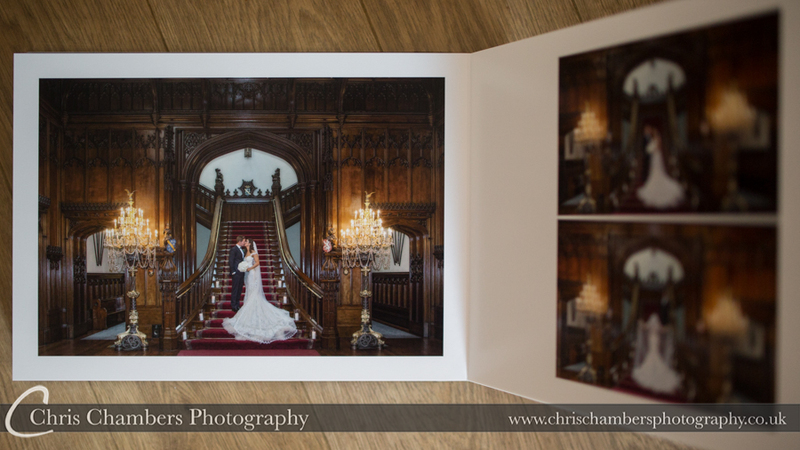 The classic layout keeps the album looking crisp and clean as it flows through the story of the wedding day. 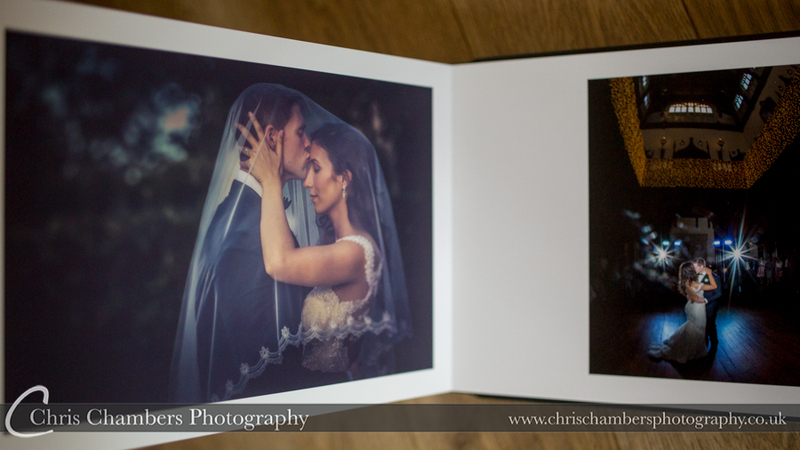 Matt and Elles also ordered a pair of parent albums to match their main wedding storybook. 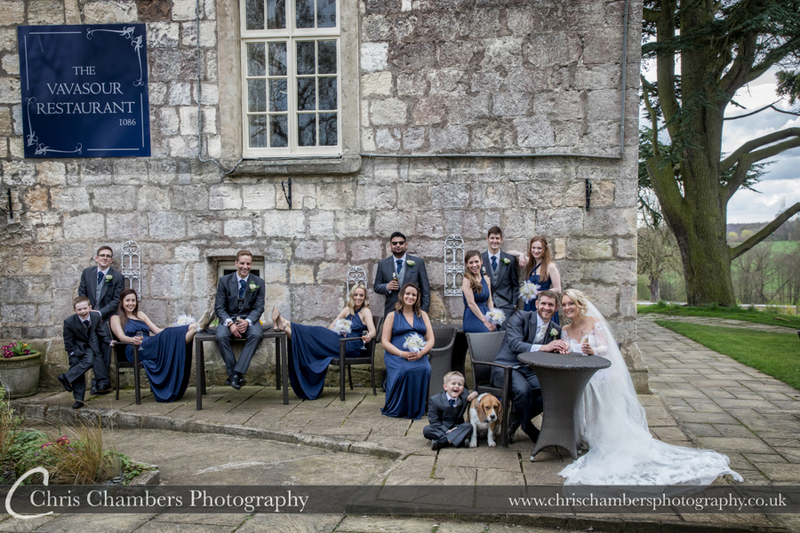 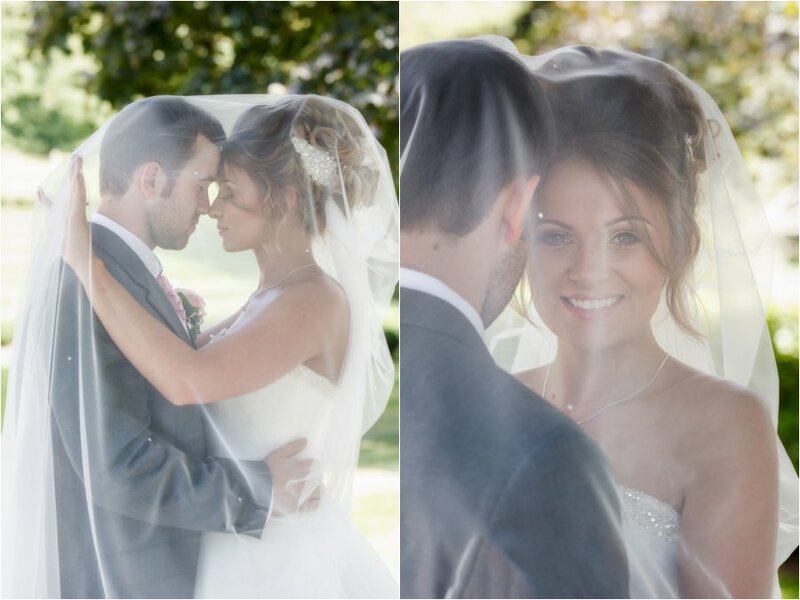 Jess and Lee were married recently in a civil wedding ceremony at Wentbridge House near Pontefract. 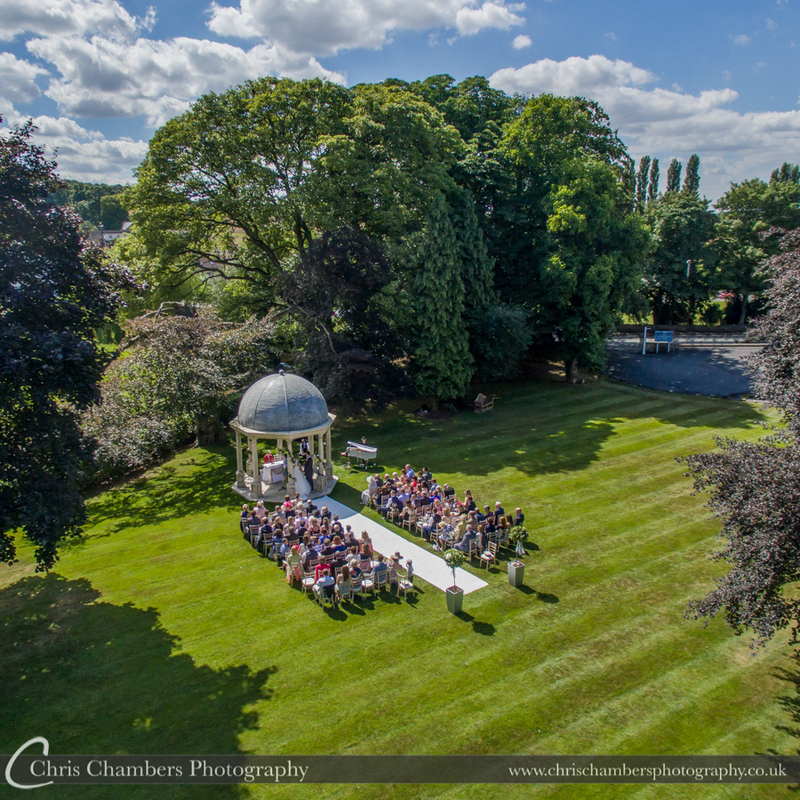 Good weather allowed for their civil ceremony to take place outdoors in the folly with guests seated on the lawn. 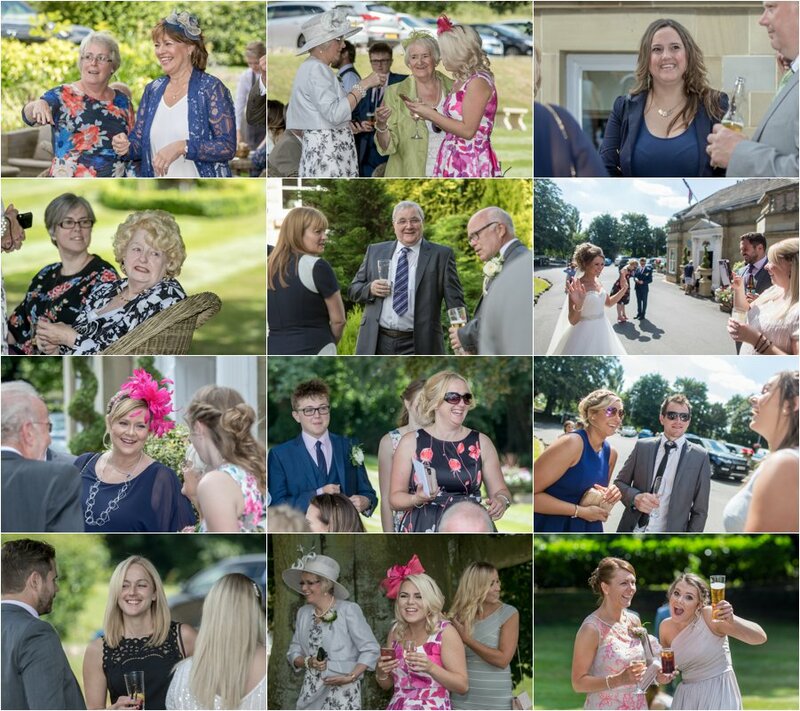 The photographs below include many that we played in our slideshow during the evening reception. 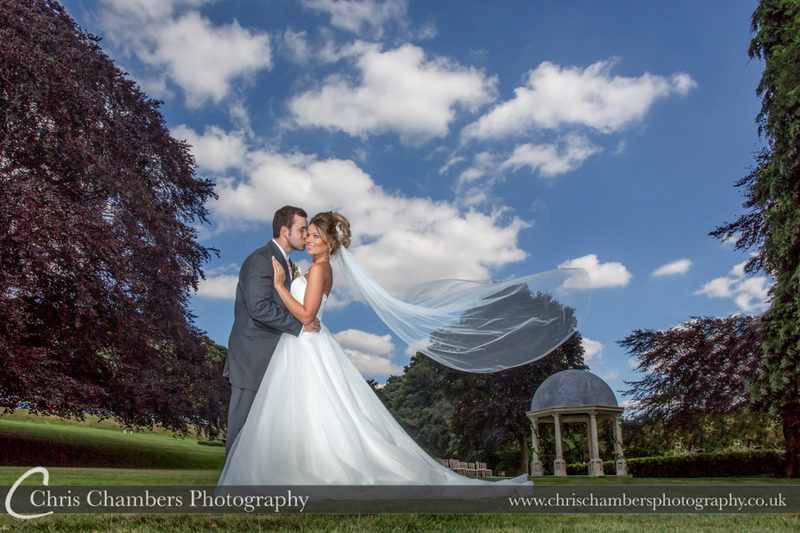 The wedding photography slideshow is included with all our wedding photography packages. 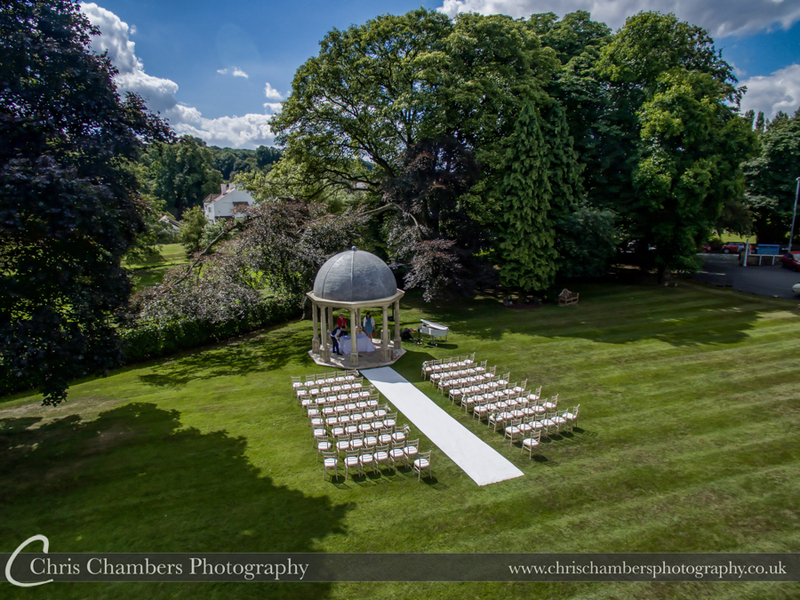 The Folly at Wentbridge House set for Jess and lees outdoor wedding ceremony. 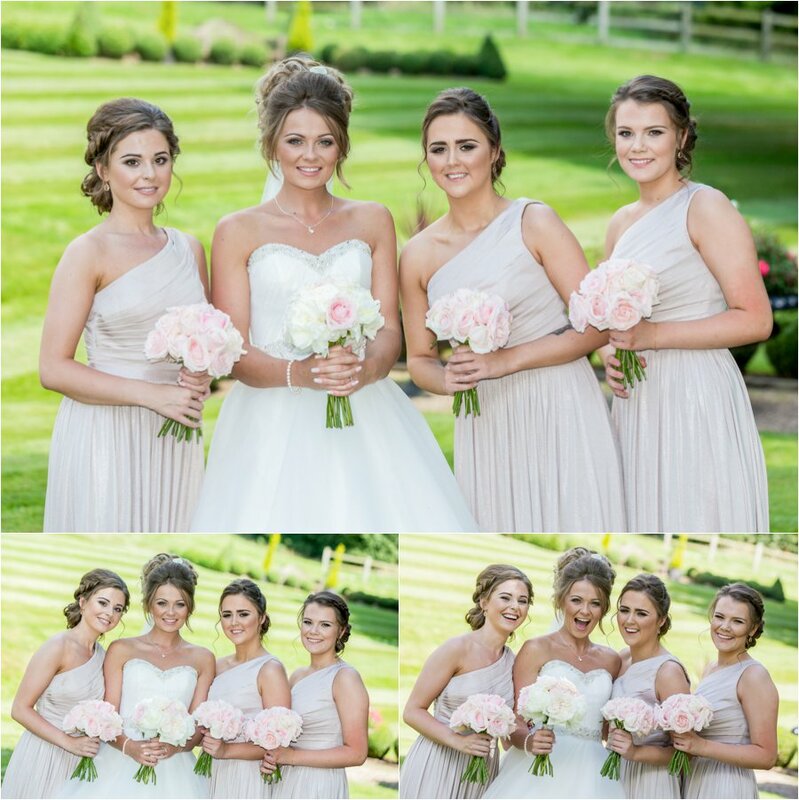 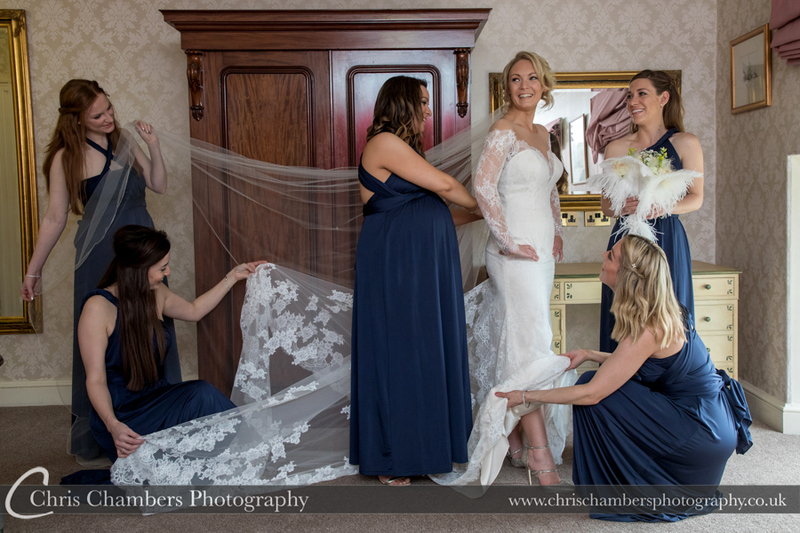 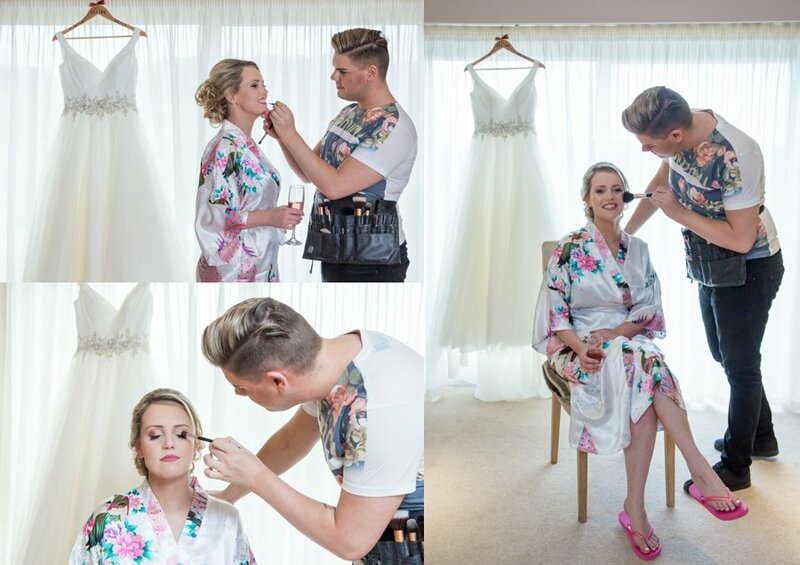 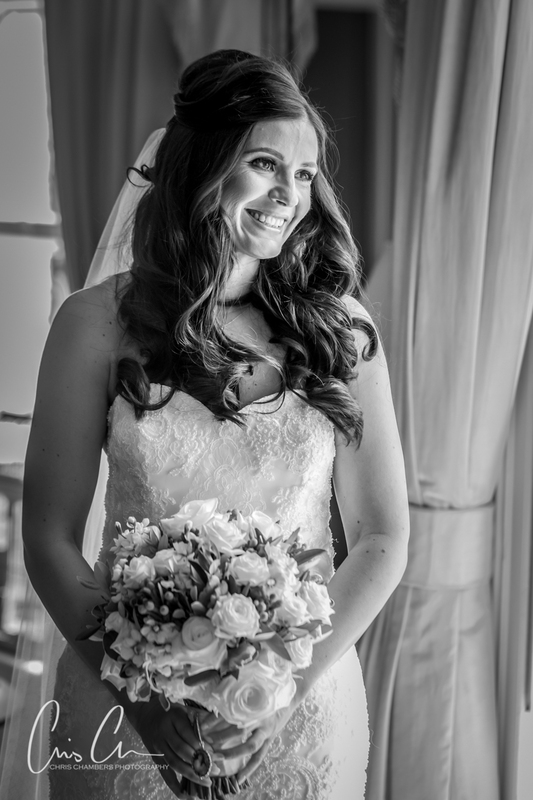 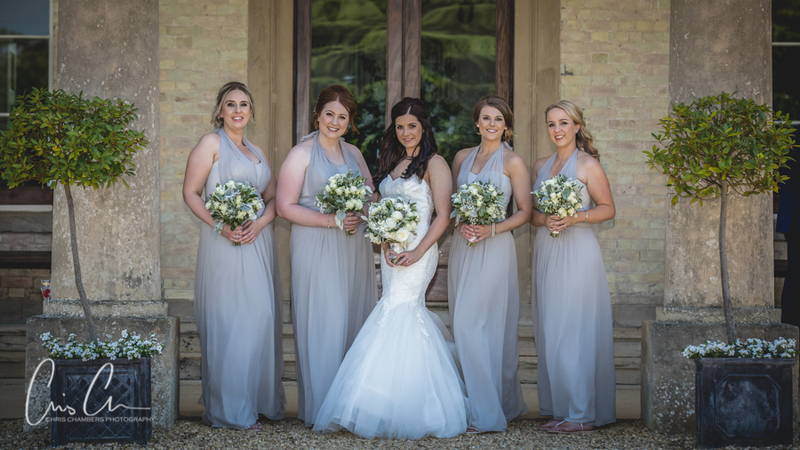 Our day began with bridal preparation as we joined Jess and her bridesmaids in the hotel for make up and hair preparation whilst we started with the wedding detail photographs before capturing the final stages of preparation. 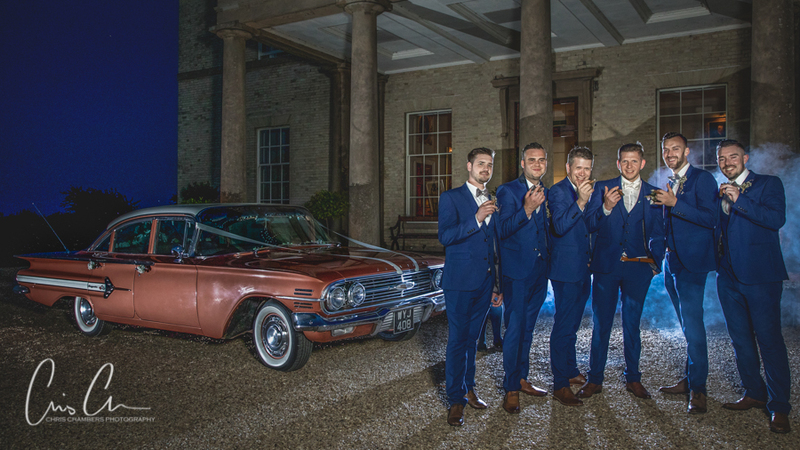 Lee arrived for the wedding ceremony in a large American car which made the ideal prop for photographs before he joined his groomsmen. 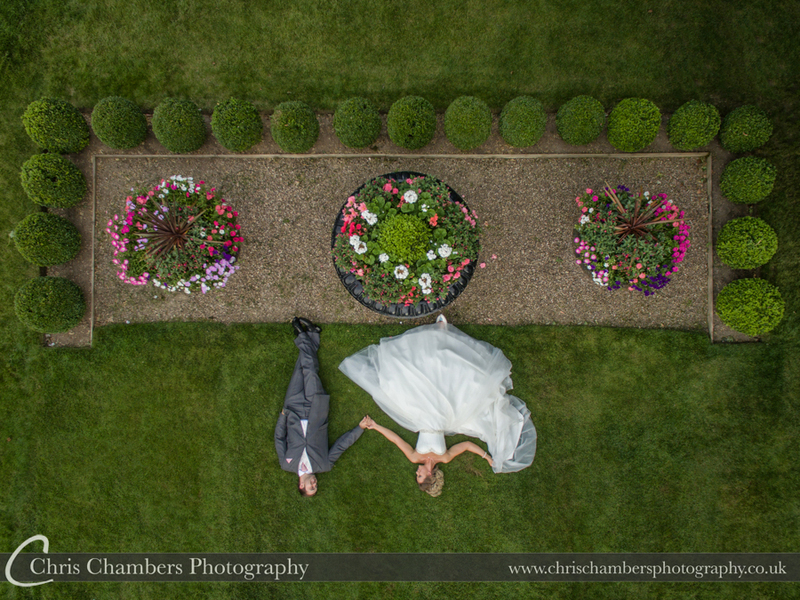 Outdoor civil wedding ceremonies offer so many photo opportunities and the chance for different angles without being obtrusive. 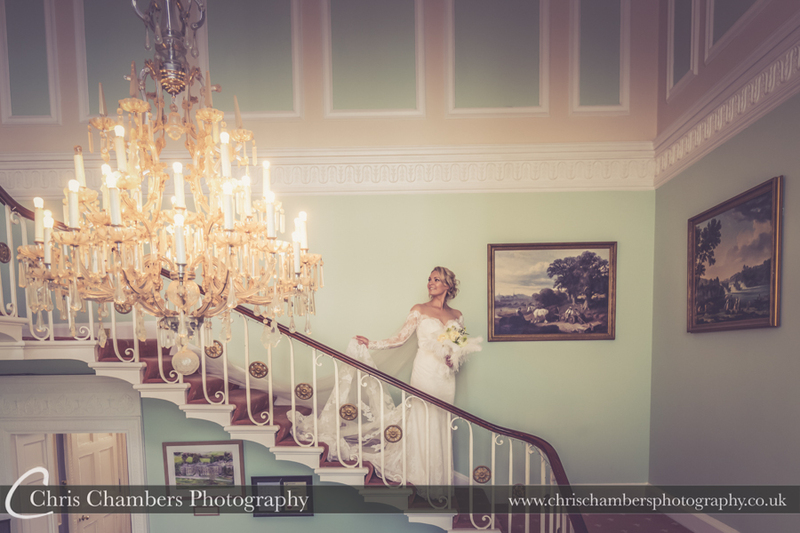 The Crystal suite at Wentbridge House set for Jess and Lee’s wedding breakfast. 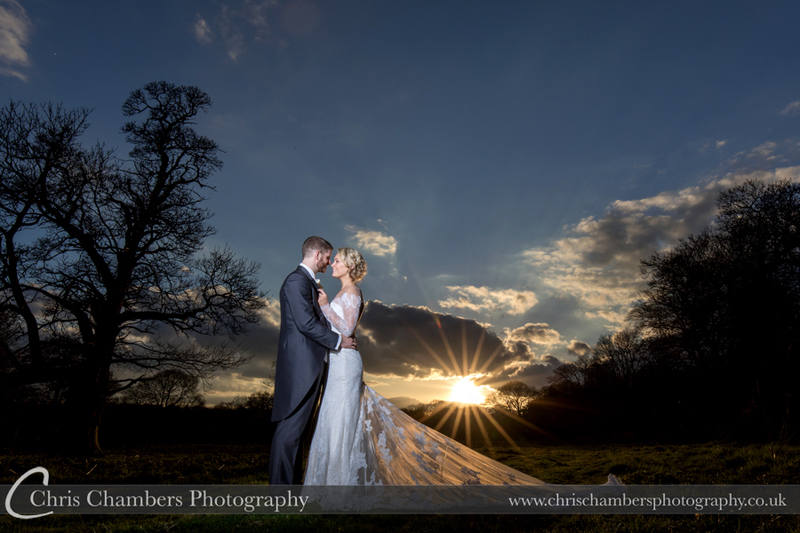 Following the wedding breakfast, we were able to take Jess and Lee back outdoors for a few more wedding photographs on the Wentbridge lawns before sunset. 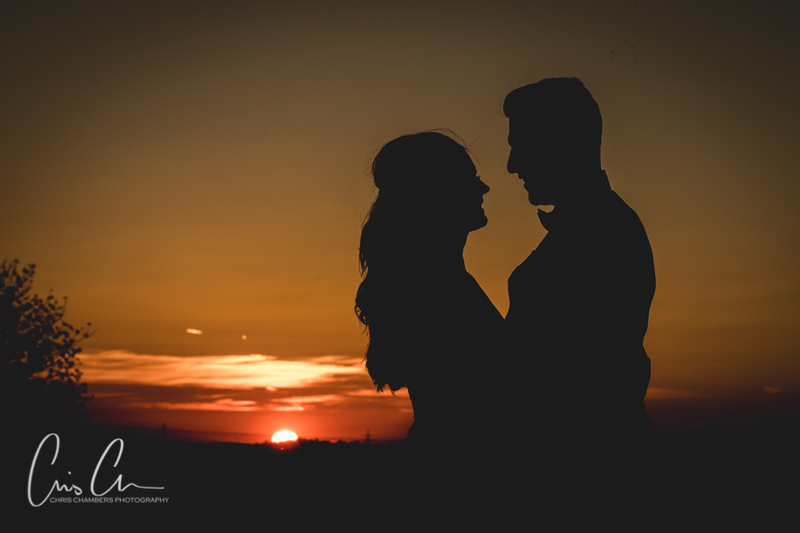 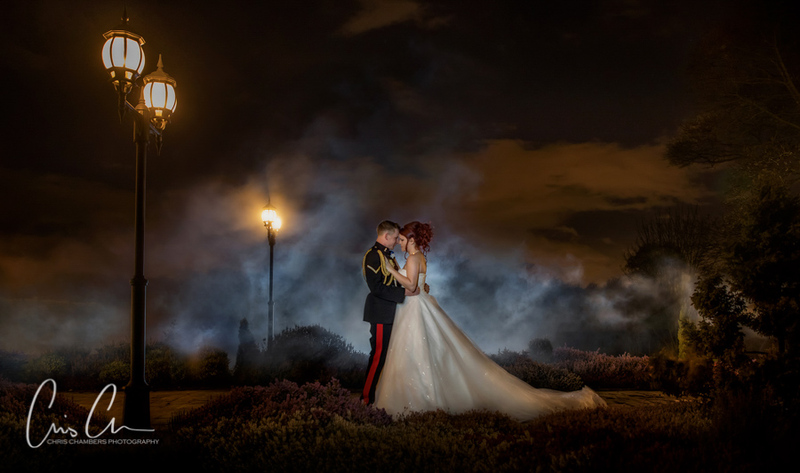 Our storybook, Reportage and Eros wedding photography packages (correct as of June 2017) include twilight photographs. 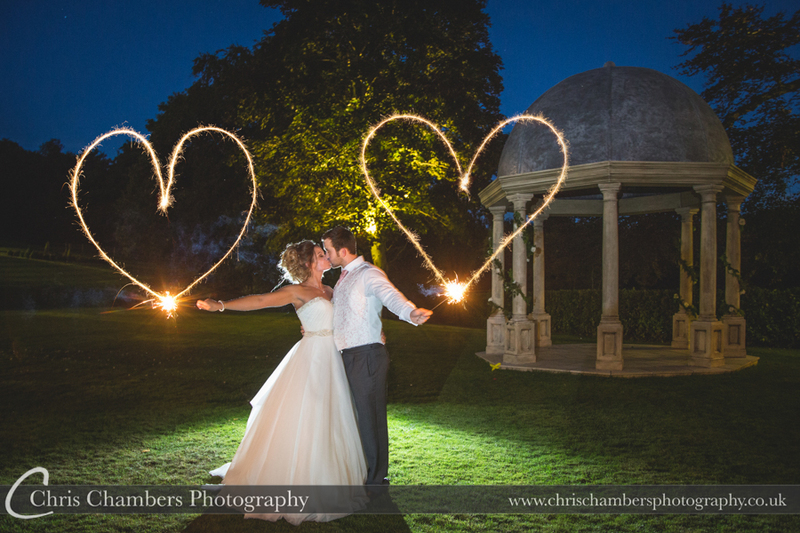 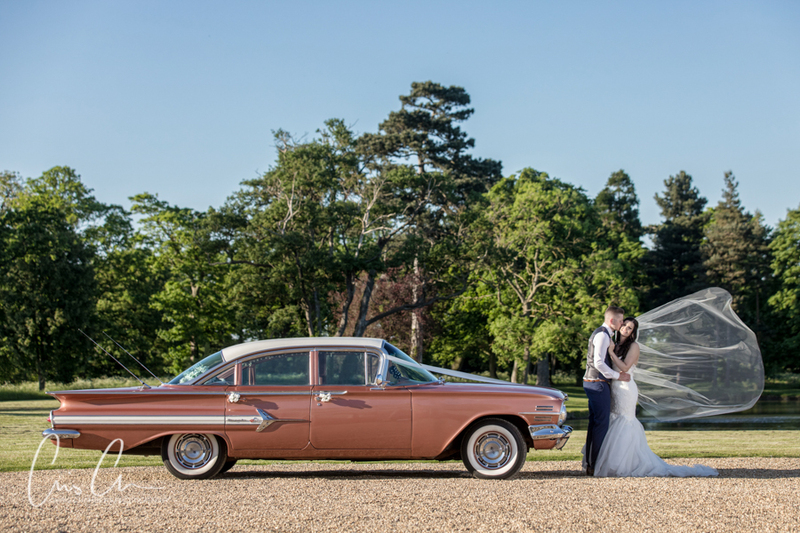 An ideal ending to the wedding albums with after dark wedding photographs in the grounds. 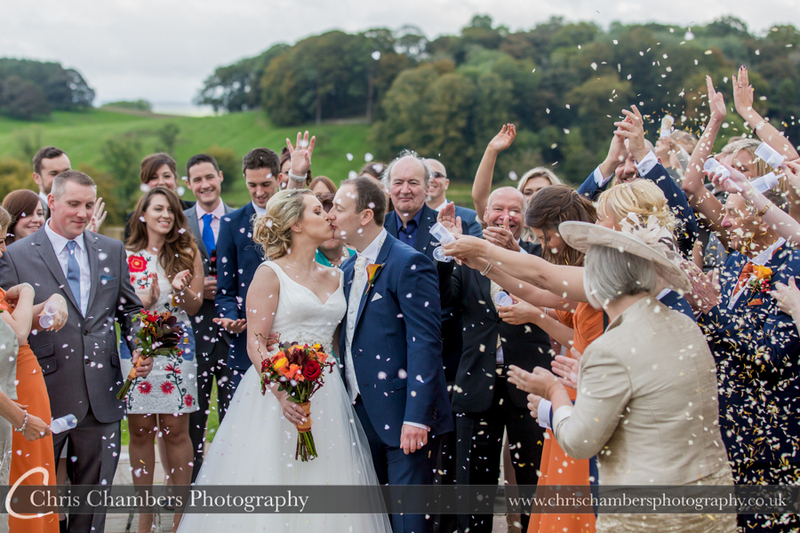 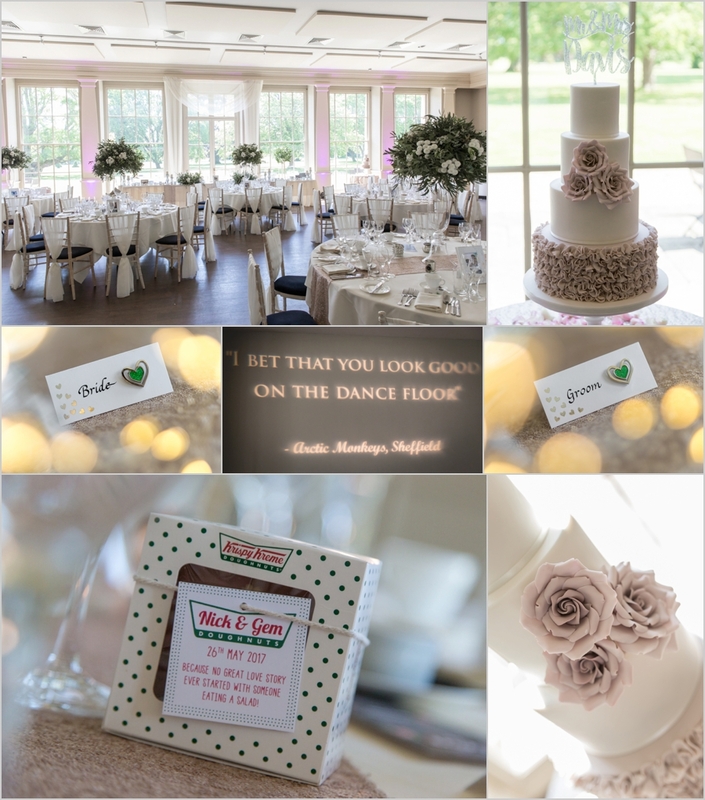 You can view more of our Wentbridge House wedding photographs here. 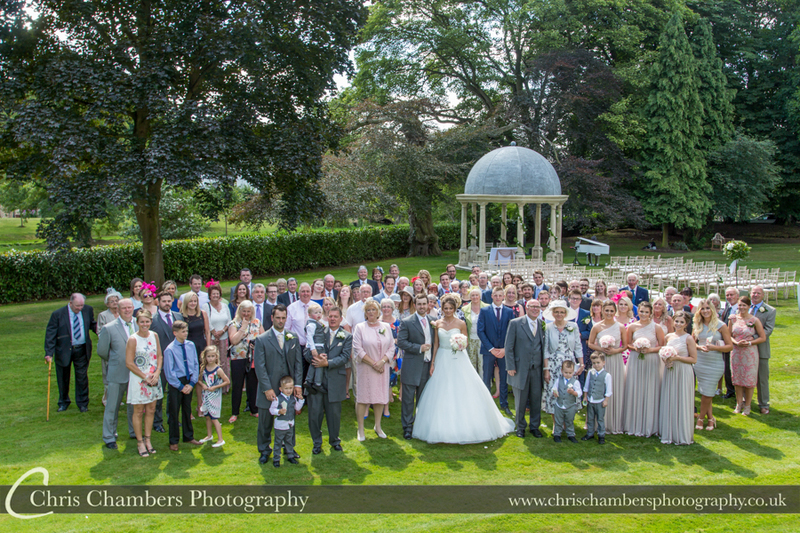 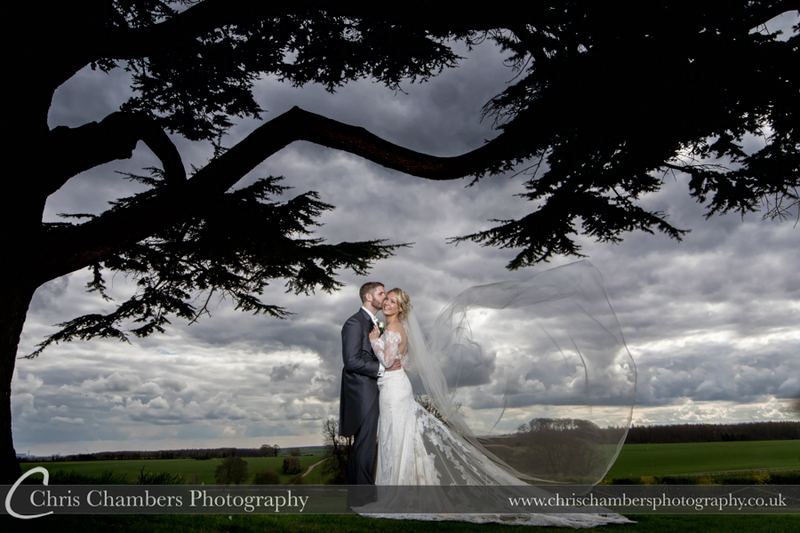 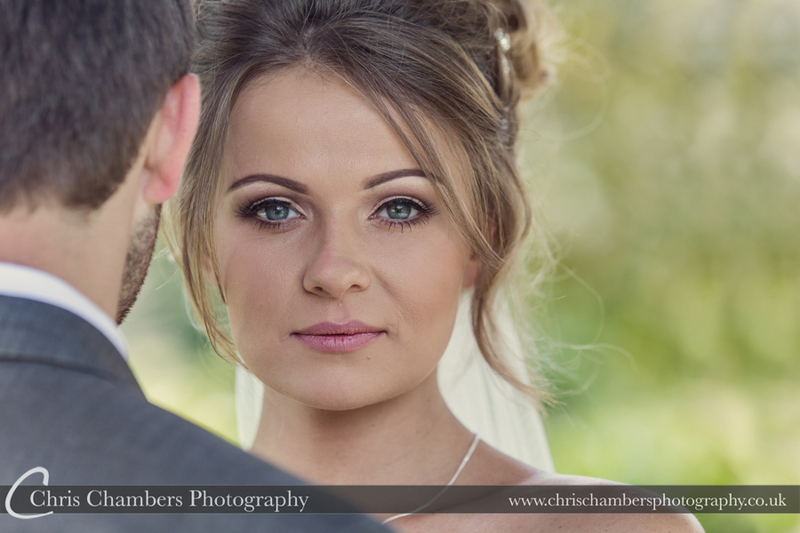 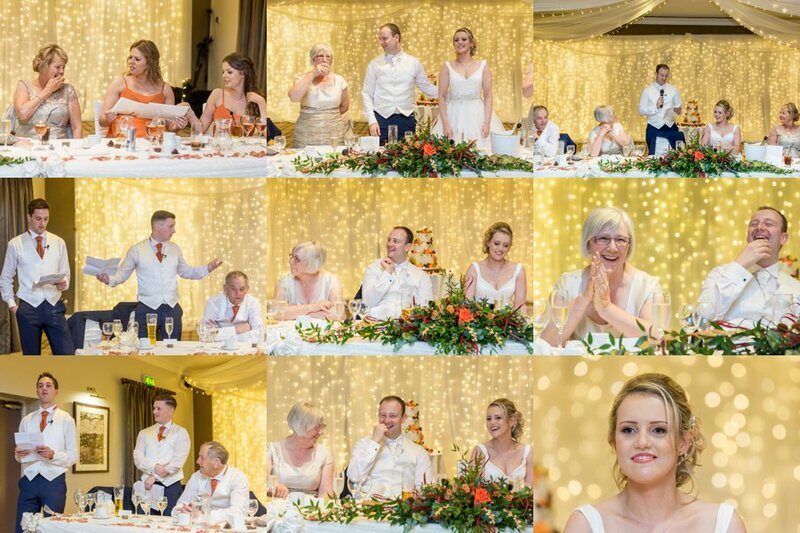 All wedding photographs copyright Chris Chambers Photography. 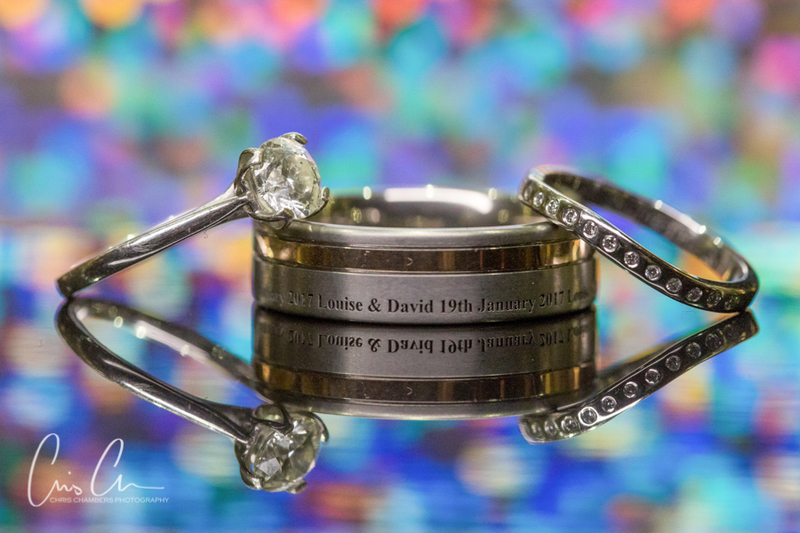 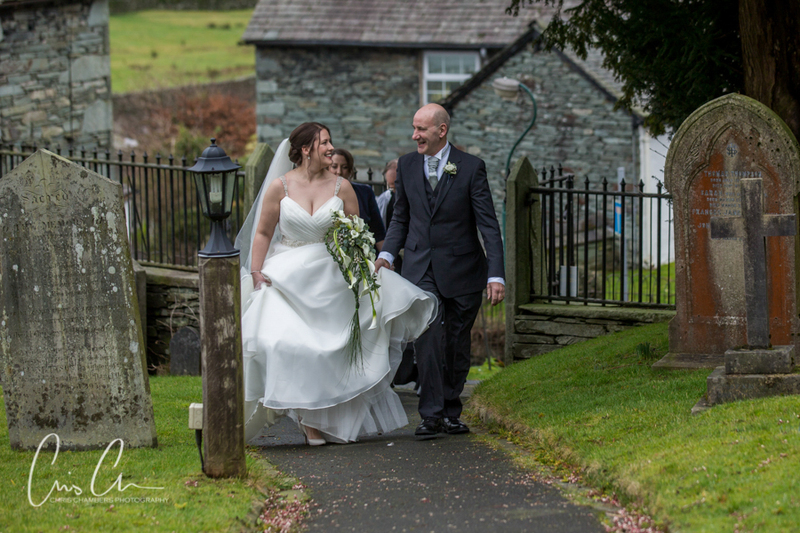 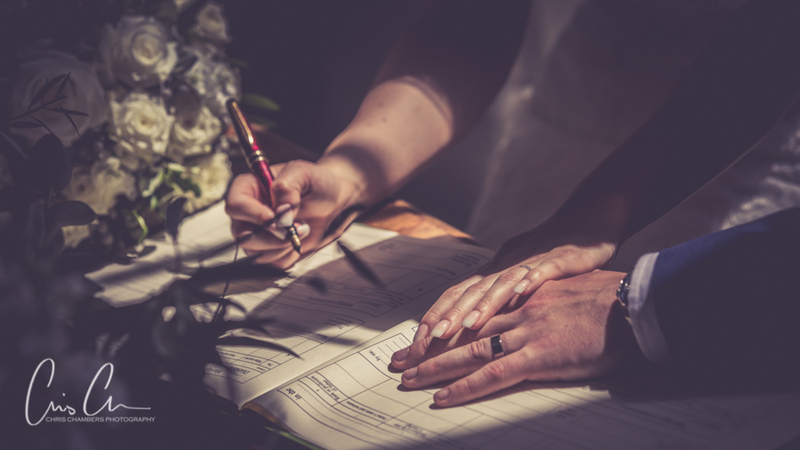 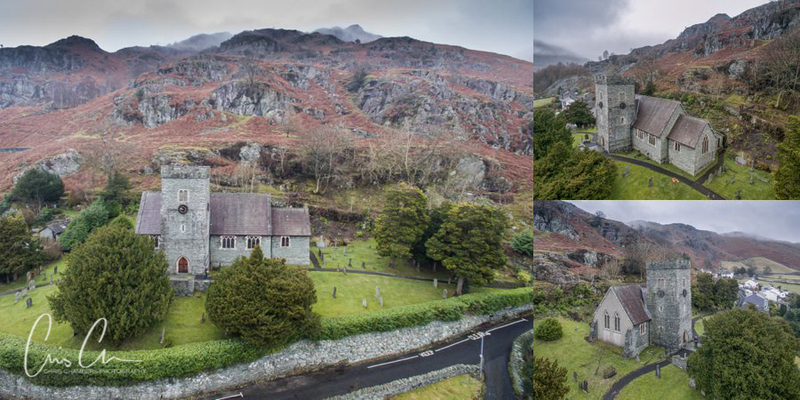 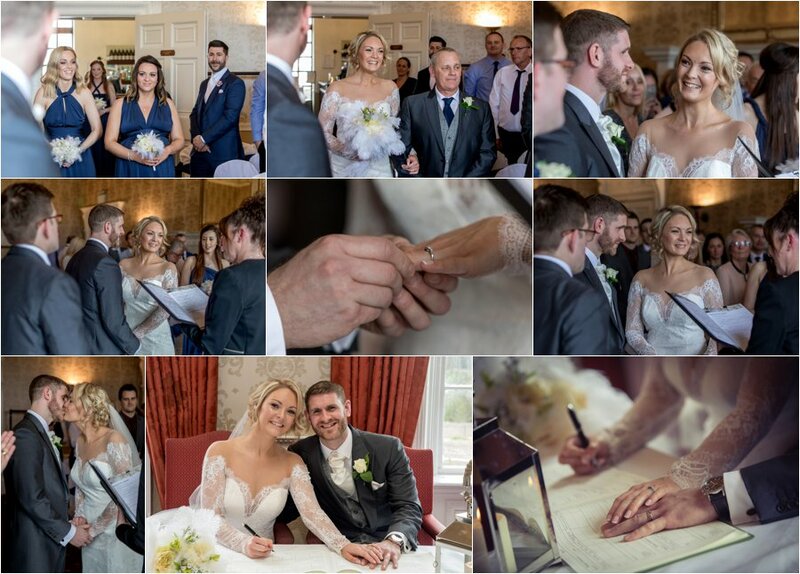 David and louise booked the lovely Langdale Church in Langdale, The Lake District for their wedding and celebrated at the nearby Langdale Hotel and Spa including the boutique hotel within hotel called Brimstone. 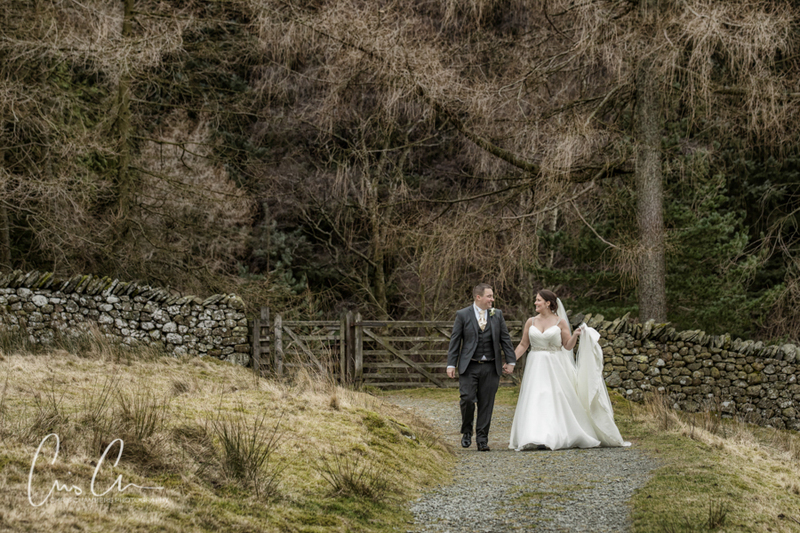 With a church wedding at lunchtime and drinks reception not until four hours later we had plenty of time to explore the Langdales whilst the wedding guests made their way back to the hotel to relax and enjoy the facilities before meeting back for the drinks reception and wedding breakfast. 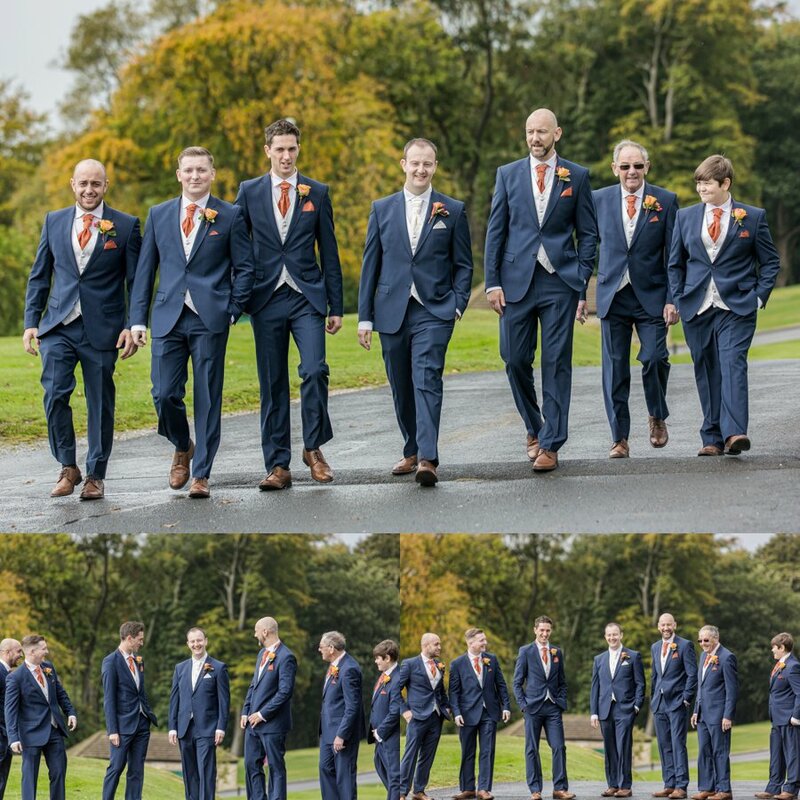 Immediately after the wedding ceremony and group photos myself and assistant Jonny changed out of trouser and smart shoes at the side of the road (it’s quiet out here) , donning jeans and walking boots ready for the photo adventure that lay ahead. 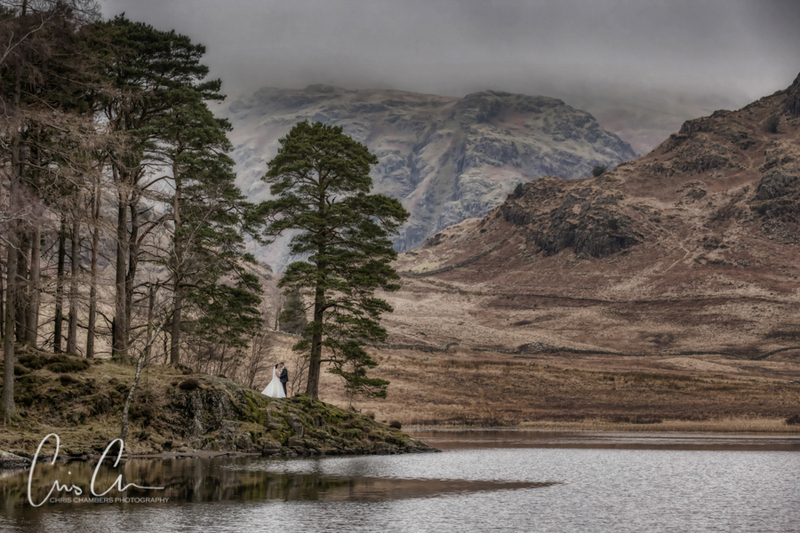 David and louise are keen walkers and more than willing to head off the beaten track to make the most of Blea Tarn and the surrounding hills. 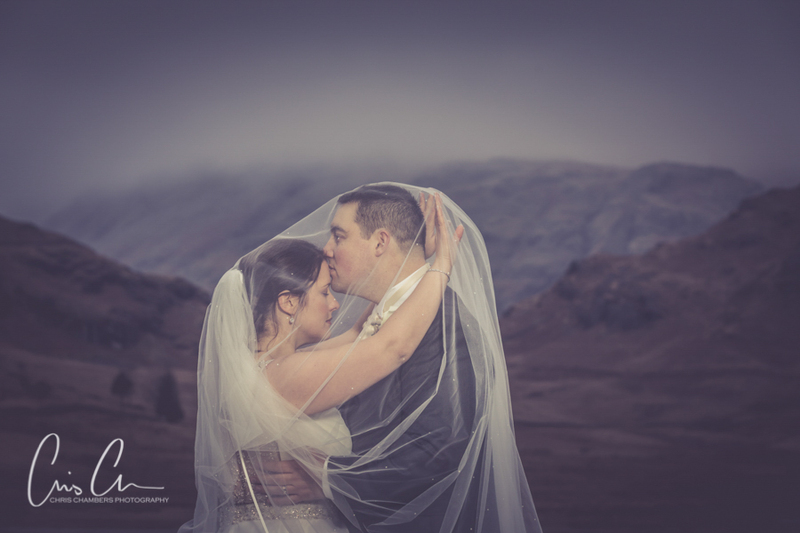 With a relatively calm lake providing reflections, imposing vistas and the peaks of The Langdales in the background it was a wedding photographers dream. 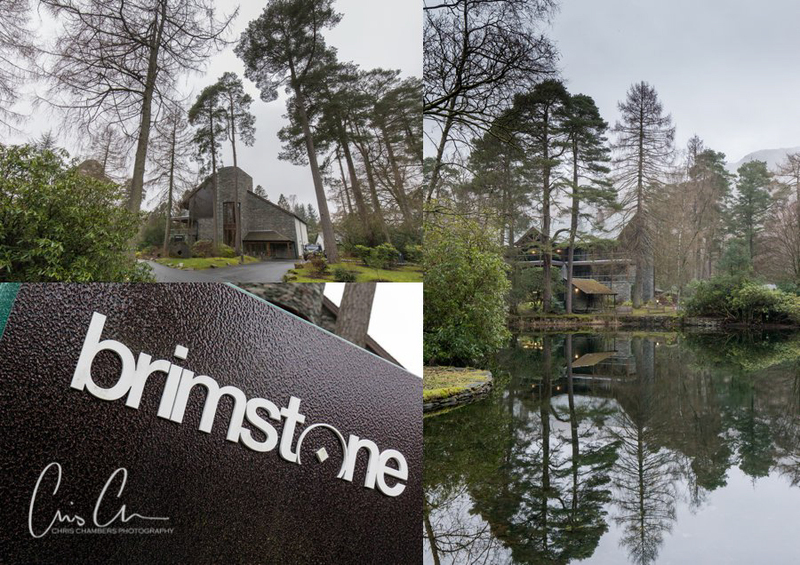 Brimstone is a hotel within a hotel at The Langdale, David and Louise had booked exclusive use of the Brimstone and so were able to plan their wedding day as they required complete with down time mid afternoon for the guests to enjoy the hotels spa and facilities whilst we were out in the hills taking the wedding photographs. 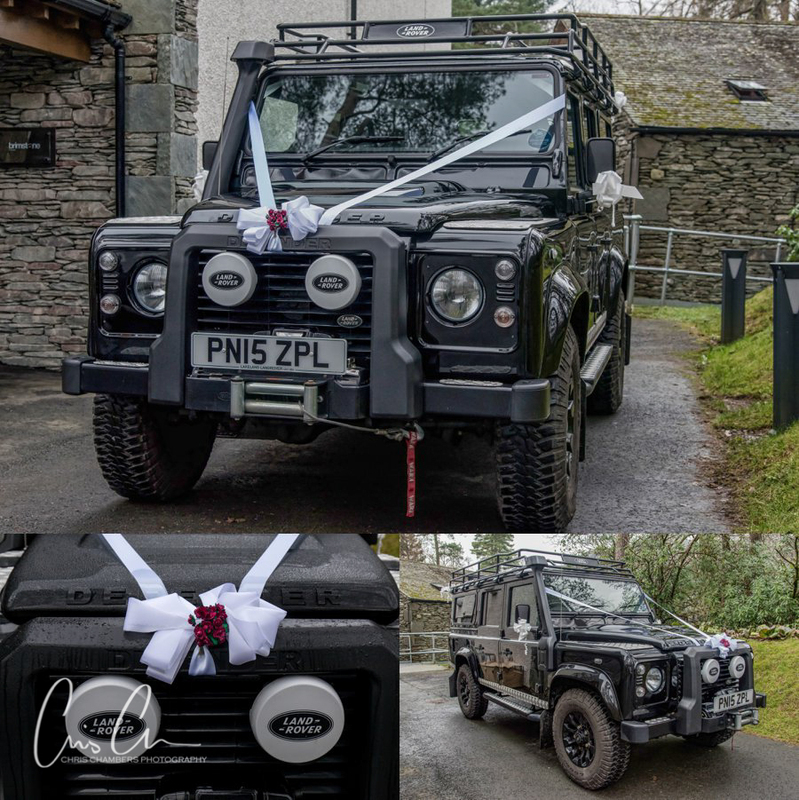 A winter wedding in this remote part of the world could have been made difficult by the weather, to counter this David and Louise had full use the the hotels specially equipped Land Rover for the day. 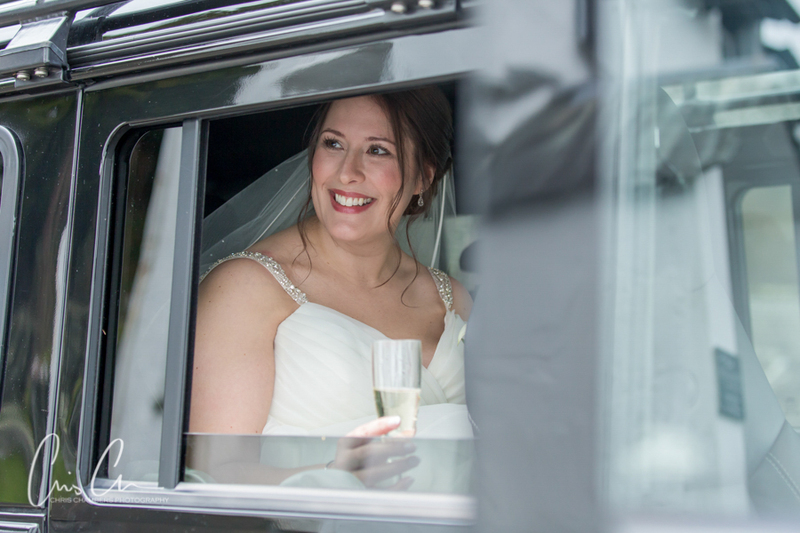 Thankfully the weather played ball and we were able to use our own not quite as spec’d out Land Rover for the photograph session later in the day. 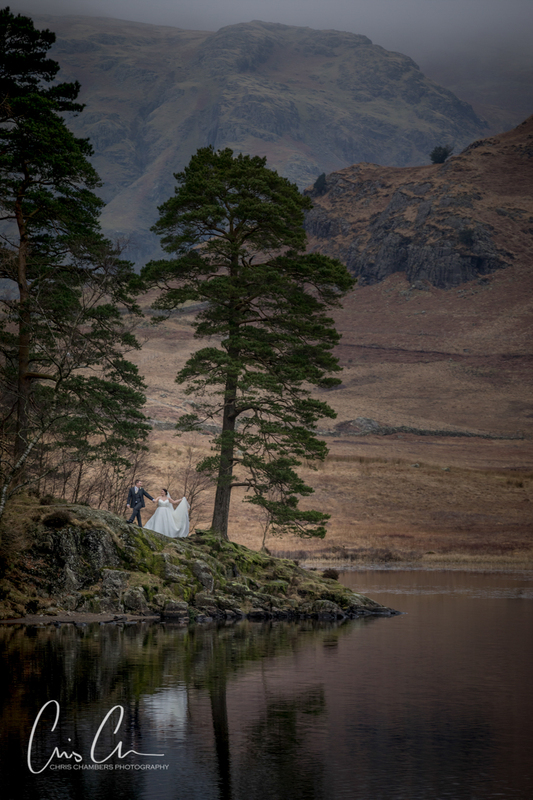 A short drive from the church is Blea Tarn, a landscape photographers mecca and a natural port of call for a stop off for wedding photos. 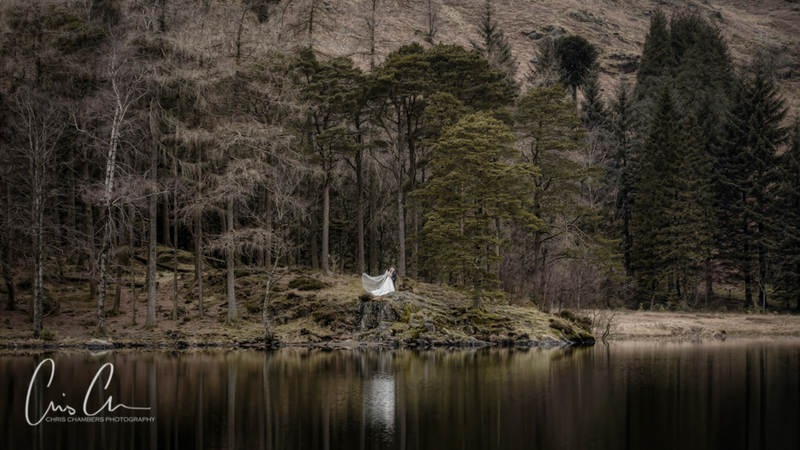 Using walkie talkies and hand signals we were able to create wedding photographs over the tarn, taken from around 400m away. 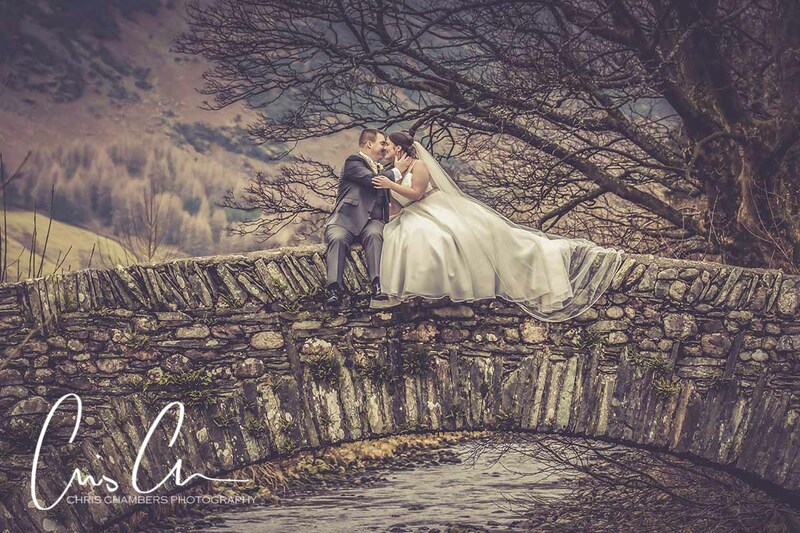 Wedding breakfast in the main Langdale Hotel. 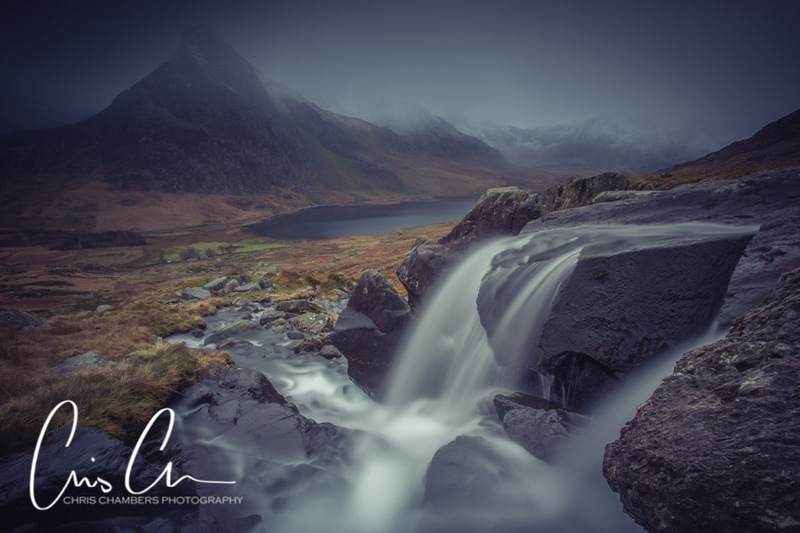 I’ve just returned from a couple of days in North Wales taking landscape photographs around Snowdonia. 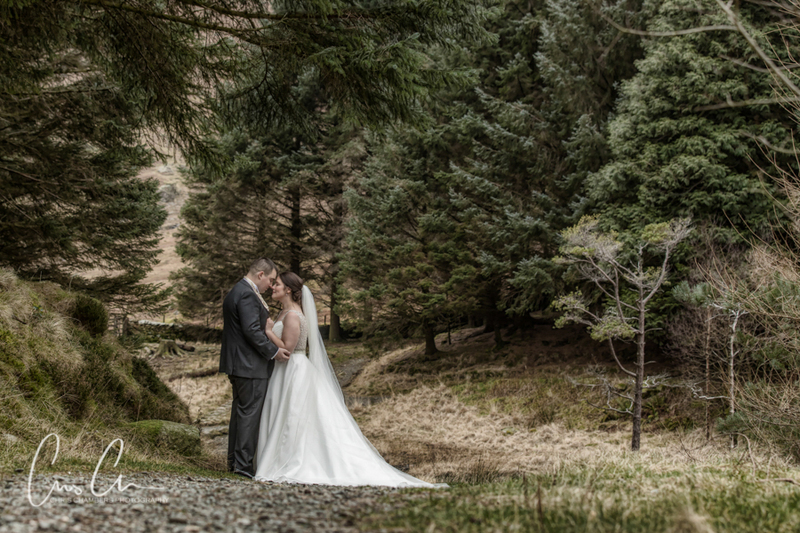 Probably not the best weather with freezing cold blizzards and even a white out as snow overtook the valley. 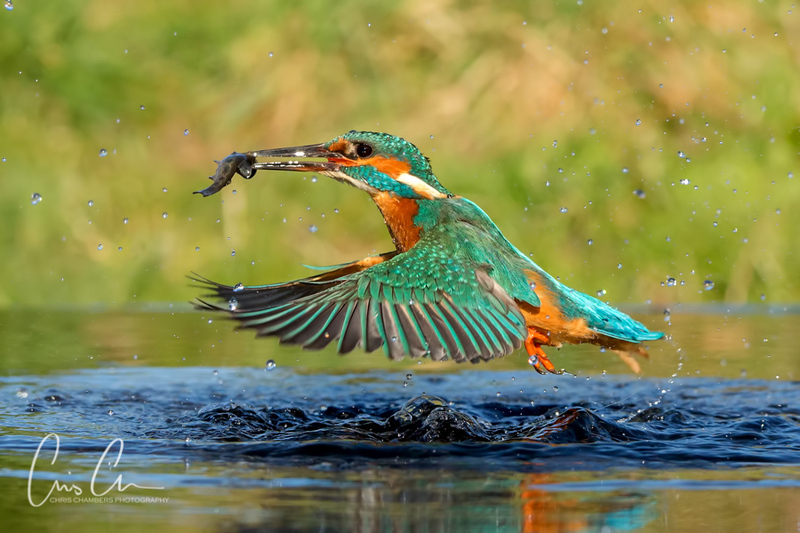 All great fun and a few images for this years competitions. 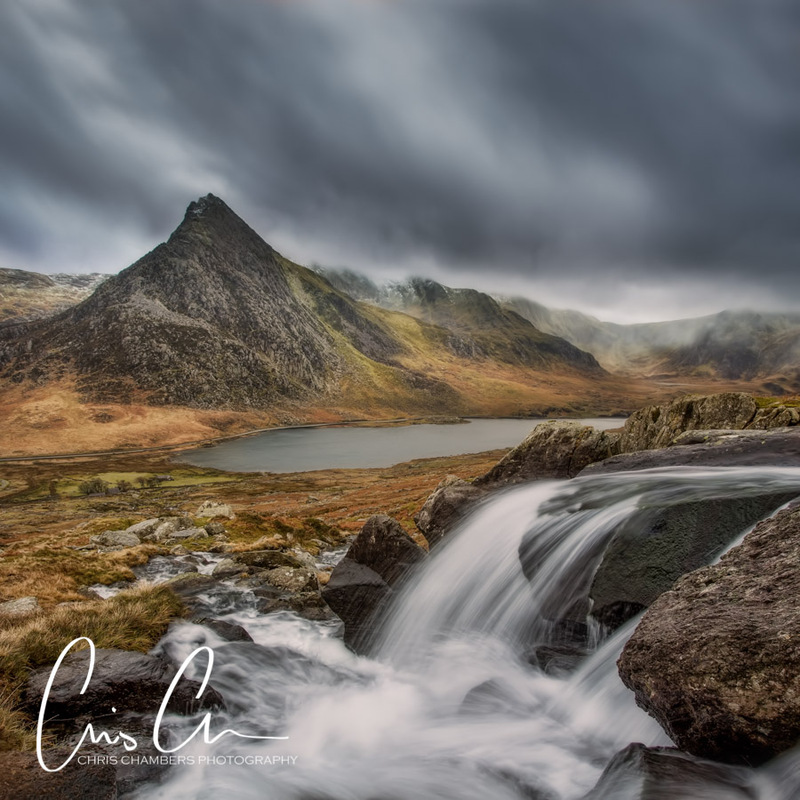 Above: Long exposure of Tryfan and Llyn Ogwen waterfalls Below: a selfie taken around half an hour before as snow rushed down the valley. 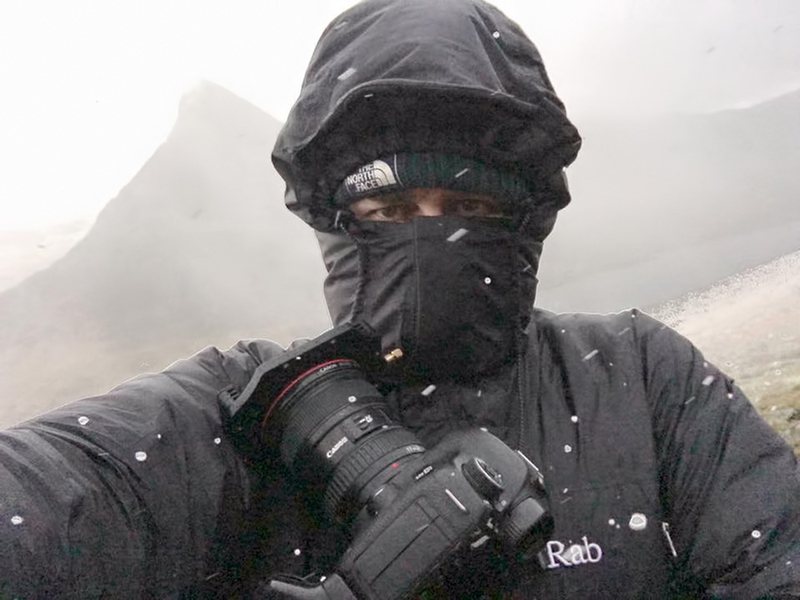 Thanks to Fab and The North Face for protective clothing. 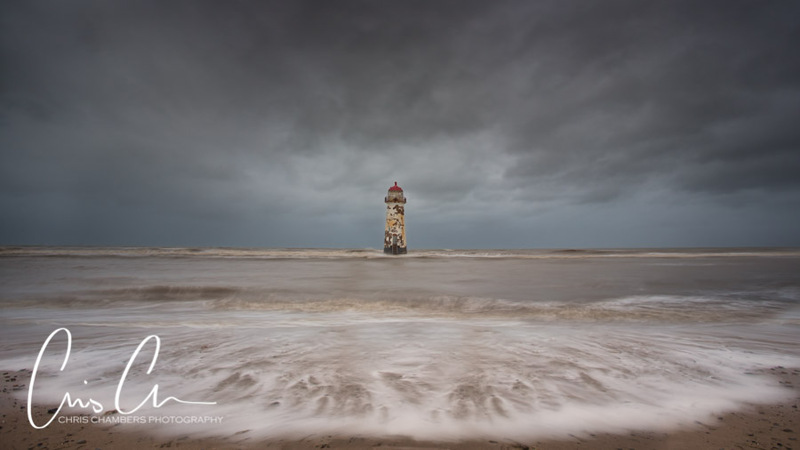 Talacre Lighthouse north of Chester, photographed just after sunrise and again as the tide came in. 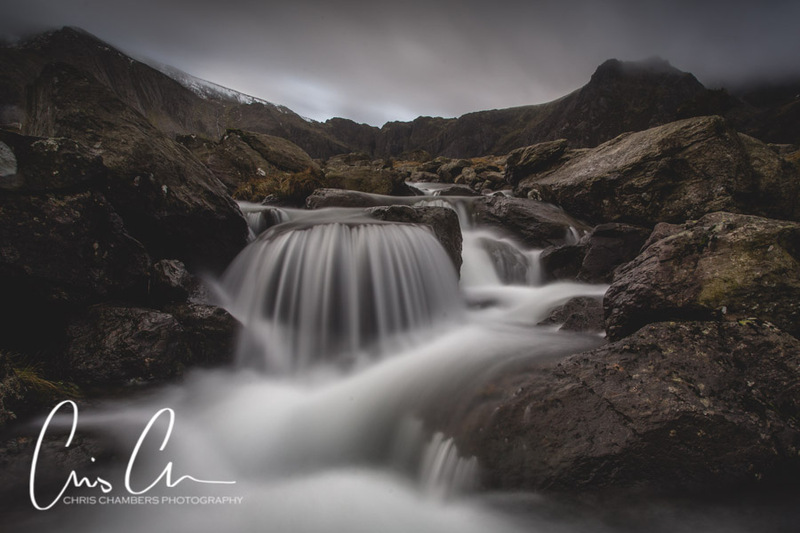 Above and Below : Near Lynn Ogwen and the A5, photos taken just off the path up to Llyn Idwal around ten miles south of Bethesda. 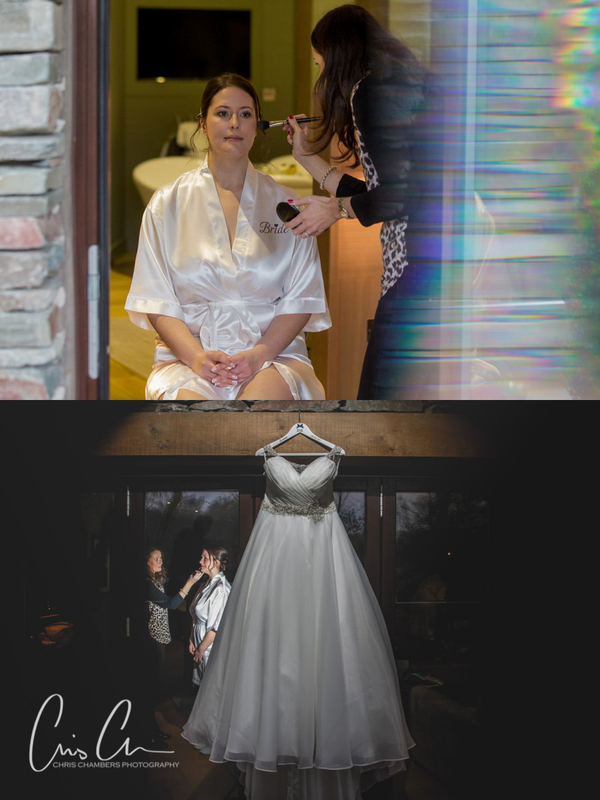 Camera in action. 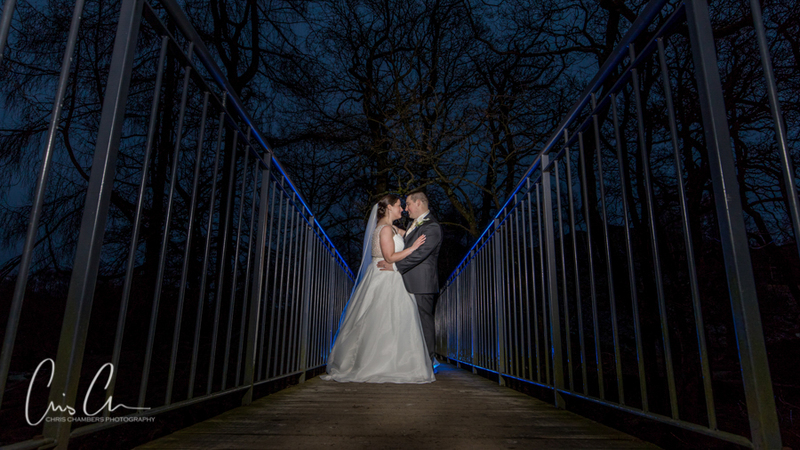 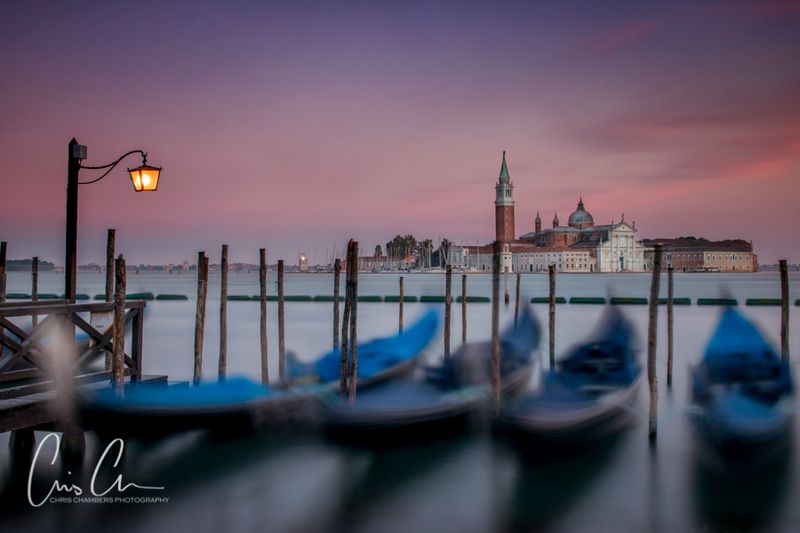 I used a Canon 5D MKIII on a Manfrotto 055 Tripod. 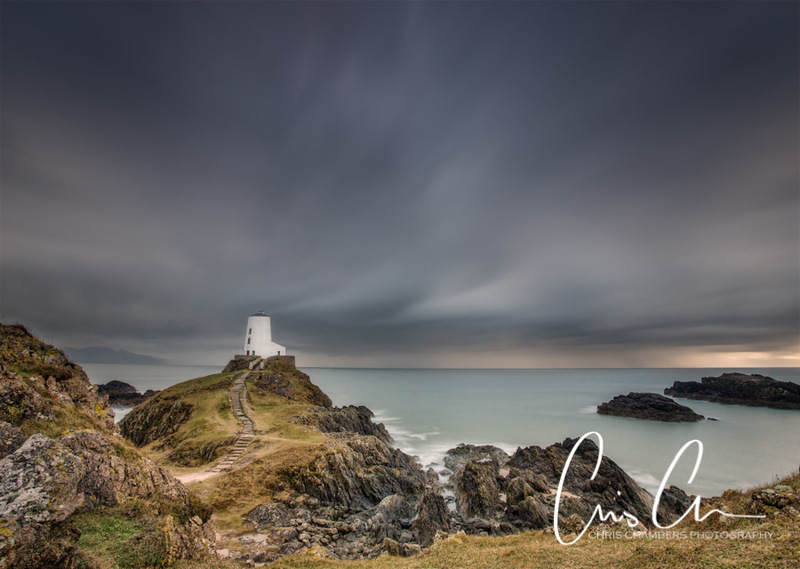 Filters by Lee Filters. 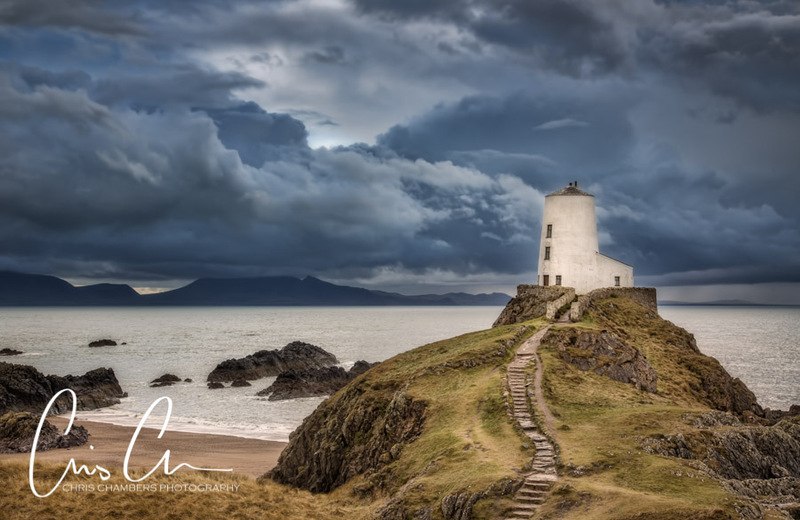 The amazing Llandwyn Lighthouse on Anglesey. 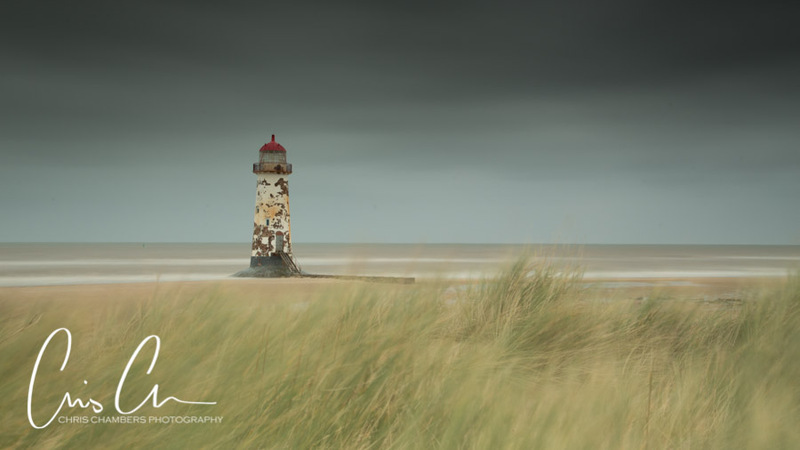 A walk of around a mile across the beach to reach the island and timed with the tide to ensure we didn’t get cut off. 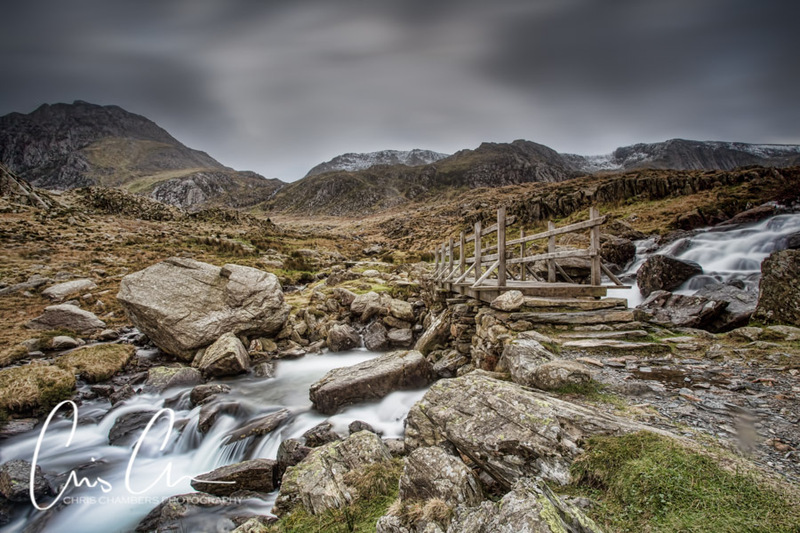 The Waterfalls above Llyn Ogwen again with Tryfan (sharks Fin) in the background.